With the release of our second Broken Chieftain model, we've also updated its unit card in our online Force Builder rules here, finally unveiling the full suite of equipment options that Broken Chieftains have available to them. This article will look to update your Chieftain knowledge, focusing on their two new upgrade options: Customized Weapons and Enhanced Cybernetics. Though Broken Weaponsmiths work tirelessly to keep the weapons of their fighting force repaired and functioning properly, they are also constantly prodded by their Chieftain to find new avenues for how Broken weaponry can be made ever more deadly. In other words, Weaponsmiths, and Broken society in general, are obsessed with making their guns as powerful as possible, regardless of how dangerous this makes them to the wielder. While Broken weapons can never match the accuracy or reliability of the more sophisticated enemy factions they face, the Broken instead rely on a near endless supply of desperate bodies clamoring to get their hands on a customized weapon, even when it is prone to lethal malfunctions. Anytime Broken forces manage to steal, capture or purchase weapons off the black market, a portion of these are tithed to their Chieftain, who turns them over to their Weaponsmith in the name of 'weapons development'. The disassembling, tinkering, and soldering in a Weaponsmith's shop often continues days at a time. No method used to improve a weapon is off the table: overcharged powerpacks, larger caliber ammunition, oversized magazines, fusing multiple weapons together, etc. If it can be dreamed of, a Weaponsmith has attempted it. The more powerful the conversion, the more rare and coveted the weapon is amongst the Broken, and the more likely it will find its way into the hands of a high-ranking individual like a Chieftain, who views it both as a potent weapon and also as a way of reinforcing their status over those they command. All weapons this model is equipped with permanently gain +1 PEN, +1 DAM and the Unstable ability (if they don’t already have it). Grenades & CQ Explosives are excluded. As this upgrade affects any weapon a Chieftain takes (excluding grenades & CQ Explosives, of course), it gives you tremendous versatility towards deciding how you want to improve your Chieftain's shooting. For example, with weapons that provide a lot of shots but are only DAM 1, like a Slug Rifle or Chem Pistol, the Customized Weapon upgrade suddenly turns them into DAM 2 weapons. This means that every successful penetration is going to kill a standard MAS 2 infantry model outright, making these weapons now capable of mowing down enemy rank and file models. On the other hand, weapons that are already DAM 2, like a Beam Pistol or Beam Blastgun, now become DAM 3, allowing the Chieftain to become a big game hunter and seriously wound large models like Hunter Warmechs or Mature Angels. This upgrade also benefits any melee weapons the Chieftain may take, such as a Trophy Melee Weapon, Poisoned Blade and even the melee profile of the Beam Blastgun, turning the Chieftain into a formidable foe at close quarters. Of course, the negative aspect of using customized weapons is that the weapon also gains the Unstable ability, which means that any '1's the Chieftain rolls to hit end up putting suppression tokens onto his unit equal to the DAM of the attack. While this can certainly be annoying when it happens, it is generally a small price to pay to seriously upgrade the offensive capabilities of your Chieftain. This model permanently improves its MAS characteristic by +1. Boosting a model's MAS by +1 provides both defensive and offensive benefits. The most obvious improvement is that a MAS 3 model requires doesn't suffer an injury until at least 3 points of damage are allocated to it. For example, when a Chieftain leads a Broken Rabble squad, whenever there are only two DAM 1 penetrations remaining to be allocated (a frequent occurrence), you can now elect to put them onto the MAS 3 Chieftain, which means instead of losing a Rabble model, the unit will suffer no permanent damage! In other words, having a MAS 3 Chieftain not only means that model is more durable, but any unit the Chieftain joins effectively becomes more durable as well. On the offensive side, a model's MAS characteristic is utilized in close quarters fighting with a melee weapon, both to determine how many shots the melee weapon makes, but also to figure out the PEN characteristic of that weapon. A MAS 3 Chieftain gets to make 5 attacks with a melee weapon (instead of the 4 it makes when it is MAS 2) and all those attacks are made with +1 PEN. For example, a Chieftain with Extensive Cybernetics and a Trophy Melee Weapon gets to attack 5 times in close quarters fighting, with each of those shots being a quite powerful PEN 5 and DAM 2. Even crazier, if the model also has taken the Customized Weapons upgrade, they combo together and those five shots are instead PEN 6 & DAM 3! That's enough potential damage to make any foe quake at the thought of facing a Chieftain in CQ fighting. With these new upgrade options available, a Chieftain is easily the most customizable command model currently in the game. You can go with a super-cheap 7 point Chieftain that just has a couple of pistols, which allows you to fit more Broken units into your force, or alternatively you can take every upgrade and have a 13 point beast that has all kinds of tactical capabilities...the choice is ultimately yours! Ready to try out your own cybernetic Chieftain? You can pick up the new resin Chieftain models along with the rest of the Maelstrom's Edge model range, from the webstore here. 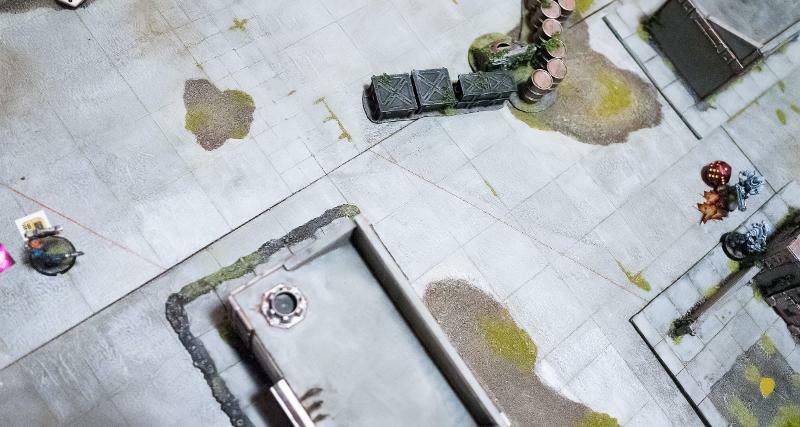 If you have any rules queries, tactics suggestions, or modeling progress to share, you can join in on the Comm Guild Facebook Group page here. A Master Bot Handler is one of the most powerful figures in the Foundation, able to command legions of robotic minions and carry a vast array of weaponry that common soldiers can only dream of. However, this dizzying amount of options can also make deciding exactly how to equip your own Master Handler a bit daunting. Have no fear though! Once you finish with this article, you’ll have all the insider information of what Master Handlers are capable of and know how you’ll want to equip yours. No matter how you choose to equip your Master Handler, you’ll want to be aware that, above all else, they are a force multiplier for Foundation robotic units. So if you’re looking to field a force that has a preponderance of Contractor or SecDef (coming soon!) units, then you might want to instead just stick with taking regular Journeyman Bot Handlers as the Command Model for your detachments. Neural Nodes - Master Handlers are able to take up to 2 Neural Nodes. Each one allows them to issue an order to 1 more unit then they normally would be able to. A Master Handler has a WP of 5, which means, especially later in the game when you have a lot of Command Points available, you can put 5 Command Points onto the Master Handler and with the help of a couple Neural Nodes, be able to issue orders to 5 nearby robotic units (thereby enabling Bot Protocols on all of them). Command Booster Micro Drone - Being able to issue orders to 5 nearby bot units is great, but with a command range of only 18”, you’ll have to keep all those units pretty well clustered around your Master Handler, which is less than ideal. However, Master Handlers are able to take a Command Booster Micro Drone, which increases their command range up to 24”. If you’re looking to make your Master Handler into a true bot commander, then taking a Command Booster allows you to keep your Master Handler back out of harms way while still issuing orders to your bot units that need them. Firefly Defender Drones - In order to get the most out of your Master Handler as a bot commander you’ll want to keep them roughly in the center of your force, within command range of as many of your bot units as possible. Unfortunately, a Master Handler's prickly superior attitude prevents them from joining friendly units, so to keep your Master Handler safe, a great tactic can be to keep him hidden behind a big obstacle or piece of area terrain so that the enemy can't even spot him. 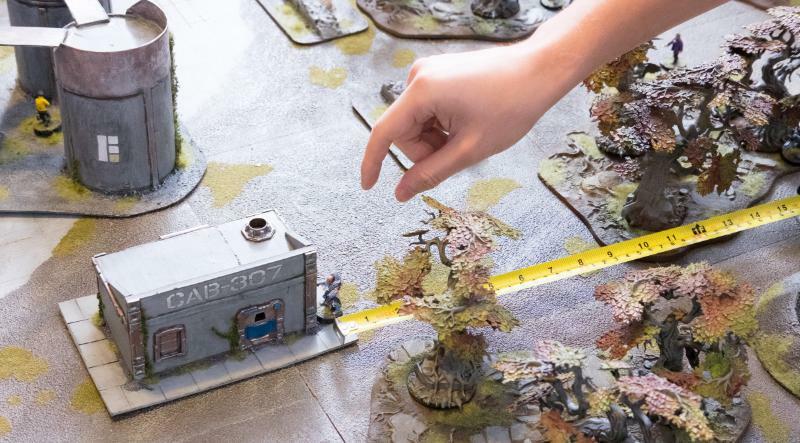 However, a canny opponent might try to counter this by outflanking that terrain in order to get some wide open shots on your Handler. 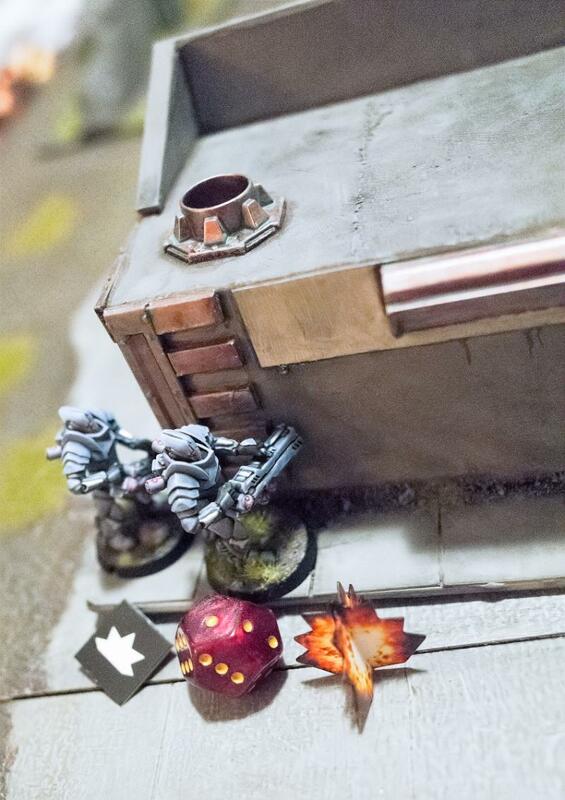 While the Master Handler’s impressive MAS 3 can protect him from a small amount of enemy fire, if the opponent does get a decent-sized unit with open shots on your Master Handler, you're probably going to lose the linchpin of your entire force, and along with it, the game. 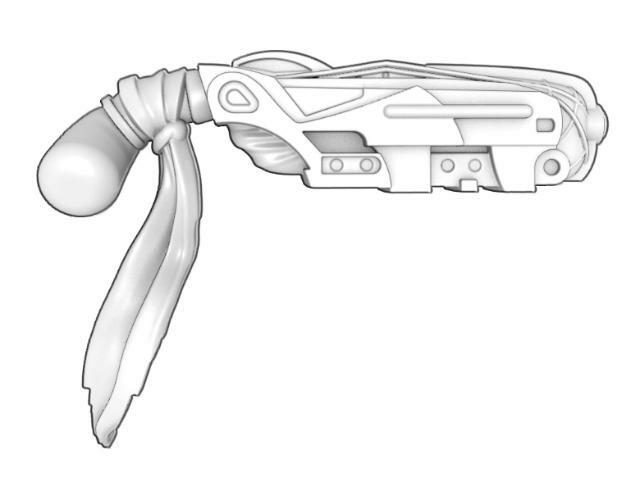 Therefore taking 1-2 Firefly Defender Drones can be a solid idea to help protect your Handler. As long as you enable their Bot Protocols, Firefly Defender Drones grant their unit (including the Master Handler) the Dodge ability equal to the number of Defender Drones in the unit (so 2 Defender Drones means the unit gets the Dodge (2) ability). Cheap Weapons - As your goal will be to keep your bot commander Master Handler hidden from the enemy behind terrain, it doesn't make sense to spend extra points on weapons that will probably never be used. As such, sticking with the 0 point weapons (like a Flakk Gun and/or Repair Claw) is the smart choice for a Master Handler acting as a bot commander. MASTER OF MACHINES This objective may only be utilized if your force contains a Master Bot Handler. If utilized, a Master Bot Handler is automatically your force commander for any objective type that requires one. This objective type can generate a maximum of 3 VPs per game, after which you may no longer utilize the Bot Mastery ability. ----- Partial: (each end phase) If at least one of your Master Bot Handlers is on the table and the Bot Mastery ability was not utilized that turn, gain 1 VP. Full: (end of game) If at least one of your Master Bot Handlers is still on the table, gain all of this objective’s remaining VPs. Bot Mastery: Once per turn, you may automatically enable one of your unit’s bot protocols when that unit is activated (regardless of whether its activation discipline check is successfully passed). You must have at least one Master Bot Handler on the table to utilize this ability. Master Bot Handler - 16 pts. 1 Firefly Defender Drone - 3 pts. 2 Neural Nodes - 2 pts. 2 Flakk Guns - 0 pts. Command Booster Micro Drone - 3 pts. The next major role a Master Handler can fill is one of straight-up shooty death to the enemy. 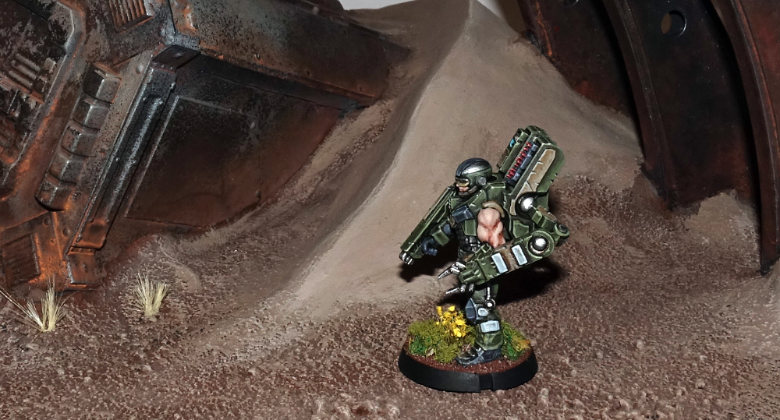 The Master Handler’s powerful exo-skeleton allows them to carry more and heavier guns than any other Foundation infantry model released to date. That means when equipped properly, a Master Handler’s unit can be one the most devastating shooting units in your arsenal. But be warned, this is also the most expensive configuration for a Master Handler. Fire Assist - One very important limitation to be aware of is that, while Master Handlers have the Fire Assist (+1) ability, this only allows them to fire a maximum of 2 weapons during each round of shooting. That means the only reason you’d want to equip your Master Handler with more than 2 weapons is to give you the tactical flexibility to choose the best 2 weapons to fire in any given situation. Cluster Missile Pods - If you’re looking to get maximum firepower out of your Master Handler, then taking 2 linked Cluster Missile Pods is definitely the way to go. Linked weapons add +1 to the number of shots the weapon normally is able to fire (and also only count as a single weapon being fired). So if you can manage to find a target where you're able to cover 3 models with the Cluster Missile Pod's AoE template, then you’re looking at getting to fire 5 shots, plus any 6’s you manage to roll count as 2 hits instead of 1! Arm-mounted Weapons- For a gun heavy Master Handler, you really can’t go wrong with any of the arm-mounted ranged weapon options. However, you do want to pick weapons whose range and weapon profile are a good match to be fired alongside the linked Cluster Missile Pods. The Cutter Light Machine Gun is the obvious choice. A Flakk Gun can be a great choice for your second arm-mounted weapon because it is 0 points and is useful to fire instead of the Cutter when your Master Handler happens to find themselves in an up close and personal situation with the enemy. The Drone Class Laser System (DCLS) is a fine choice to take instead of a Cutter if you desire, providing your Handler with the absolute maximum number of shots possible (albeit with a PEN of only 1), that pair nicely with the shooting of the Firefly Defender Drones that are part of the unit. Firefly Defender Drones - While Defender Drones are great at keeping the Master Handler protected from enemy fire, they are also all equipped with a DCLS as well, which means when you take a full squad of 4 of them and combine their firepower with that of the Master Handler, you can obliterate almost any enemy light infantry unit right off the table, regardless of whether they’re in cover or not! Aerial Drone Strike - One thing that should never be forgotten is that the Master Handler also has an Aerial Drone Strike: a one-time use, incredibly powerful area effect weapon. Best of all, using an Aerial Drone Strike just counts as firing a single weapon, which means the Master Handler can fire the Aerial Drone Strike and also fire another weapon at the same time (including his linked Cluster Missile Pods, for example), and all of this gets combined with the shooting of his Defender Drones as well! Aerial Uplink & Targeting Micro Drones - There are two great Micro Drone options for your gun heavy Master Handler. The Aerial Uplink Drone allows the Master Handler to fire his Aerial Drone Strike two times during the game, instead of just once, which is great for obvious reasons. An even better fit is the Targeting Drone. This gives the Master Handler and all of his Defender Drones +3 SKL when shooting (except during close quarters fighting), which unsurprisingly ups the deadliness of their combined firepower to near obscene levels. 4 Firefly Defender Drones - 12 pts. 2 linked Cluster Missile Pods - 4 pts. 1 Cutter Light Machine Gun & 1 Flakk Gun - 1 pt. Targeting Micro Drone - 2 pts. While the bot commander and gun heavy roles for the Master Handler are fairly straightforward and easy to define, you can also mix and match different aspects of these roles a bit to create something unique for your Master Handler. 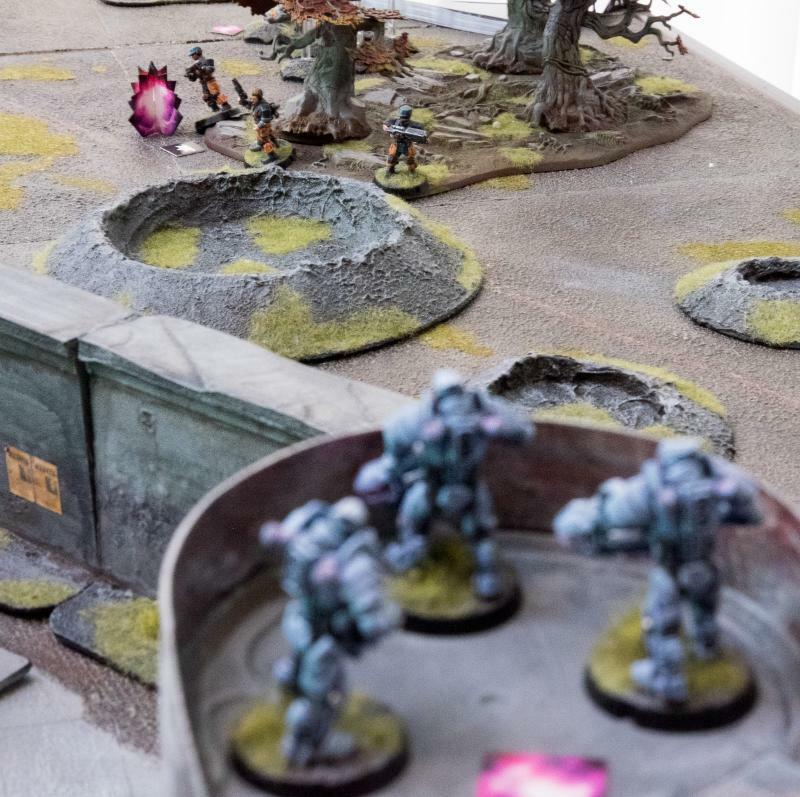 In addition, the inclusion of a Repair Claw allows a Master Handler to perform yet another role: that of helping to remove suppression from nearby bot units. Repair Claw - Giving your Master Handler a Repair Claw can be a great choice, not only because it is 0 points, but also because it gives the Handler the Bot Repairs (2D3) ability. 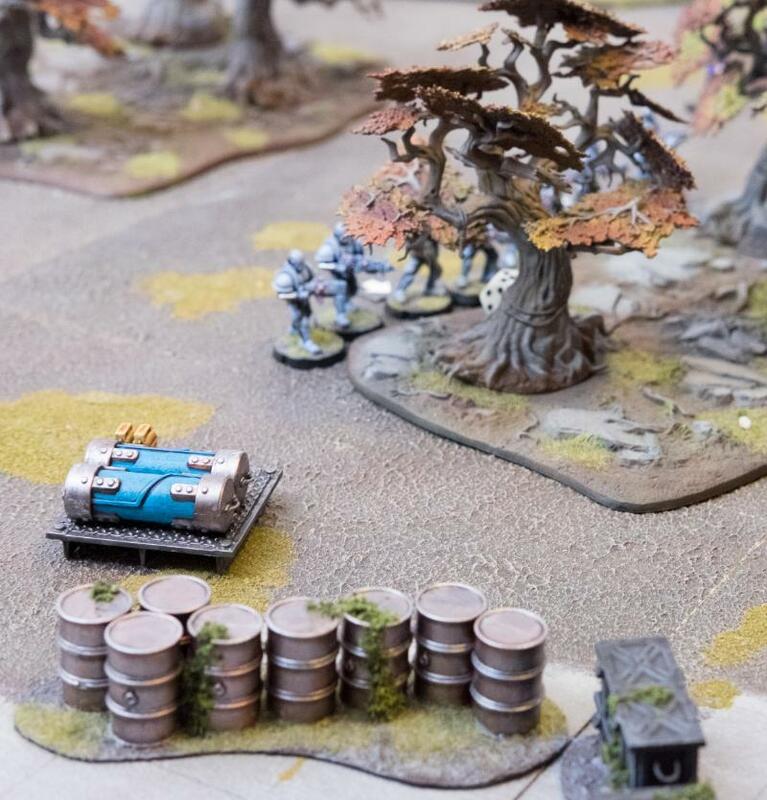 This means that whenever the Handler finishes an Advance & Fire or Dash action within 6” of another friendly bot unit, he can remove 2D3 suppression tokens (STs) from them, turning him into an excellent support unit (Note that you cannot use this ability on the Bot Handler’s own unit though). Considering that you'll be keeping your Handler near your bot units to help enable their Bot Protocols, you will often find him within range to perform these types of repairs. You can also consider giving your Handler 2 Repair Claws. While this doesn’t allow him to remove any additional STs from friendly units, it does turn him into quite the close quarters (CQ) powerhouse. Since the Handler is able to fire 2 weapons per round of shooting (which includes CQ fighting), this allows him to use both of his Repair Claws to their full effect. That’s a total of 8, PEN 4 shots during CQ fighting (on top of any shots generated by his Defender Drones) which ain’t too shabby! Be warned that the Master Handler is a pretty slow mover so it can be a bit tough to get him into CQ fighting, but once there, he’ll certainly be able to cause some significant damage. Firefly Defender Drones - Whether you’re running your Master Handler next to your bot units to remove STs from them, or trying to charge into CQ fighting, either way you’ll definitely need to protect your Handler with at least 2, it not the max of 4 Defender Drones to dissuade the enemy from picking him off and to soak up the inevitable defensive fire he takes from the enemy. 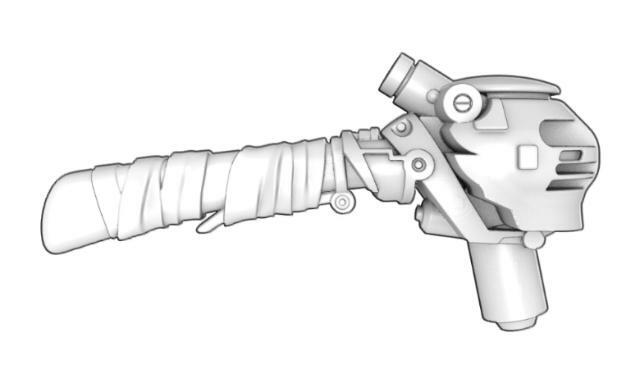 Flakk Gun - If you’re taking 1 repair claw on your support Handler, then the obvious weapon to pair with that is the Flakk Gun, which excels at short range shooting. Since a support/melee Handler will often find himself near the enemy (when removing STs from your bot units and/or running around trying to get into CQ fighting) having a powerful short ranged weapon is a great choice. 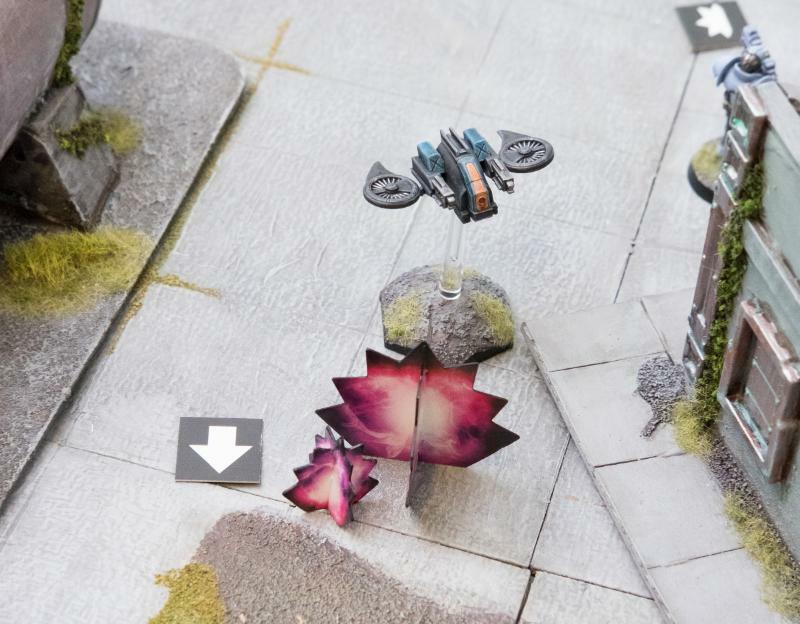 Aerial Uplink & Defense Micro Drones - While there isn’t one Micro Drone choice that really excels for a Master Handler in a support role, the Aerial Uplink Drone is a solid pick. Because you likely won’t have the great firepower of a gun heavy build, being able to unleash an Aerial Drone Strike twice during the game can be quite useful. On the other hand, the Defense Drone is perfect for the Handler that is trying to get into CQ fighting. Sure it's a one-use item, but it’s 0 points, and for the turn it's used the Handler gets the Field (2) ability (great for when his Defender Drones have been destroyed) and makes him an absolute melee monster. Plus, because the Handler can fire 2 weapons, he’s able to use the Defender Drones melee profile as well as one Repair Claw in CQ fighting! 2 Firefly Defender Drones - 6 pts. 1 Cluster Missile Pod & 1 Neural Node - 4 pts. 1 Flakk Gun & 1 Repair Claw - 0 pts. Aerial Uplink Micro Drone - 2 pts. 2 Repair Claws - 0 pts. Defense Micro Drone - 0 pts. How will you use your Master Handlers? To share your tactics or modeling ideas, or to discuss the loadouts described above or any other aspect of the Maelstrom's Edge game, visit the Comm Guild Facebook page. You can find the Epirian Master Bot Handler, along with the rest of the Maelstrom's Edge model range, in the webstore here! In a previous article, we talked a bit about the weaponry the Broken favor, namely that they like to customize and overcharge their weapons to make them deadlier, even when doing so means that they have a tendency to break down, overheat or even explode! 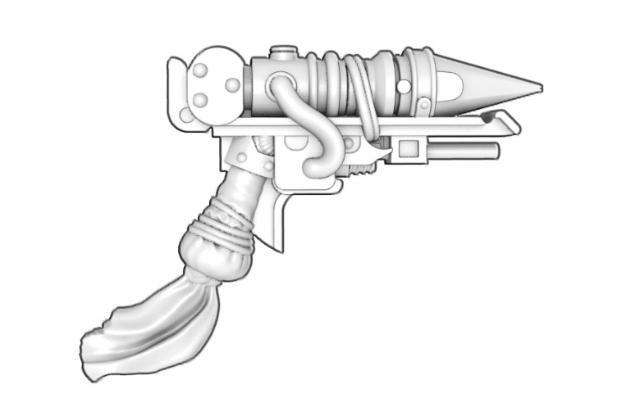 Today we're going to take a closer look at the different classes of weapons that you'll find on the Broken Rabble sprue. 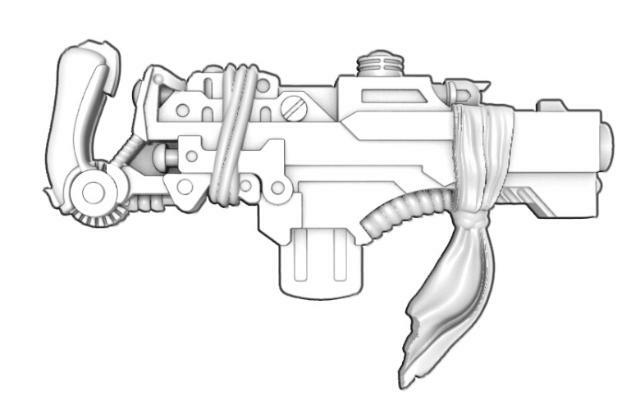 The most commonly found type of ranged weapon throughout the spiral arm, slug weapons are cheap to produce and easy to maintain, making them the workhorse of the Broken armory. Broken tend to favor slug weapons with a high rate of fire, even though their ability to penetrate armor isn’t very good. An Auto Slugger starts life as a 'liberated' Epirian Foundation Maglock Assault Rifle. However, as the Broken can't easily replicate the Foundation's caseless Maglock ammunition, their weaponsmiths instead convert its chassis to fire a smaller, jacketed round. This conversion creates a weapon that has a much higher rate of fire but unfortunately a lot more recoil. The Broken have a long history of weaponizing lasers, converting them from a wide-range of industrial applications. Invariably, Broken weaponsmiths set the damage output for these weapons at their absolute maximum, firing short, but incredibly powerful beams capable of melting through even the toughest enemy armor. However, this also makes the weapon highly unstable: prone to overheating, shorting out and on occasion, bursting into flames. Beam Blastguns are sturdy and incorporate a blade at the tip of their barrel, making them double as perfect melee weapons for close-quarters fighting. Combustible liquids are quite easy to find and manufacture, providing the Broken with weaponry even when supplies of more traditional ammunition are running low. Torch weapons are also the perfect fit for short-ranged firefights, precisely how the Broken prefer to face their foes. Many cultures in the spiral arm refuse to utilize chemical weapons, deeming them morally repugnant or abiding by longstanding, often totally outdated, treaties that ban their use outright. The Broken have no such qualms, and the relative ease with which the components to concoct chemical weapons can be found amongst the black markets makes them a popular choice. Chem Launchers hurl a small pellet, smashing open upon impact and spraying the area with a lethal combination of liquid acid and a potent airborne poison. However, as most Broken aren't equipped with any kind breathing protection, these poisons are designed to disperse incredibly quickly, affecting only a small targeted area. Broken weaponsmiths are renowned for making weapons out of junk that other factions would never dream of using. One example is the EMP Harpoon, which utilises gas-powered harpoons, each with a ‘liberated’ Epirian Foundation EMP charge housed inside, perfect for penetrating fields and pulling the enemy out from cover. Plastex is an incredibly sticky industrial adhesive used in construction by the Foundation. 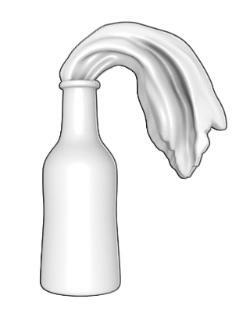 The Broken use this substance to make their glue weapons, which can completely incapacitate their targets in a messy goo. 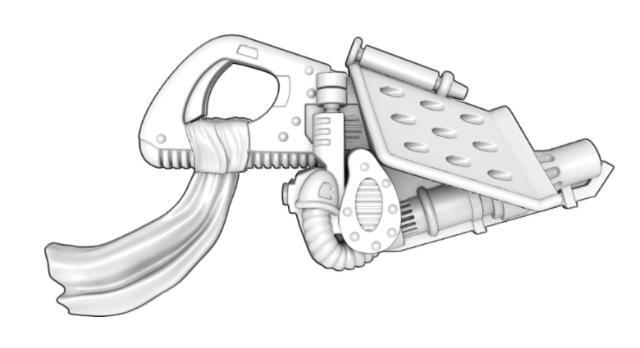 Unfortunately, Plastex is not designed to be deployed so rapidly, meaning glue weapons often jam or misfire, splattering their operator or those Broken unfortunate to be around them. 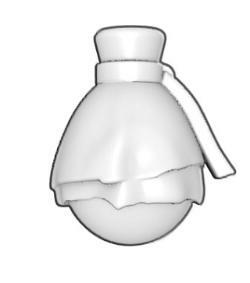 The Broken favor simple weapons that are easy to procure, and their choice of grenades is no different. 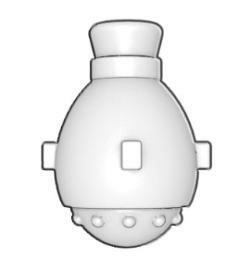 Cluster grenades are the most common anti-personnel grenade in the spiral arm and any military shipment or installation the Broken manage to raid invariably provides them with crates of cluster grenades. Molotov bombs are handmade explosives created simply by filling a common container full of combustible liquid. Overcharged powercells are standard-issue batteries used throughout the spiral arm for portable power, but which are set to dangerous levels, causing them to detonate with frightening power. The Forsaken - The most common type of Broken, these are the general bunch of rag-tag survivors who turn to piracy throughout the Maelstrom's Edge simply as a means to survive. The Forsaken have a strong moral code, and see themselves as better than the rest of the spiral arm that has cast them out, therefore they attack only out of necessity. Of the different Broken sub-factions, the Forsaken tend to have a slightly higher level of technology, as their societies provide a good refuge for outcast Weaponsmiths looking to ply their trade. Jackals - Bands of despots and marauders, who look only to further their own interests in a galaxy gone mad. Believing that might is always right, Jackals will attack anyone and take everything they can manage to steal. Jackals live for the glory of combat, and usually go to war hopped up on a potent cocktail of combat drugs that makes them all but impervious to minor flesh wounds. Sociopaths and criminals filter in from across the spiral arm towards the Maelstrom's Edge in order to join some of the more famous Jackal hordes. Spiral Arm Revolutionary Army - The SARA are Broken who have banded together to overthrow those they see as corrupt regimes and corporations who have failed the common man by leaving billions behind to die by the Maelstrom. SARA is more regimented and militaristic than other Broken societies, usually founded by former military who rebelled and fled when they discovered that their government didn't actually have any plans to save them from the Maelstrom. Despite being labeled as terrorists, SARA cells receive funding and equipment from secret benefactors sympathetic to their cause. SARA regularly utilizes counterinsurgency and propaganda as weapons, and like the Jackals, they get a steady stream of recruits from throughout the spiral arm who believe that humanity should be doing more to save itself from the plight of the Maelstrom. So how will these sub-factions actually work in the game? You'll essentially choose which sub-faction you're fielding based on which command unit(s) you decide to take in your force. So if you chose to take Forsaken command units, then you'd have a Forsaken force and you wouldn't be able to include any Jackal or SARA command units as part of the same force. Naturally, dependent on which sub-faction you use, you'll get different abilities and bonuses for your units. But beyond the command units that are dedicated to a particular sub-faction, all of the other Broken units we make will be playable in any type of Broken force. 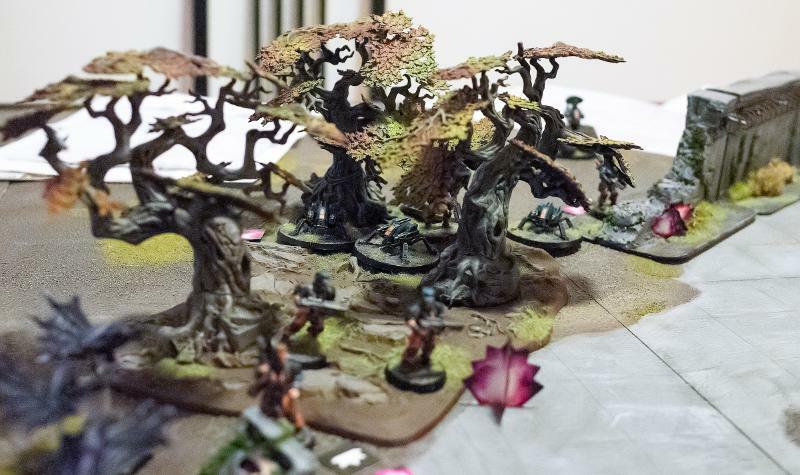 During its main action, this model may expend one of its allocated command points to trigger a booby trap, up to a maximum of (X) times per turn. When a booby trap is triggered, select an enemy unit which is both taking cover and visible to the model triggering it. That unit gains D3+1 STs. A single enemy unit cannot be affected by more than one booby trap per turn. This ability is great because it can be used exactly when and where it will be most helpful to you. Got an enemy unit that is teetering on the edge of being shell-shocked? Hit them with a booby trap. Got an enemy unit that's got absolutely no suppression on it? Nail them with a booby trap to at least force them to take a discipline check when activating. Sure, it costs a command point to trigger a booby trap, but its the kind of ability that can change the course of a battle when used smartly. For each model with this ability, one additional friendly unit can utilize the Shadow StrIke ability in each end phase (instead of just 1 unit) and during deployment, an additional friendly unit in reserve can be declared as arriving via Shadow Strike (instead of just 1 unit). In addition, a friendly unit within 18” of a model with this ability automatically passes its shadow strike discipline check, unless the unit is shell-shocked. This really is the defining ability of the Forsaken, as it allows them to utilize Shadow Strike on multiple units per turn. So if you have 2 Chieftains in your force, that means you could use Shadow Strike on 3 of your units per turn. 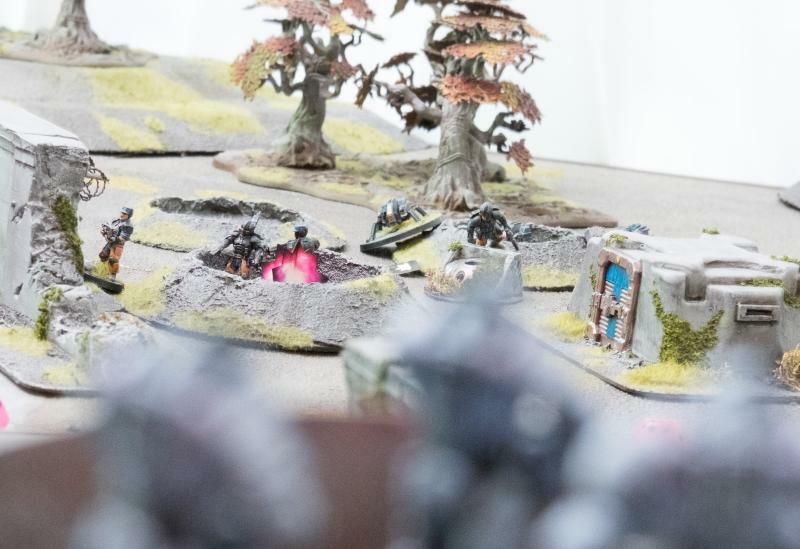 That opens up all kinds of tactical options unavailable to other factions, such as being able to suddenly put several of your units right into the enemy's vulnerable rear arcs, or to redeploy several of your units onto objective markers that are on the far side of the table. Partial: (each end phase) This turn, if at least one of your units was put into reserve via shadow strike and the now you don’t ability was not utilized at all, gain 1 VP. 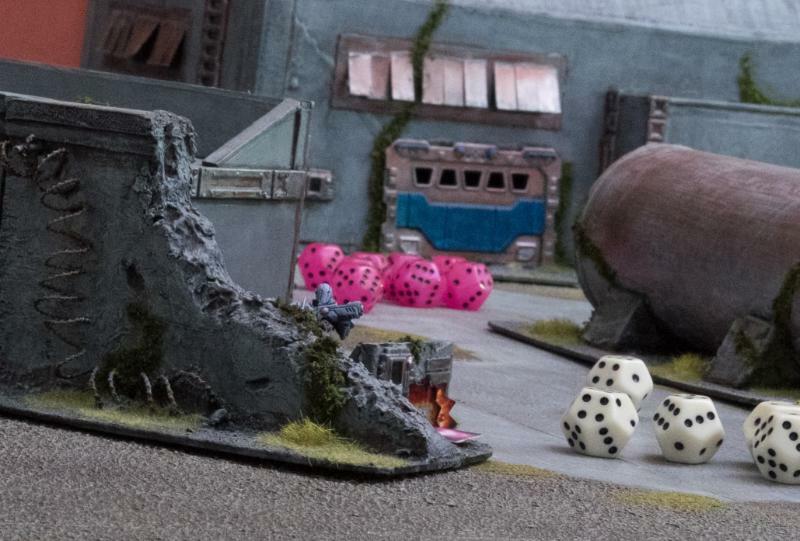 Full: (end of game) If at least one of your models on the table has the Forsaken designator, gain all of this objective’s remaining VPs. 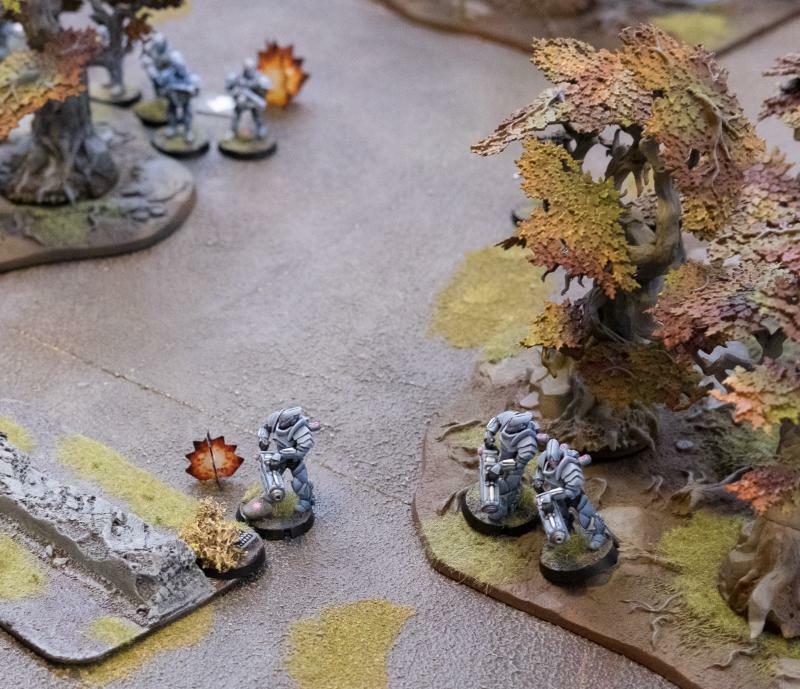 Now You Don’t: Once per turn, when you remove one of your units from the table via shadow strike, you may either immediately remove 3D3 STs from it, or return 1 model back to the unit that had previously been removed as a casualty. This objective at its base level just rewards a Forsaken force with Victory Points for using Shadow Strike on at least 1 of its units per turn. But if you don't really need to gain a Victory Point on a particular turn, you can instead cash that Victory Point in for two really amazing options: either removing 3D3 suppression from a unit, or returning a model killed previously in the battle back into the unit. So say your opponent has spent the entire turn pounding on one of your key units, building up a ton of suppression on it. In the end phase of that turn, if the unit is within 18" of a Chieftain, you can automatically remove it from the table (without having to take a discipline check thanks to the Chieftain's Shadow Master ability), get rid of 3D3 suppression and then next turn you'll be able to put that unit back anywhere on the table that is in cover and more than 12" from the enemy...not too shabby! When the time comes for us to release Jackal and SARA command units, we'll talk more about how those forces from those sub-factions will fight. 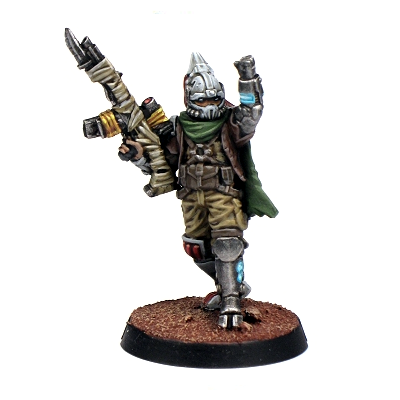 Until then, if the imagery/theme of the Jackals/SARA sub-faction appeals to you right off the bat, you should feel free to paint/convert your models into those themes, as all you'll need to do to change your force from one sub-faction to another is to take a different command unit. 'The Broken' Rules - Part 1: What Else is Coming? If you haven't checked out the rules for our new Broken units yet, you can find them here. There's both unit cards and also a summary PDF that contains all the necessary info regarding the Broken's weapons, abilities and equipment. The Broken represent a departure from how our previous two factions, the Epirian Foundation and the Karist Enclave, were developed. In the case of those two, upfront we had a solid road map of all of the units that were going to be included in the starter set, so we knew there was enough unit variety right out of the gate for a player to comfortably field an entire force. However, for the Broken, it become apparent that the basic Rabble infantry kit was going to be finished before any other models in the range, so the question then became: Do we sit on this infantry kit for several months in order to build up enough different types of Broken units to have more of a 'full faction' release, or do we instead release the kit as soon as we can, and just fill in the rest of the range as other models are finished being designed/sculpted? Once we saw how amazing the Broken Rabble kit turned out in its final form, the choice was easy. 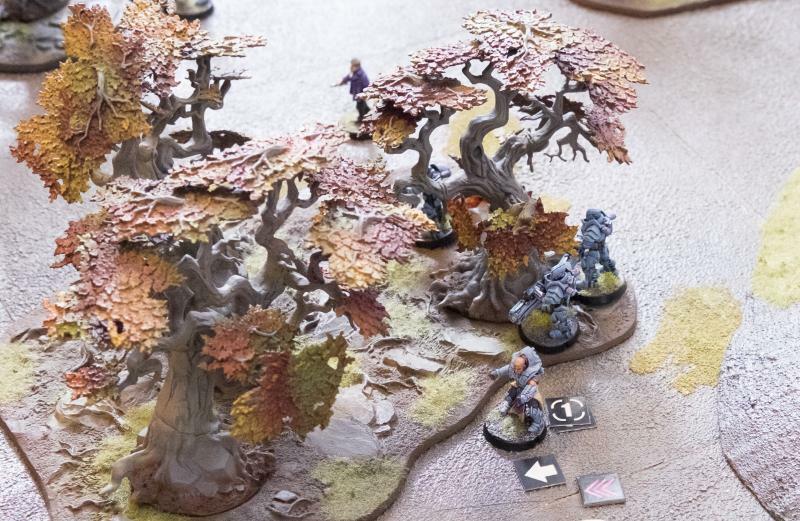 We knew both Maelstrom Edge players and general miniature game hobbyists everywhere were going to love it, so it just didn't make sense to hold its release back. Because of that, the Broken faction will continually evolve bit by bit, as we're able to add more models to the range. The good thing is that we're finally at a point where you'll be seeing much more regular model releases from us (the current target is once per month), which means that if you're a budding Broken player, you won't be waiting forever to get new reinforcements. The next question we had to answer was: should we release rules for all the Broken units we plan on making in the future (even if there won't be models finished for those units for a while), or should we instead just put out rules piecemeal as we release new models? 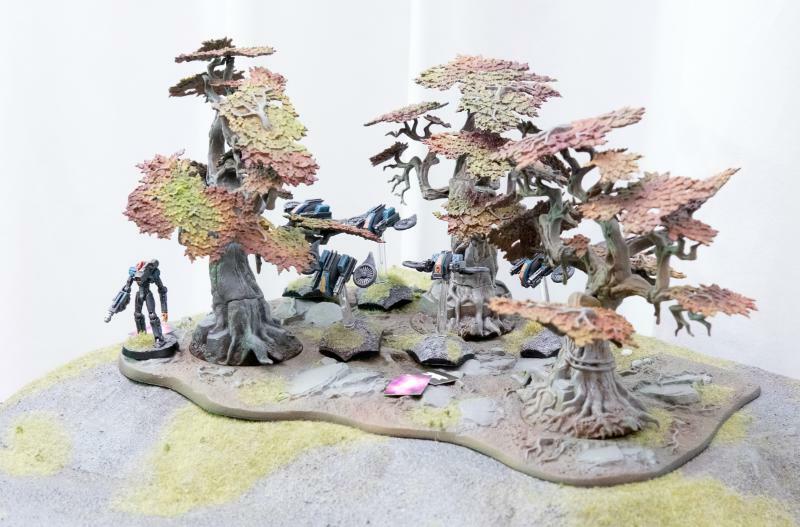 There are positive and negative aspects with either path, but ultimately the decision came down to the fact that the rules/options for a unit often need to be tweaked based upon how the sculptor turns out the final model(s), including how many optional bits they are able to fit onto the sprue. For example, if we were to put out rules for every Broken unit we plan to make in the future, invariably talented hobbyists would convert some of their existing models to create these 'future' units. 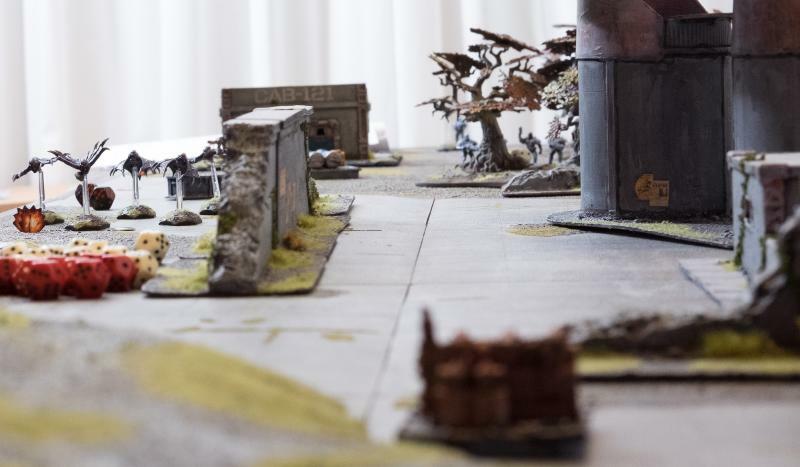 But when the final production versions of those models are eventually finished, it might turn out that we needed to change the unit's rules and/or eliminate some equipment choices, thereby leaving those who took the time to make their own versions suddenly out in the cold. 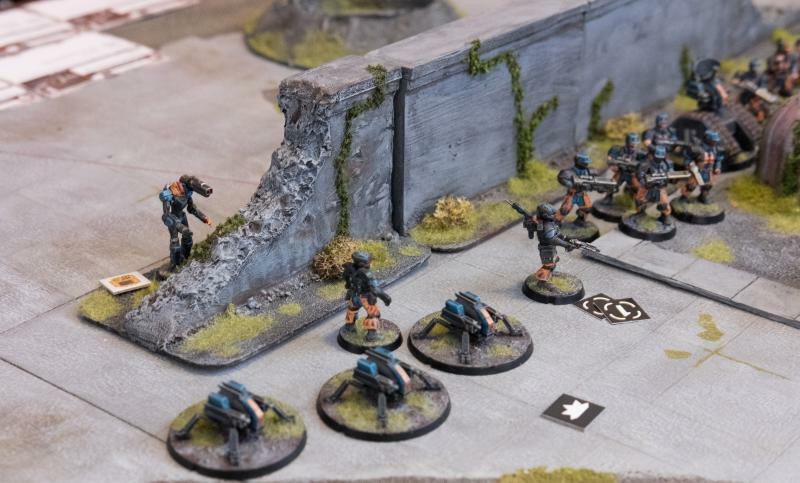 We ultimately decided to just release rules for the units that we currently have available, and we're exploring new ways to make publishing these rules both easy and convenient. We've just gotten an online unit card system up and running on our website, and we're pushing to get to a full force creation system integrated into this as well. 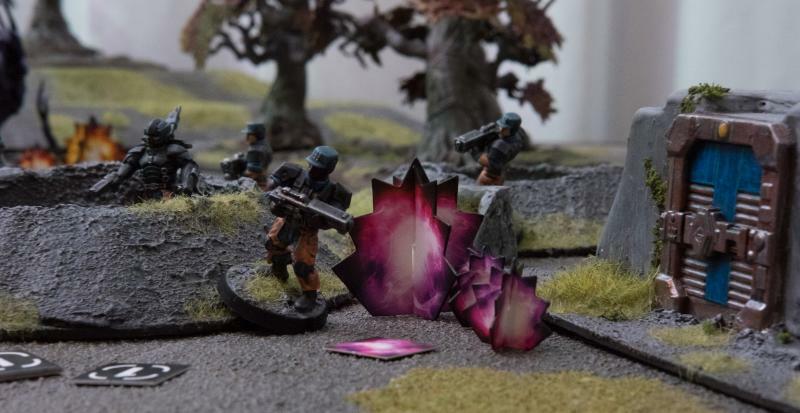 Once we have a solid collection of Broken units available, we will be looking at avenues to create/publish a full faction book for the Broken, but for the time being, any rules we publish online are considered 'playtest' rules, and we absolutely welcome any feedback you guys might have. You can leave this feedback either in the Maelstrom's Edge forum on Dakka, or you can email us directly at rules-AT-spiralarmstudios-DOT-com. The basic Broken Rabble unit - used to fill out the Core unit selections of your force. 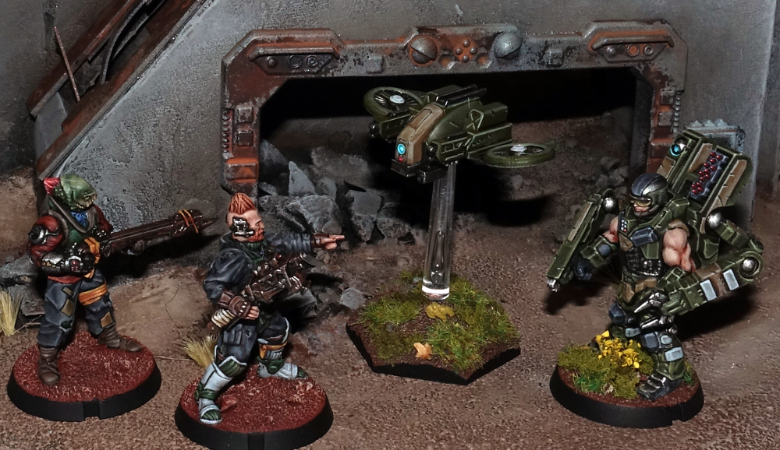 Rabble Assault - the close range specialist units, featuring more deadly short-ranged weaponry. Rabble Fire Support - able to take lots of the longer ranged specialized weaponry. Between just those 3 unit types, there's plenty of room for you to field a force designed to your particular tastes. What's even better, is that the Broken make use of a lot of aliens within their ranks. Yes, the Broken Rabble kit is filled with all kinds of xeno models, but these are all so close to human physiology that they don't have any special abilities associated with them. But coming soon, the Broken will start to get reinforcements in the form of really crazy 'Exotic Xenos', that, in some cases, can be added right into your existing Rabble units to totally change the way the unit is able to fight! Other Exotic Xenos are giant brutes (you might have spotted some of them in some of our artwork) that form a unit all to themselves, adding different tactical options for the way the entire Broken force fights. For those of you chomping at the bit to give the Broken a test drive right now might be wondering about Command units for the Broken (because you need at least one Command unit to field a legal force). To fill that void, we've released temporary rules for the Forsaken Chieftain, which you can build using any model in the Broken Rabble kit. We have plans to release actual Forsaken Chieftain models in the future that will be equipped with new and different gear/weapon options, but if you take the time to convert a Chieftain out of your Rabble kit right now, you can rest assured that any weapon options you pick will remain part of its final rules. Thanks for reading, and in the next instalment we'll be looking at how the Broken actually fare on the table! We'd also like to take a moment to point out the next video in our Video Rulebook series is now up on youtube and we'll be continuing to add these videos until the entire rulebook is covered, making it much easier to learn to play Maelstrom's Edge. 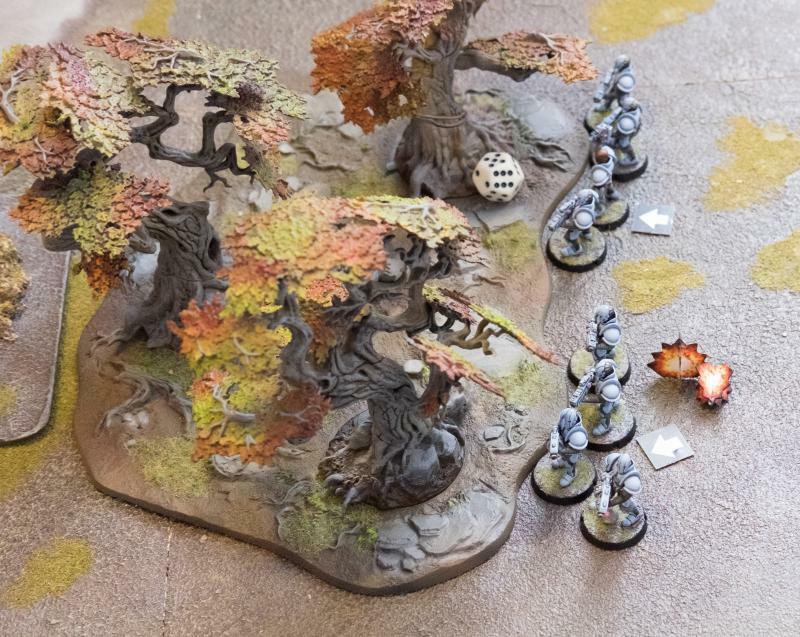 Battle report: The final act? Originally posted on DakkaDakka by Sgt. Oddball. Fluff bits are in italics, game bits in plain text. Bacaro wasn’t quite sure if his last outing had been success or failure, really. Two things were now becoming clear to him though. First of all that this conflict would not be won or lost by military supremacy. The Karist Enclave, though they had struck a severe blow with their surprise offensive, were severely outnumbered by the Epirian forces on Asper and could not hope to hold out for all that long. This conflict would be decided by the people. The Karists clearly counted on both gaining enough support from the people themselves and also, perhaps more importantly, on the Broken causing major havoc. The Broken had already become more then an annoyance before the Karist assault, but they had taken this opportunity to increase their efforts to claim what they thought was theirs. The shock of the early Karist successes and the fear of being abandoned by the Foundation had already caused many to flock to the Broken cause. If order could not be restored quickly, Asper would be lost. Bacaro’s second epiphany concerned his own person. He’d always thought himself a Handler of status. The jobs he was assigned and the meagre forces supplied to him now showed that the head honchos did not in fact think of Bacaro very highly, or, indeed, at all. Take his current mission. He was to take and hold some backwater energy station that never did matter and never would, and he was to do it with a frankly depressing ‘ force’. “Well”, thought Bacaro, “this might be as good a time as any to start making my own plans” as he hopped out of his prowler. I’m trying to develop a sort of ‘introductory mission’, using small forces and a smaller play area. This mission uses the Territories and Decimation objectives (and the faction objectives). The board is 3’ by 5’. All terrain was assigned cover value 2. 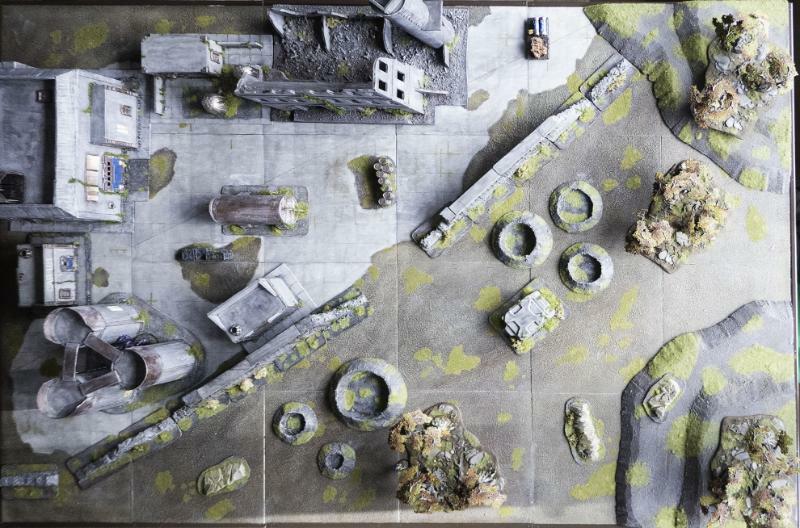 The woods are area terrain, the buildings, crates & barrels and the walls are obstacles. We didn’t use the actual building rules, so units couldn’t enter. Kaddar Nova Myro strongly felt the absence of Elyssa, the Shadow Walker. She’d always made sure there were no surprises, no open ends. Now, Myro felt he was going in blind-folded. The Enclave needed more Cybel energy though, desperately so, there was no holding back. Pitched deployment was rolled for. The Karists bid 3STs to be attackers. Deployment is as shown. Epirian Deployment left, Karists right. The Territories objectives are three energy terminal markers spread in a line across the board. All Karists are deployed on the move, all Epirians are deployed pinned. 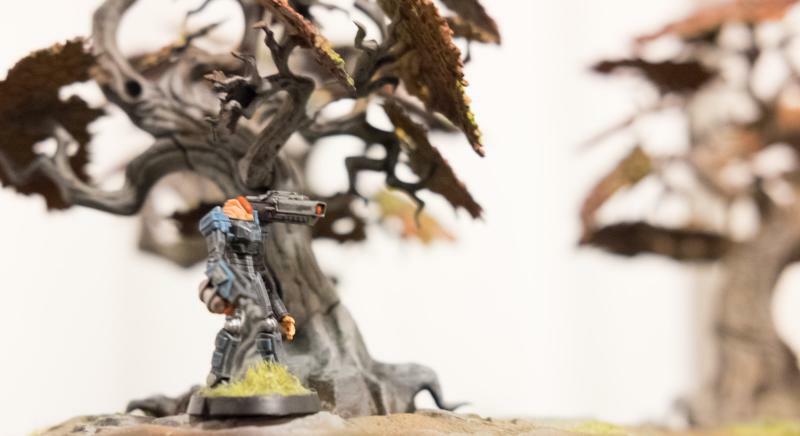 Scarecrow with Maglock Railrifle and Clingfire sprayer. Note that I’ll be ignoring the Epirian Automated Uplink Relay activations: it contributed its victory point the first couple of turns and added some command points later on. Also, my flash trigger battery was empty so the pics are a bit sub par, and also I didn't take any notes so the report as a whole is a bit iffy. Myro wasn’t going to waste any time. “Fly, my pretties” he thought as he watched his flock of Minnows descend upon the Epirian unbelievers. 1st activation: The Minnows charge into the lone Scarecrow. After defensive fire, CQ fighting and reactive CQ fighting, the Minnows are 1 down and have gained a pile of STs, whilst the Scarecrow has suffered an injury and has also taken some STs. Always putting faith in his bots first, Bacaro had sent his Scarecrow ahead to oversee the field. Immediately he was flocked by aliens, but Bacaro linked his mind with the bot and doused them in clingfire. 2nd activation: The Scarecrow gets his bot protocols activated and moves away from the Minnows to get a clear shot with the clingfire sprayer. All but one Minnow go down. Having taken care of this first threat, Bacaro immediately had his Contractors take up position in the woods. Previous experiences had taught him to put these guys where they felt most secure, or else they’d probably run off at the first whiff of pink smoke. 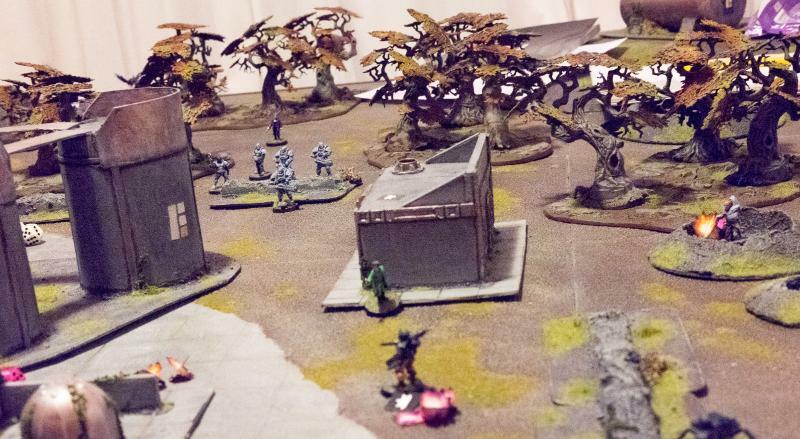 3rd activation: The Contractors take the objective near the woods and loose some shots at the Nova’s shielded unit. Myro observed coolly how the robot’s flamethrower engulfed his Minnows. Without the need to order them, he saw his Elites advance and utterly destroy the machine with Vulcan Pulse fire. 4th activation: The Tempests advance and fire at the Scarecrow, destroying it. A Scarecrow against a flock of aliens, that’s a fair exchange, thought Bacaro. Meanwhile, his ever eager subordinate Kasero had advanced his Spider Drones up the center and was laying down a veritable rain of fire on the enemy position. Good. 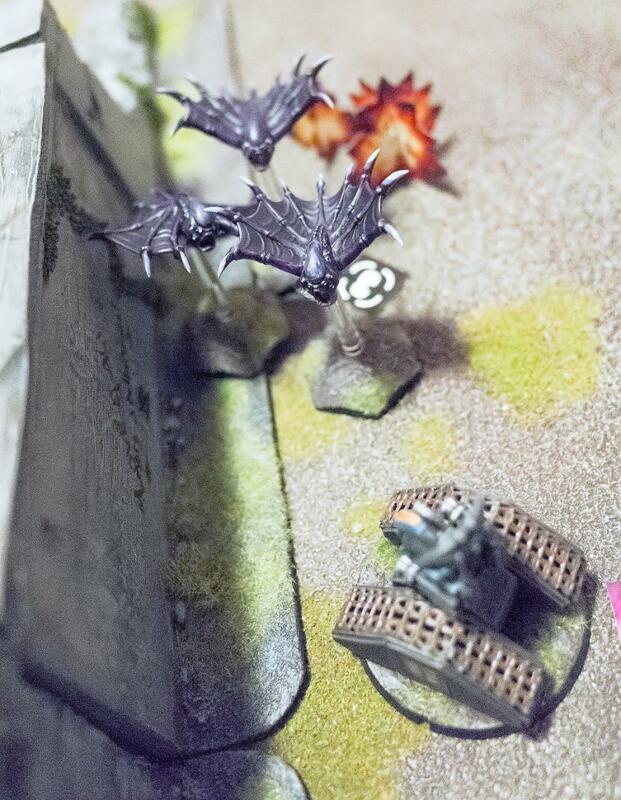 5th activation: The Spider Drones Advance & Fire at the Nova unit. The dice are on fire, generating a bunch of extra hits through the Cutter machine gun’s burst ability. 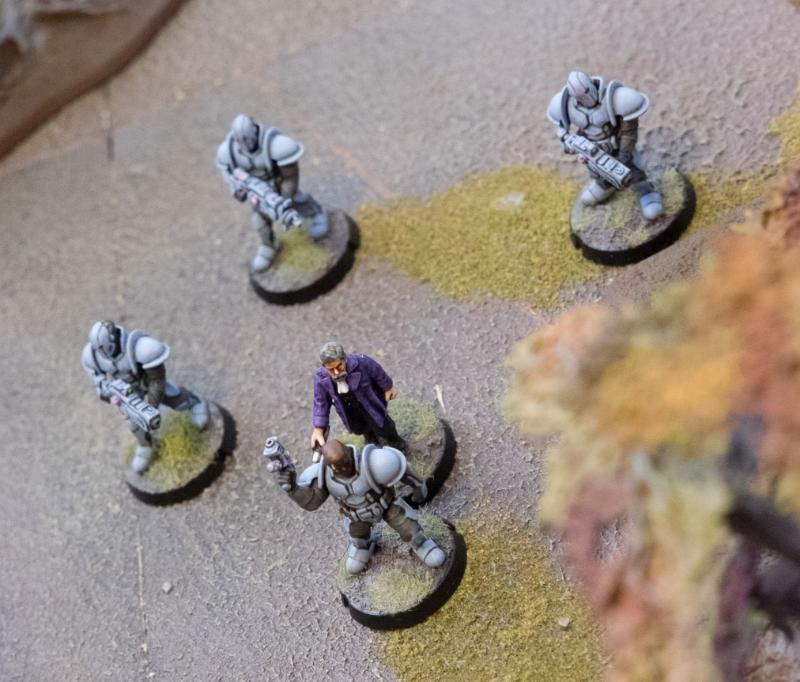 A Trooper snuffs it and the unit gets a pile of STs. Bacaro figured he could end this here and now and called in the one favour Epirian Command still granted him: an aerial drone strike. Moments later the hated foe was peppered from above. 6th activation: The Journeyman launches his air strike at the Nova’s unit, to some but not too great effect: the Nova takes an injury. Myro cringed at the stabbing pain in his shoulder. He was surprised at the intensity of fire coming his way. If only Elyssa were here, he’d surely have had a better idea of what to expect from the opposition. His reactor shield kept his brothers mostly safe though, only Mai-Lo seemed like she’d better return to base. The rest of his squad he led up to the central building housing the refinery controls. The Cybel must flow. 7th activation: The Nova has enough willpower not to be too impressed by the pile of STs on his unit. 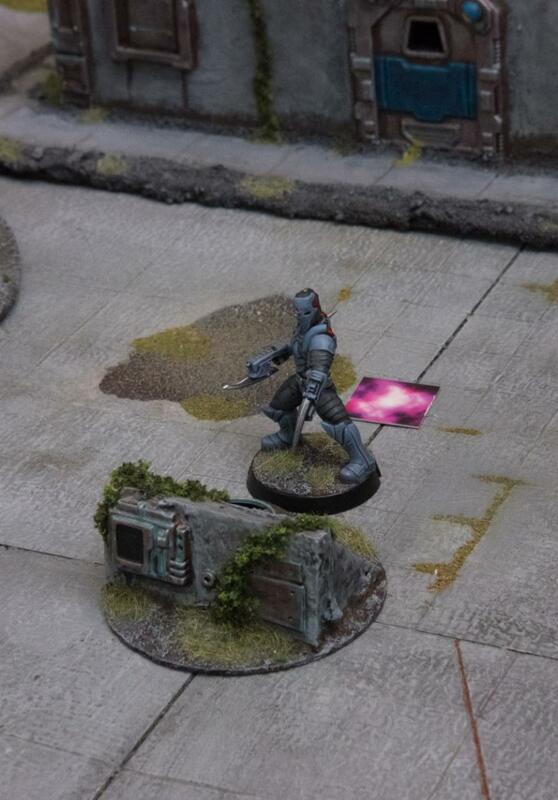 He advances to the secret cache objective, switches his reactor to gauntlet overload and returns fire at the Contractors, taking one down. He then shakes off some of his suppression, whilst overload suppress sprinkles STs on the nearby Epirian units. Turn 1 ends with 2 points for the Epirians, claiming one objective and utilising the uplink relay, and zero for the Karists. Note that this is the first time we used the Territories objective and we forgot that you keep getting points even after you move away from an objective. Not sure if this impacted the game much, but we’ll need to get it right next time . The Karist player destroyed the depleted Minnow unit. The Epirians get priority and generate 4 command points, whilst the Karists generate 3 CPs. Both bring back a unit: the Minnows and the Scarecrow. Bacaro cursed the shimmering field protecting the enemy commander and ordered his men to keep pouring their fire into it. It wouldn’t hold forever. 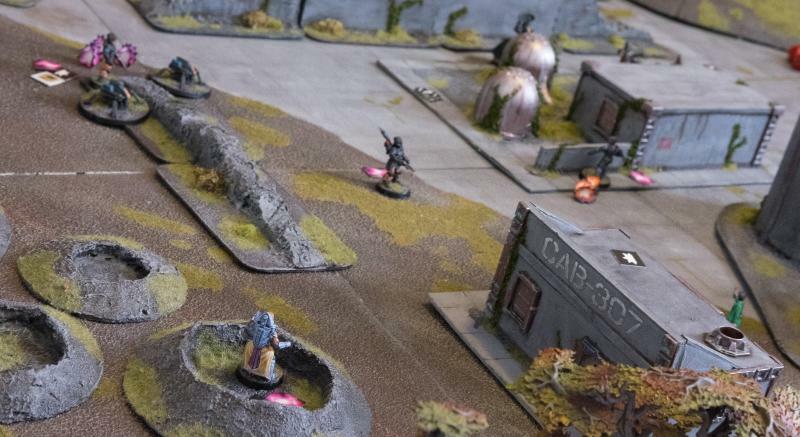 1st activation: The depleted contractors lob a grenade shell at the Nova and fire their assault rifles, trying to render the unit ineffective through suppression. 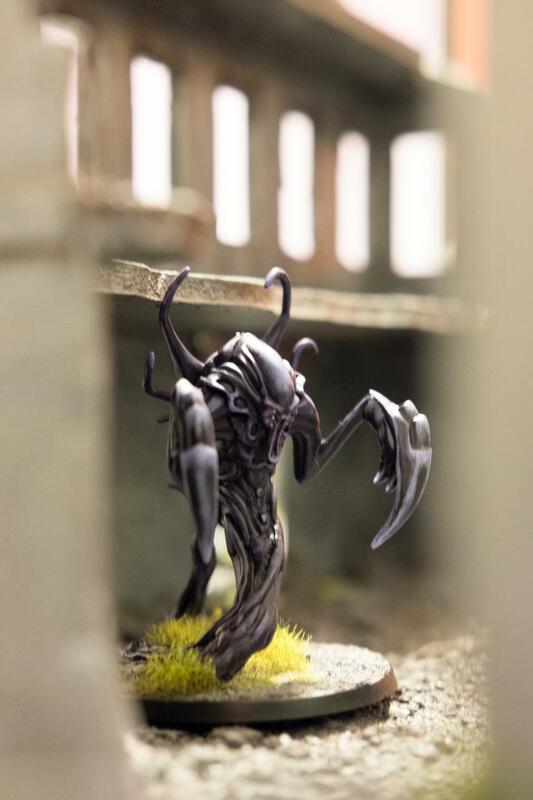 The Tempest Elites, recognising the greatest threat, walked up to the corner of the central building and unleashed their Ravagers at the location of the Spider Drones and the Epirian commander, only to see them hide effectively behind the remains of a thick wall. 2nd activation: the Tempests advance and fire at the Journeyman, who is lucky to escape without a scratch. 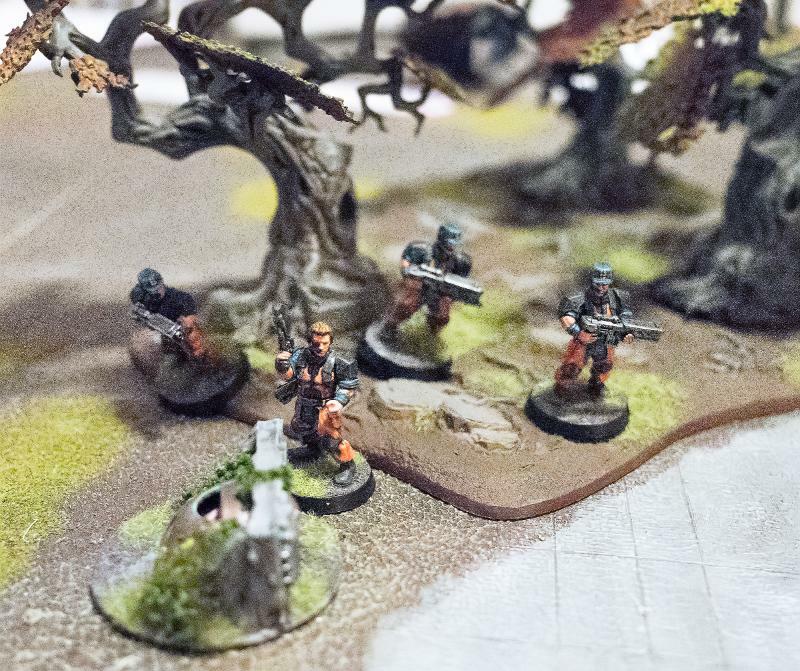 Sensing an opportunity to swing the battle as his Tempests were keeping down the soulless drones, Myro directed another flock of Minnows at the enemy’s position in the forest, hoping to drive them away from the refinery controls. 3rd activation: the Minnows Dash back in to contest the objective. 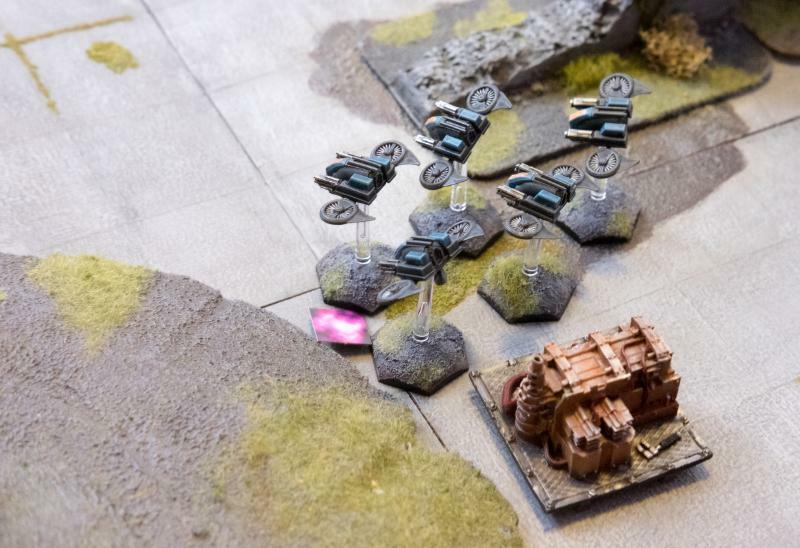 Bacaro immediately recognised that the enemy murder machines on the left flank had to be subdued if he was to take the field. 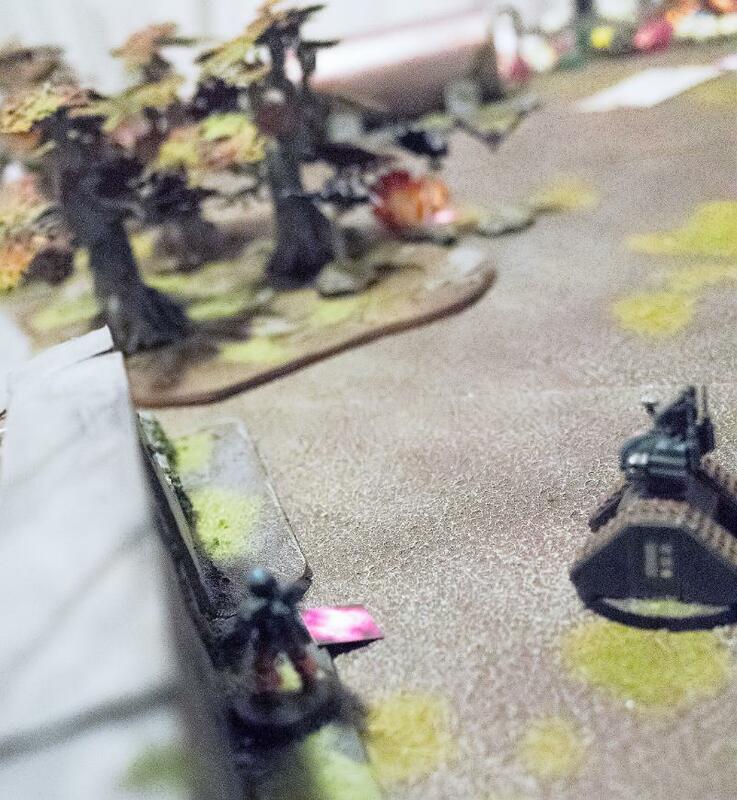 Another Scarecrow bot was sent up the left flank to target the foe’s heavy armour. 4th activation: The new Scarecrow came on the board and fired at the Tempests to very little effect. Which is as well, because we forgot the Scarecrow had to fire wild due to the Railrifle’s ‘heavy’ ability. 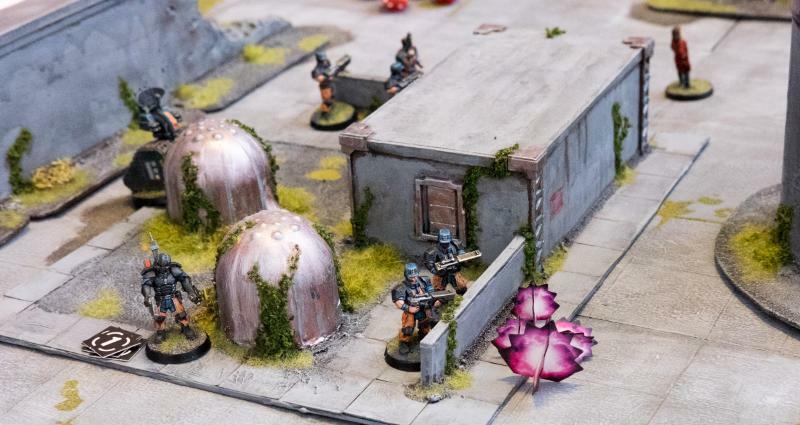 Again putting faith in his Drones over his people, Bacaro shouted to Kasero to advance into the woods and fix the alien situation before they scared off his Contractors. 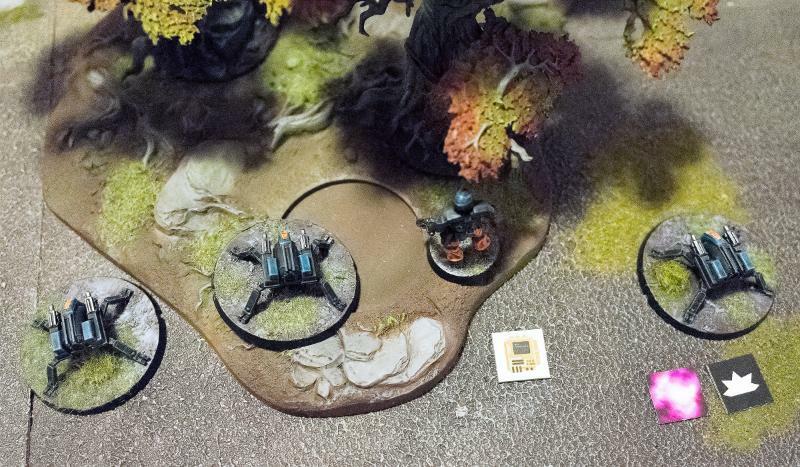 5th activation: The Spider Drones take an order and dig in in the woods, shooting the Minnows as they go, piling on STs. Bacaro then sought the security of the big wall. He was no coward, but there were limits to how much he was willing to risk for this dump. 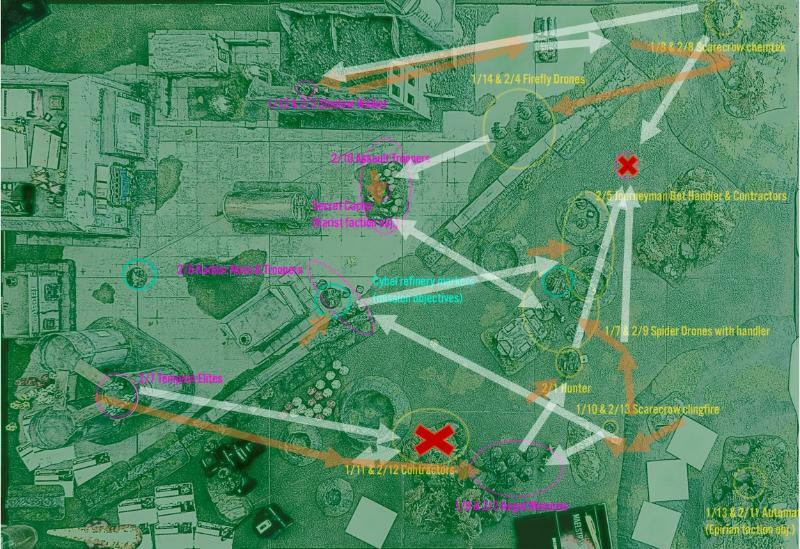 6th activation: The Journeyman executes a tactical retreat to get into order range of the Scarecrow. Somewhere in this turn the Nova unit probably shot some Epirians, I think the Drones? 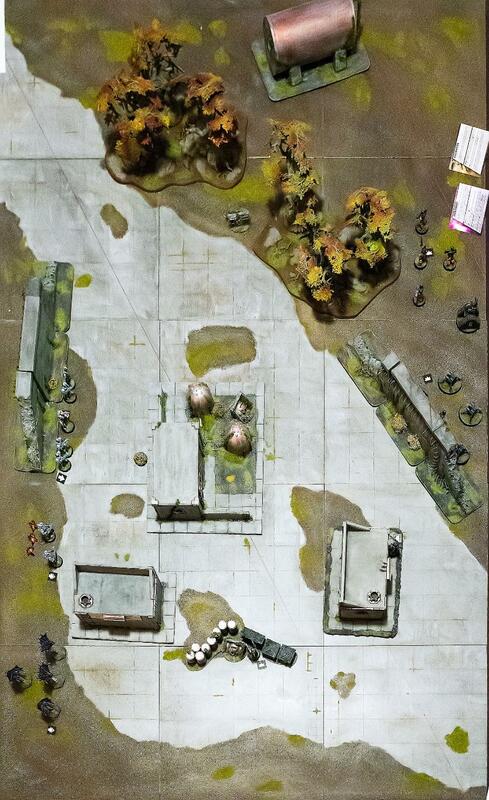 At the end of turn 2 the Epirians take a point for their uplink relay and the Karists a point for their secret cache. Again acting to get rid of the Tempest threat, Bacaro linked his mind with the next Scarecrow bot and found a kink in the enemy armour with the powerful Railrifle. Good, but was it too little, too late? 1st activation: the Scarecrow gets an order and with hold and fire manages to put an injury on one of the Tempests. As his Tempests were now having issues, it was time to roll the Epirian flank. Myro again directed his fire at the forest, targeting the little Drones. 2nd activation: The Nova unit spreads out a bit and attacks the drones, piling on the STs. One Drone turns into scrap. With the Minnows ahead and the enemy commander firing at his flank, apprentice Kasero thought it wise to reconsider his next move. 3rd activation: With a bunch of STs and the Minnows near, the Spiders are forced to retreat to the board edge. As Myro forced the Drones to retreat, the Minnows went with their instincts and charged the Contractors in their now very uncomfortable position in the woods. Sure enough, they perished. 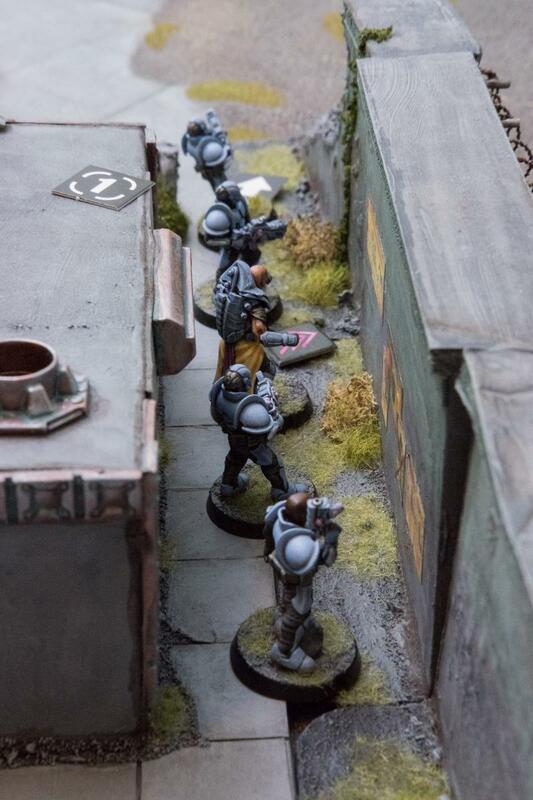 4th activation: The Minnows fail their discipline check, but due to ‘bloodthirsty’ they get to charge the Contractors, who die. The Tempests and Journeyman obviously did something as well this turn which I can’t quite recall, probably fire into the Drones or Contractors and Minnows respectively. 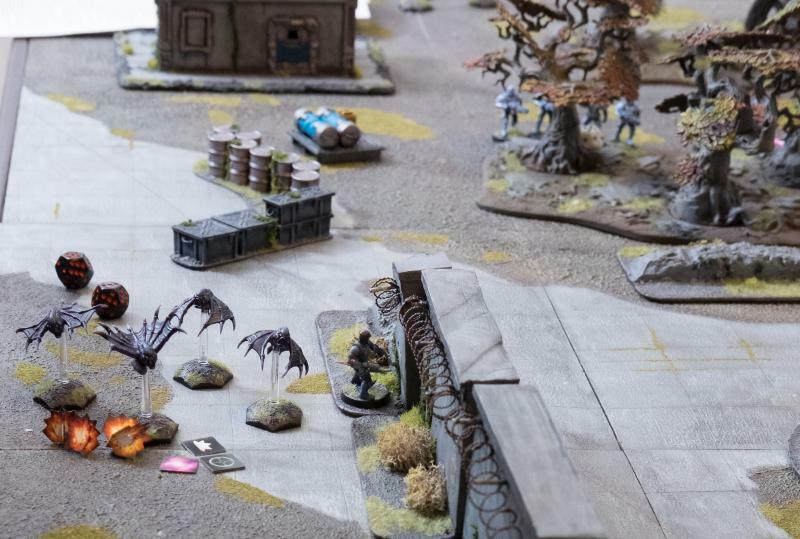 At the end of turn 3 the Epirians take a point for their uplink relay and the Karists a point for their secret cache (the Minnows cannot score objectives due to their ‘kill mission’). The Epirians bring back the Contractor unit as a reinforcement. 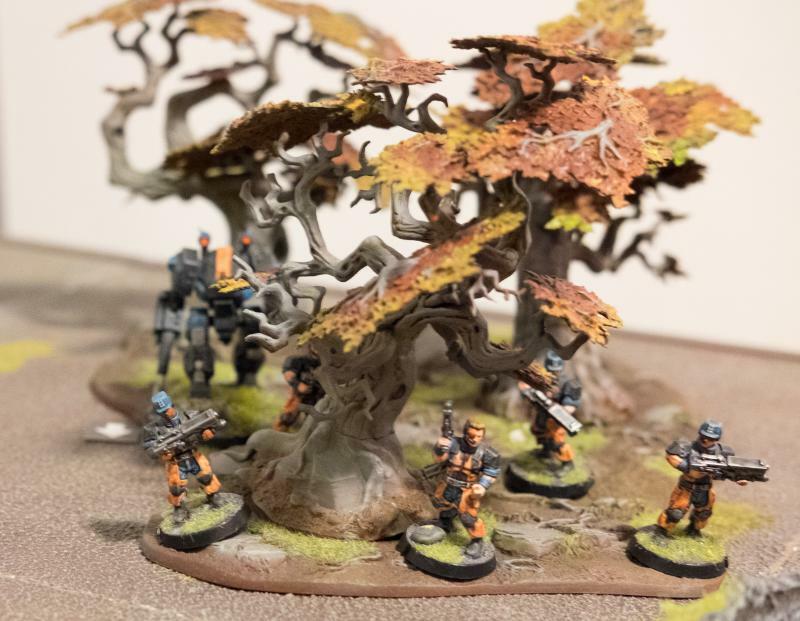 Sensing victory, Kaddar Nova Myro orders his elites to advance and secure their flank, containing the last energy terminal in danger of being disabled by the Epirians. 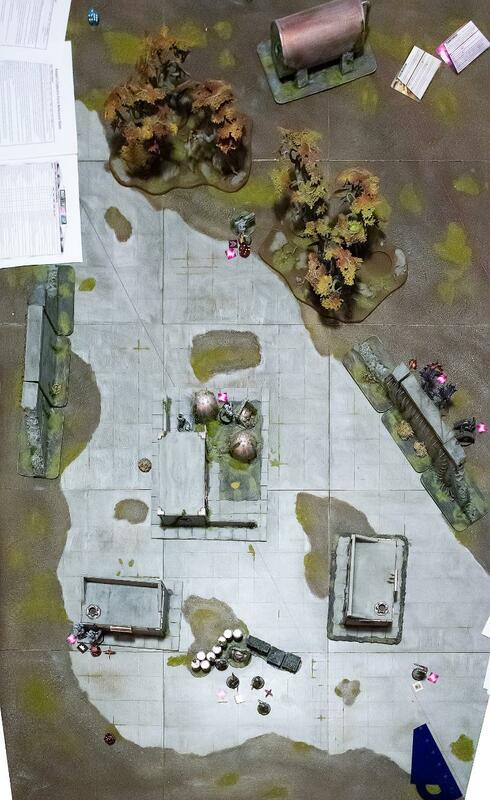 1st activation: (this shot was taken later): Tempests dash to the objective and probably fired wild at the scarecrow. This was just as he expected, damn Contractors couldn’t even hold off a flock of angry baby angels and Kasero once again overstretched himself and then chickened out. No more of this, Bacaro thought. An angry shout to Kasero brought them back to the woods at least, pouring more fire into the stubborn Minnows. 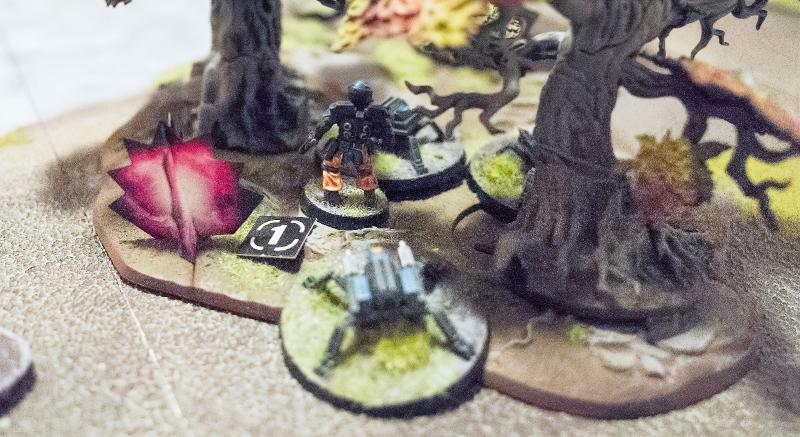 2nd activation: The Spider Drones are given an order and their protocols are enabled, after which they dig in in the woods, firing wild at the minnows. A second group of useless Contractors then finally arrived at the left flank, asking for orders. Resisting his urge to tell them to just take a hike, Bacaro ordered them to support his precious Scarecrow and keep the Tempests occupied. 3rd activation: Contractor reinforcements Dash ahead and put some STs on the Tempests. Myro saw the bots return to the fray and wasted no time in jumping across the low wall, reaching the central terminal with a few strides. Lead from the front had always been his motto, that’s where you get the best view. 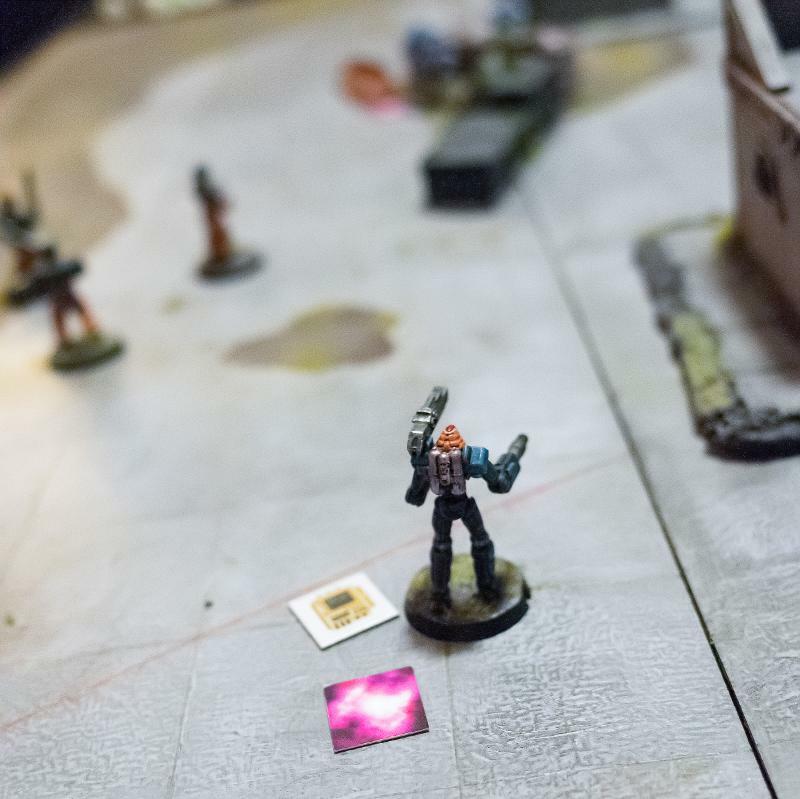 4th activation: The Kaddar Nova leaves his unit to claim an objective. Once again linking with the Scarecrow, Bacaro put the heat on the Tempests at the terminal. With his Railrifle and the Contractors In support, he’d take this flank and then circle round. It was all or nothing now. 5th activation: The Scarecrow is ordered and puts more pressure on the Tempests. 6th activation: The Journeyman puts more STs on the minnows. The Minnows’ rage ever increasing, they now descended on the little drones that had returned to the woods. They never had a chance. 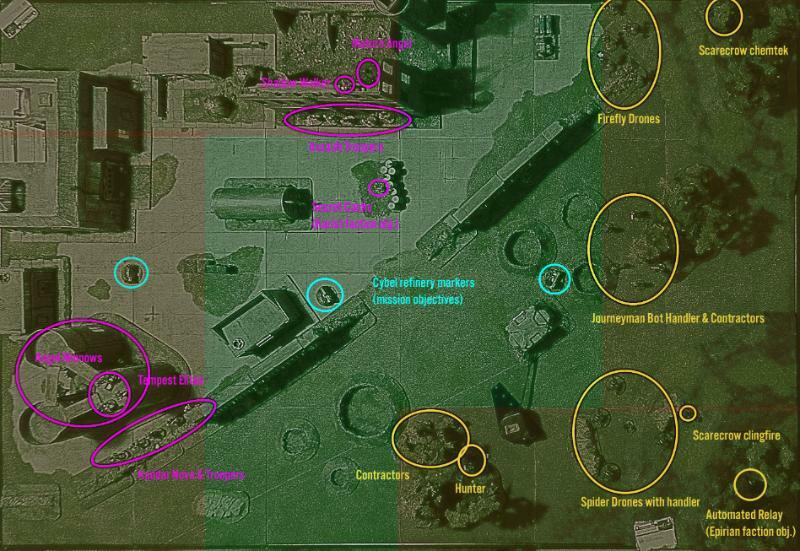 7th activation: (same image) The Minnows get another charge in and destroy the remaining bots and Handler. Myro became ever more confident. The more his little angels came under fire, the bigger a threat they became. He motioned to his unit to go and help out the Tempests on the other flank. The threat on this side was gone. 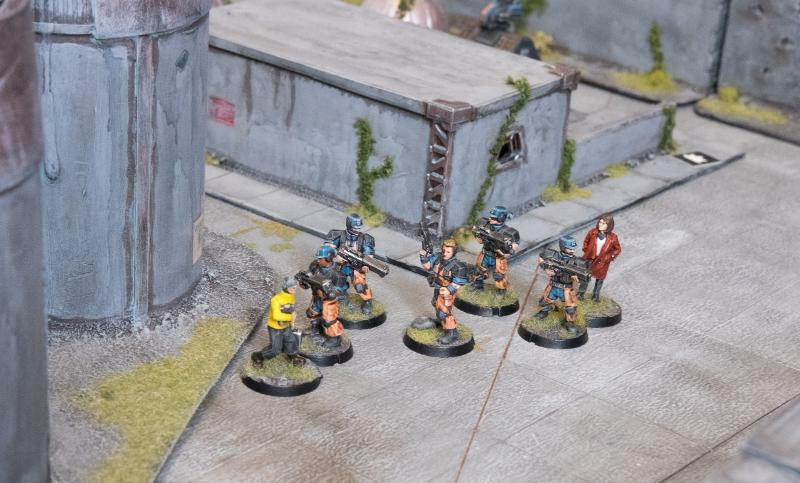 8th activation: The Troopers take position in order to fire at the Contractors. They are well dispersed and hidden beyond the crates, so the damage is limited. At the end of turn 4 the Epirians score 0, whilst the Karists get three: two terminals and the secret cache. 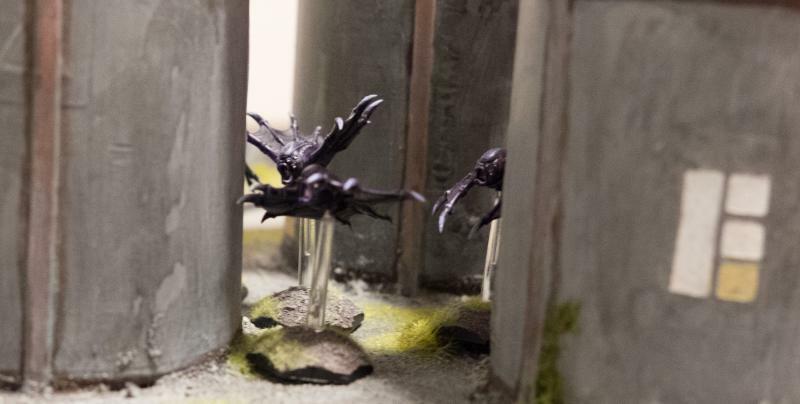 The Epirians bid 6 command tokens to bring back the Spider Drones, but the Karists counter with 7. The Epirians are now really outnumbered. 1st activation: The Scarecrow keeps shooting the Tempests, who are now properly suppressed. 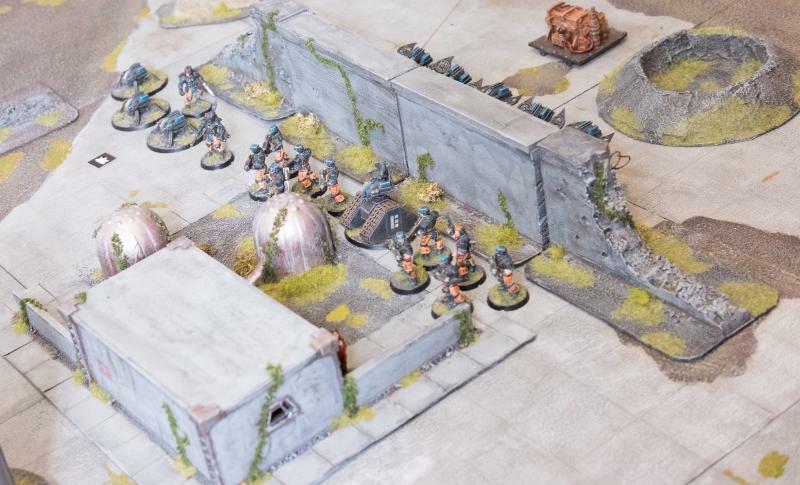 With the constant sniper fire from the distant bot and a full squad of Contractors advancing on their position, the Tempest Tetrarch decided to retreat and form a new front with the Troopers coming up on their rear. They’d retake the objective together. 2nd activation: The amount of STs and proximity of the Contractors now forces the Tempests to retreat. The minnows are unstoppable. Myro watches as they move on from the broken bots and fly behind the wall, where he knows the Epirian commander is located. This battle would end now. 3rd activation: The minnows keep taking advantage of their bloodthirsty ability to attack new targets. This time, the Journeyman falls to their Cybel maws. 4th activation: The Contractors take an objective. Myro surveyed the field. He felt the Minnows had done their job, what remained of the Epirians would soon be gone. 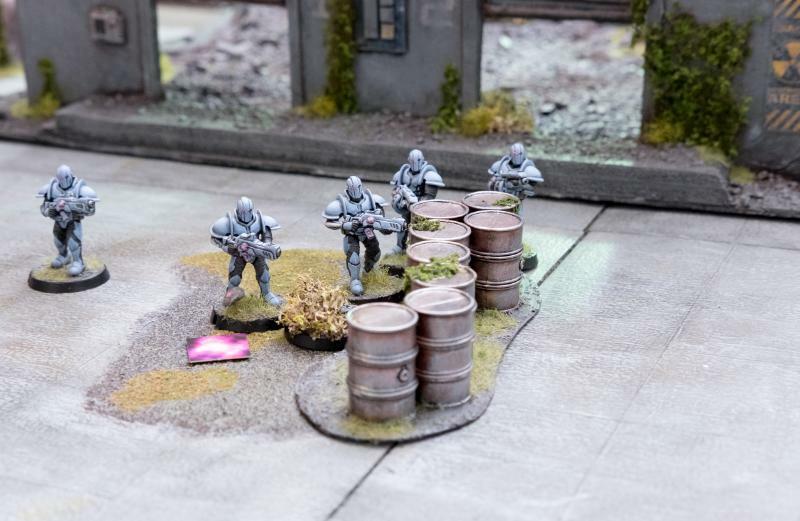 A few quick orders put the Tempests on defense whilst his Troopers could start to enter the refinery building and gather what energy there was left to get here. 5th activation: The Troopers move to claim the center objective. Myro switched his reactor to boost mode and ran off towards the far terminal himself to coordinate with his Troopers. He half expected to come under fire still, but nothing happened. Another sweet victory for the cause. 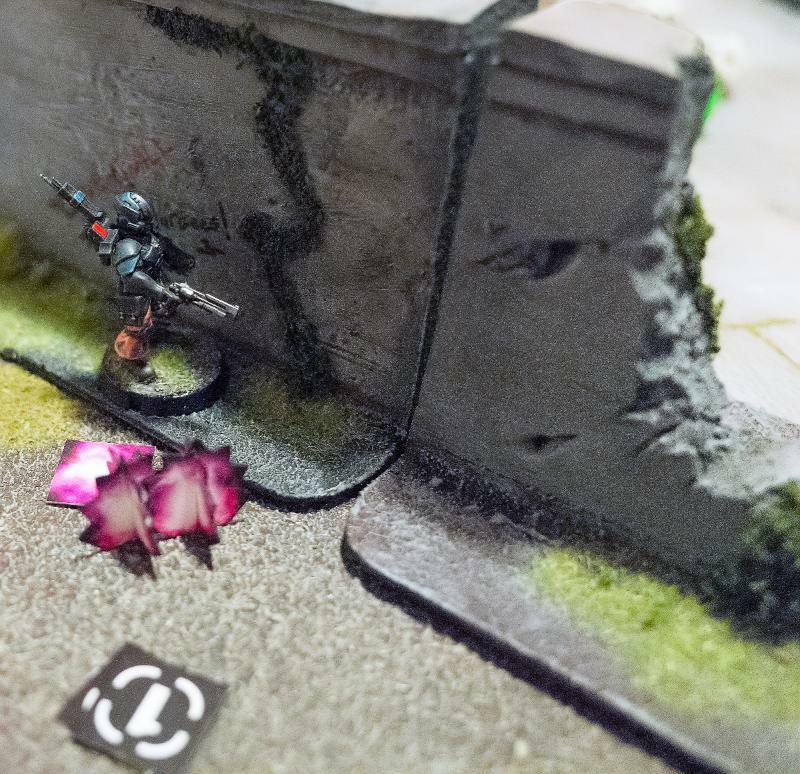 6th activation: The Nova Dashes to the objective. Final image. The Karists get more points for having over half the territories at the end of the game and for having taken out one third of the Epirian forces, making them the clear winner. “What happened to Bacaro? !” barked command over the holo-link. “I’m not sure sir, our uplink was right near his position when we… moved out, it must have imagery of what happened.” Without another word, the holo shut down, leaving Fiennes in confusion. At the other end sat a pensive Epirian commander. They had seen the data from the uplink, but the last of it was weirdly scrambled and the thing itself was nowhere to be found. Destroyed by the Karists no doubt, but what had happened to that data…? Was Bacaro dead? 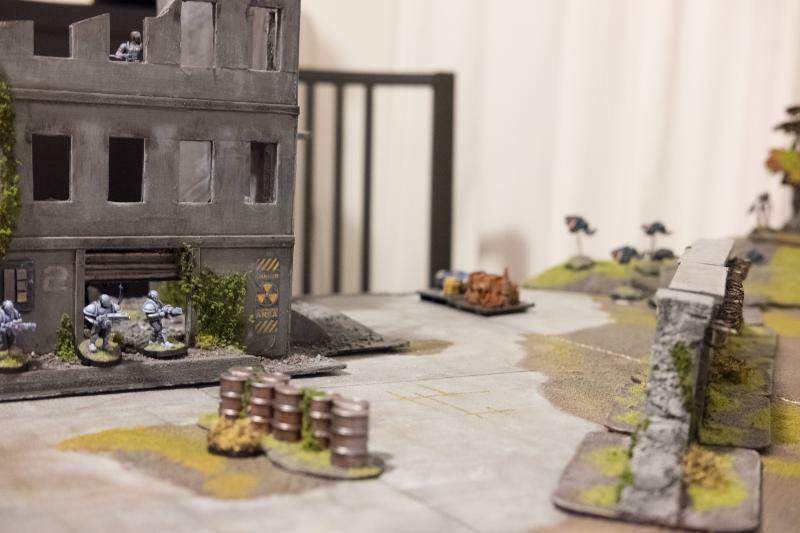 With a few modifications to the points given out by the objectives and a little more terrain I think this will do nicely for an intro mission. 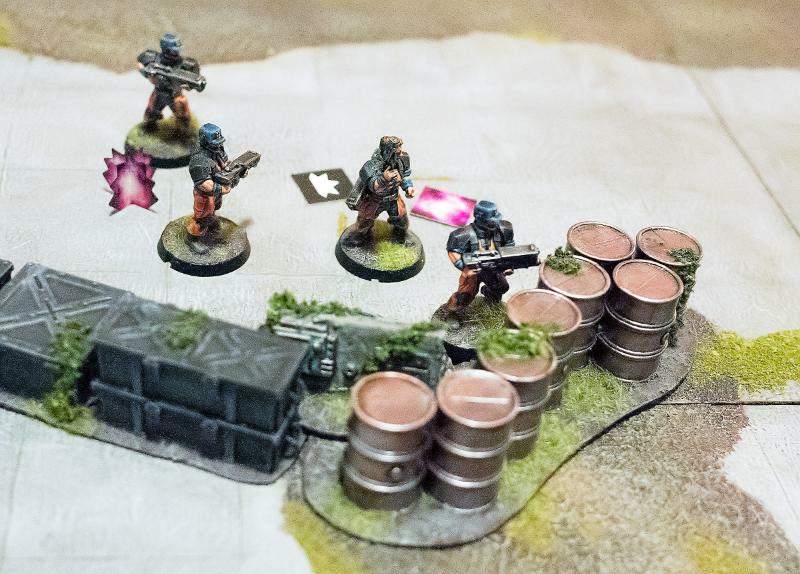 The forces are only small, but with the reinforcements mechanic the players need never be out of stuff to work with, and the game should about fit on a normal sized table. I recall when I first read the rules how I worried Maelstrom’s Edge would give a limited gaming experience, given the max of 5 turns and smaller forces. I could not have been more wrong. Every game you immediately get into the thick of it and every activation is interesting. 5 turns is plenty. A handful of models is plenty. Just make sure you have enough terrain on the table. Having played a couple games now and seen a few more, the rules are starting to click nicely. The big thing with this type of game is always the special unit and weapon abilities. To get a good idea in your head of what units can do just reading the rules is never enough, you need to see them work to really get that feel. In this game the Minnows’ bloodthirsty ability was a bit of an eye-opener. I never thought of it as a big thing, but it means they are a threat even when utterly suppressed because they keep coming at you and have a big charge range. Cool stuff. Dionne pressed a slip of paper in front of Bacaro. “Here, this is good as you’ll get. The centre lies here in the woods. The scientific crew is packing up their stuff as quick as they can, it’s up to you to get them out safely. The Karists have been spotted in the woods, so I hope you’re on time. Good luck!” With that, Dionne hopped back into the prowler that had just arrived and now blew up a cloud of dust as it tore away into the distance. The whole city was in chaos since the Karists had started their offensive on yesterday morning. Utilising the element of surprise, they had established a more or less coherent front, concentrating on key positions on the outskirts of town. The Director had issued orders for the evacuation of all northern districts and the securing of anything of importance, amongst them VIPs and technical equipment. 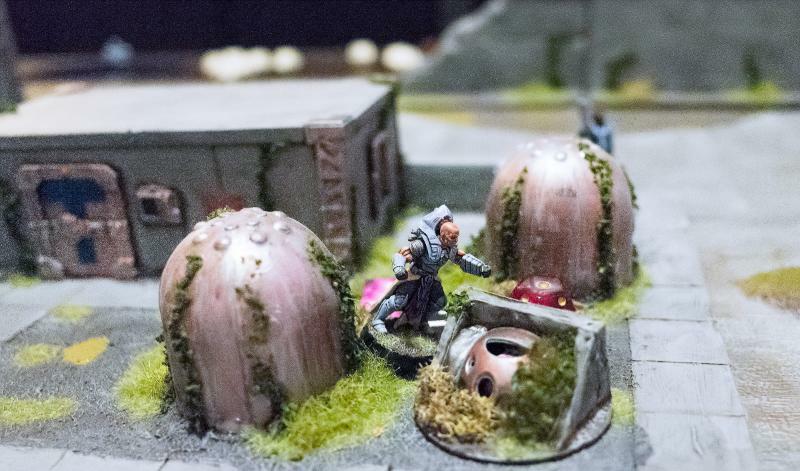 Having been driven off from the Tusculi Compound at first contact with the Karist forces, Bacaro happened to come across this remote research centre en route to his rallying point. Apparently, the scientific crew here were taking their sweet time getting their stuff together and now risked becoming Karist hostages. Snatching up the bit of paper with the layout of the centre, Bacaro gave the order to advance, still not really sure what to expect. The idea was to help evacuate the entire centre, but priority was to be given to four apparently hot shot Cybel energy scientists, of whom he’d never heard. His only clue was: “look for people with garish outfits, they’re bound to be important scientists”. This would be another crappy day. Here’s for our second game, still learning the rules and general flow of the game. The mission was Split Research, which means players got points for keeping an artifact safe, and also for capturing 4 VIPs running around the board. All terrain was assigned cover value 2. The woods and craters are area terrain, the rocky outcrops, buildings, crates & barrels and the walls are obstacles. We didn’t use the actual building rules, so units couldn’t enter. After his successful defence of the Tusculi Compound, Kaddar Nova Myro was tasked with grabbing whatever valuables the surrounding area had to offer. 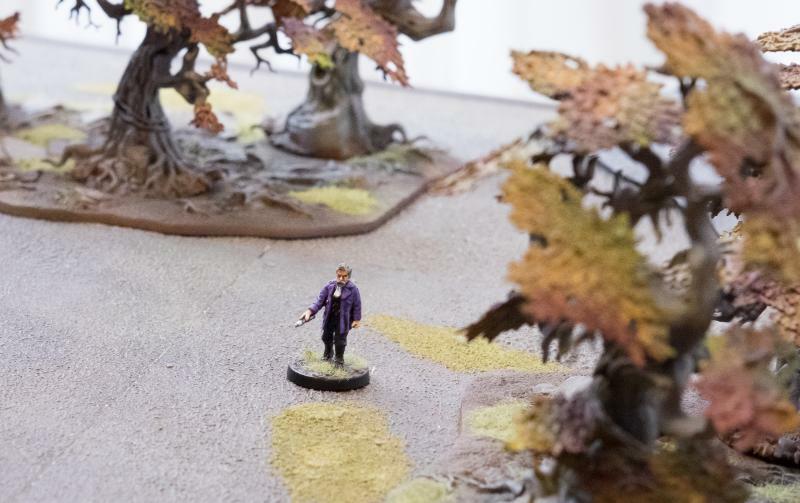 Elyssa, the enigmatic Shadow Walker, had pressed him to venture into this woods and capture some scientists. Myro didn’t see the point of taking home some people who probably did have valuable knowledge, but would just as probably not see the rightness of their cause and just be a general pain in the behind. He did, however, figure that a research centre such as this would harbour some useful supplies. 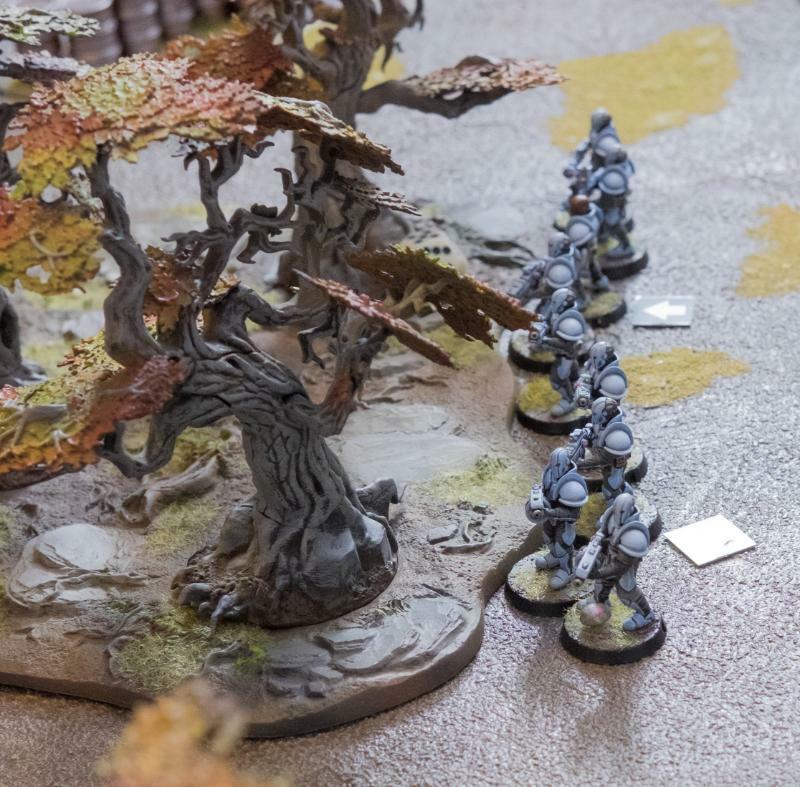 It was with this dual purpose that he now peeked out from behind the treeline and ordered his troops to make a pincer move around the centre and allow no means of escape. They were just in time, from behind the further wall he could see activity of what was doubtless Epirian security forces attempting to beat them to the prize. Big flank deployment was rolled for. The Karists bid to be attackers, deploying as shown after the Epirian defenders had turtled around the big rear wall. The four VIPs deployed, waiting to be taken. Epirian Deployment. The rusty generator is the Epirian Artifact. The Karist Artifact is the set of blue storage tubes. Epirian commander has 3 CPs assigned, the Spiders are deployed pinned. The Karist commander has two CPs, is on the move and has his reactor in kinetic boost mode (which would normally not be the best idea, but it doesn’t matter in this case as he’ll be the first activation). 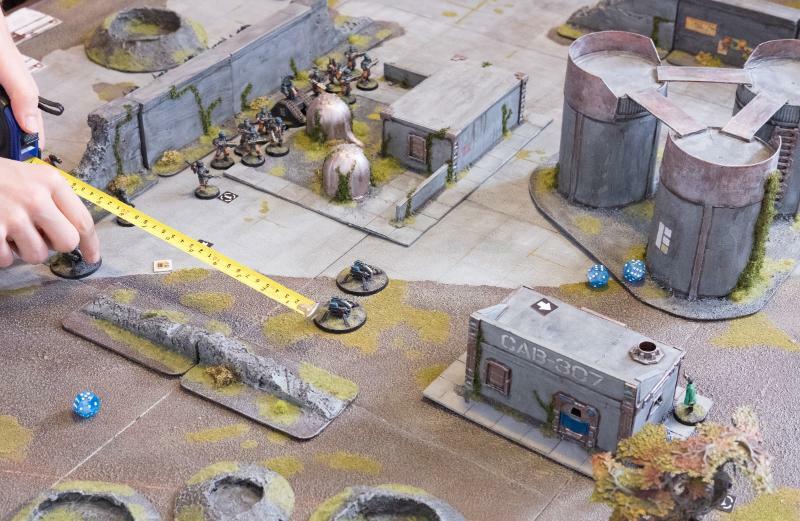 1st activation: Kaddar Nova Dashes ahead into cover near one of the objectives. Storms! The Karists had beat him to it and were swarming out of the woods just as he entered the compound. Bacaro linked his mind with his trusty Scarecrow and aimed to snipe the first Karist to show his face. 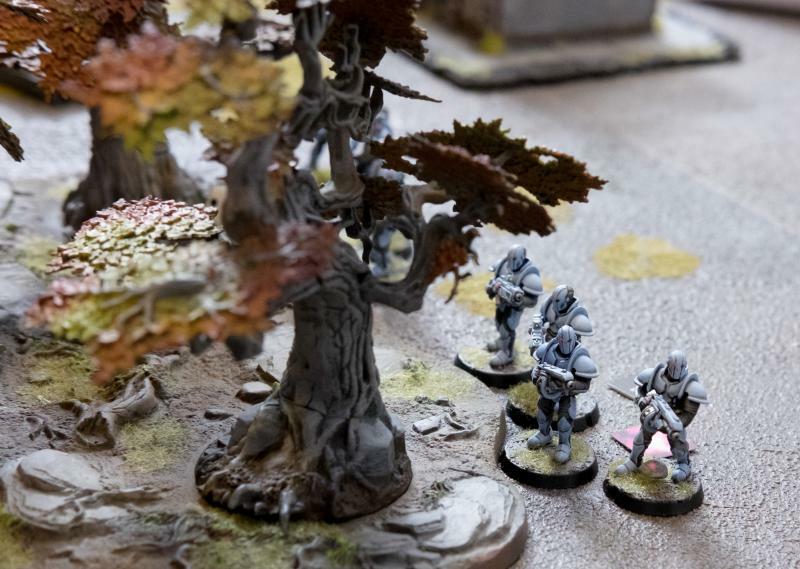 The powerful railrifle gave off a deadly burst and a Karist Trooper dropped dead just as he emerged from the treeline. 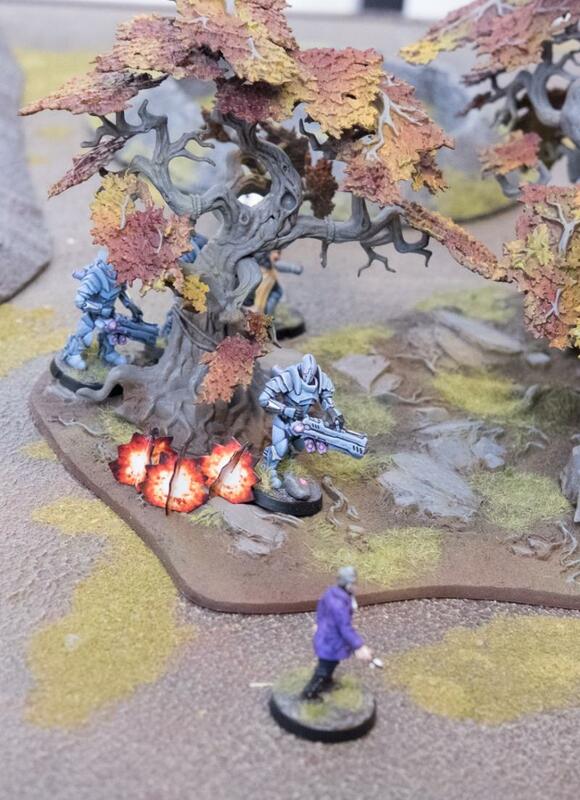 2nd activation: The Scarecrow gets his bot protocols activated and shoots at the Assault Troopers just visible behind the woods, resulting in a kill and 4 STs. Again eager to follow his mentor’s lead, Apprentice Bot Handler Kasero quickly typed commands on his bot interface, ordering his Drones to advance, but stay low and follow the Scarecrow’s lead. 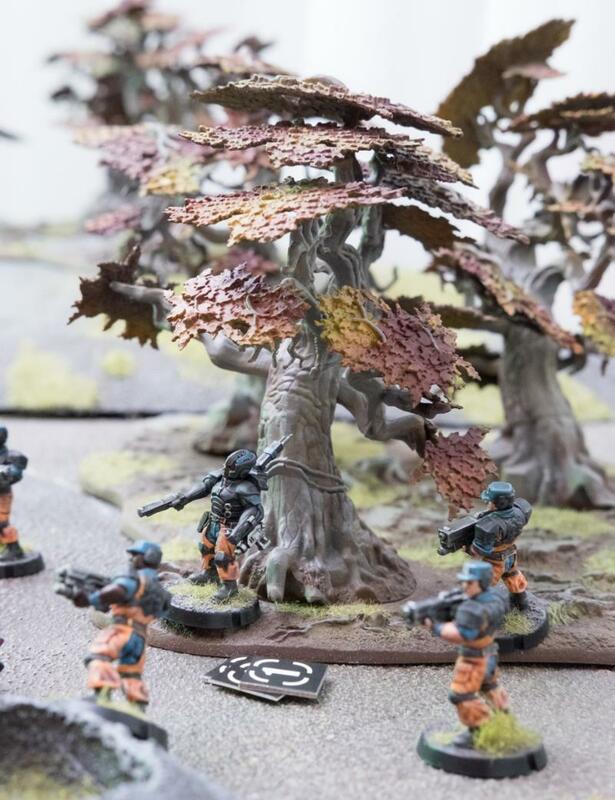 The small but powerful machine guns let loose at the treeline where the first Karist had fallen. 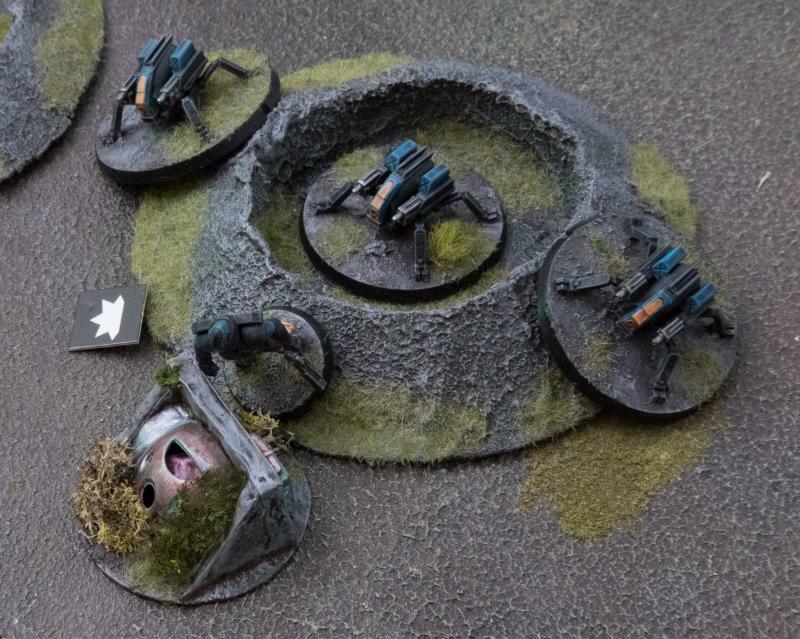 3rd activation: The Spider Drones Dig-In after having their bot protocols activated and shoot wild at the Assault Troopers. They all miss, but the Troopers suffer another ST.
First blood for the Epirians. Myro bit his lip. He couldn’t let the Epirians pick off his followers as they tried to herd the scientists their way. He shouted to his Tempest Tetrarch to secure the hidden supply cache planted here weeks ago by Elyssa and lay down covering fire. The lumbering armoured forms sprung into motion and unleashed their Vulcan cannons at the advancing Epirian Drones. 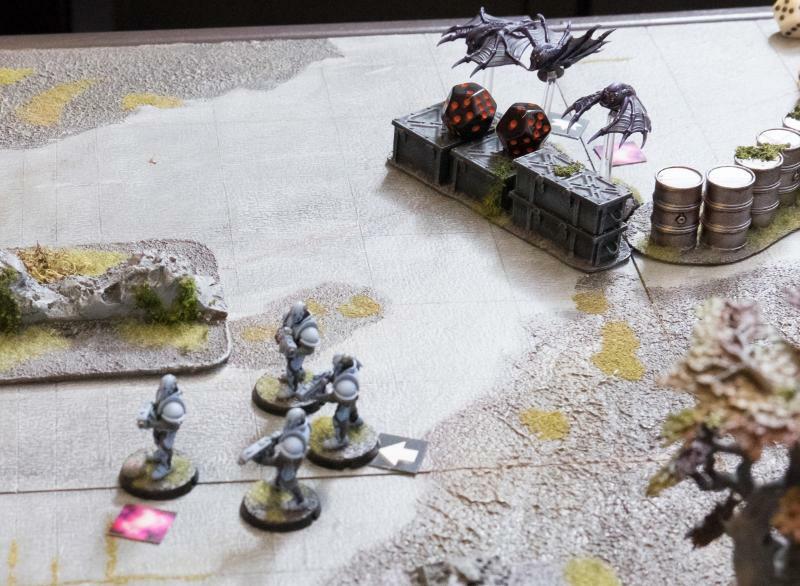 4th activation: The Tempests Dash to their faction objective and fire at the Spider Drones. The Epirian player avoids losing a Drone by taking the one penetrating hit on the Apprentice Handler whose MAS2 can take the DAM1 hit. 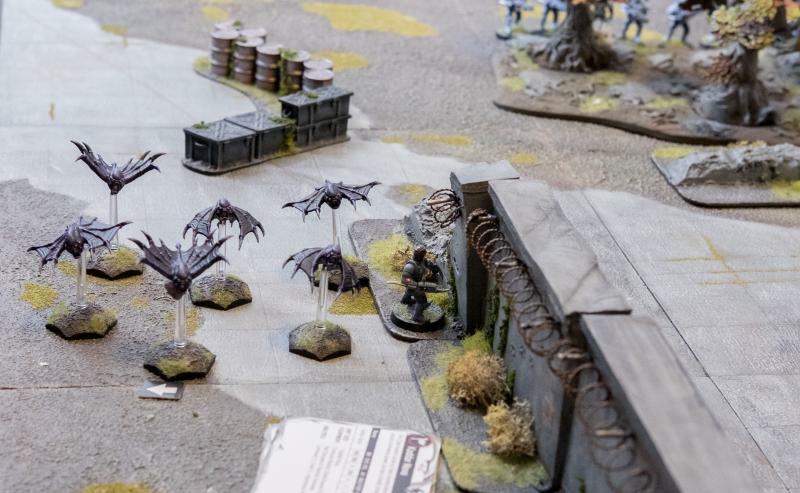 Bacaro watched with satisfaction as the enemy’s dreaded artillery was unable to harm the carefully dug-in Spider Drones, but was then distracted by a report of alien forms appearing on the left flank. Remembering the impact these aliens had at Tusculi, Bacaro wasted no time in calling down an aerial drone strike on the reported area. A cloud of smoke appearing from behind the centre wall and cheers heard across the comm link told Bacaro the strike was a success. 5th activation: The Journeyman Advance & Fires an aerial drone strike at the Minnows. Despite their high Evasion and on the move bonuses, 1 Minnow perishes and the unit takes 7 STs. Meanwhile his Contractors were taking the enemy artillery under fire. He only hoped the untested engineers would keep their cool this time. The enemy was seen to duck into cover, so he’d chalk that up as a success anyway. 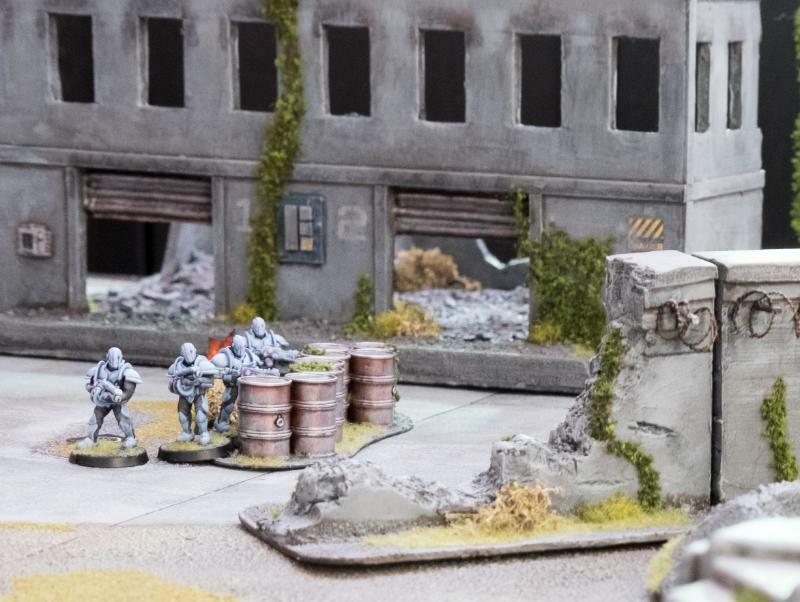 6th activation: One of the Contractor squads advances up to the building wall and fires at the Tempests, who take one damage despite their cover, resulting in 4 STs. The Contractors, however, are now dangerously bunched together. Quintarch Samuel was pained to have lost a brother to one of the enemy’s soulless machines, but rallied his team and ordered them to advance for the cause and avenge themselves upon the machines. The thumps of the Ripper Grenade launchers were followed shortly by an explosion and the sound of metal bits flying. 7th activation: The Assault Troopers fail their activation check and must perform a Shaken action. 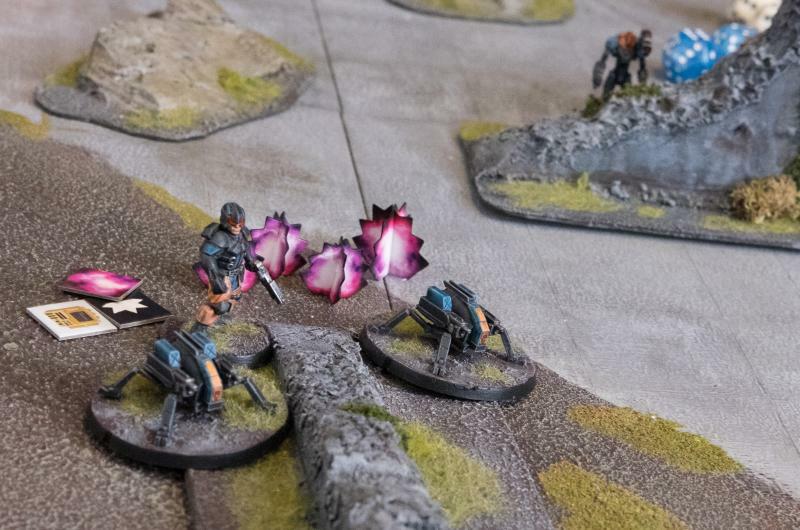 Firing wild at the Spider Drones, the small blast templates from the grenade launchers generate a lot of shots and, ignoring cover, manage to destroy a Drone and add 5 to the suppression total. 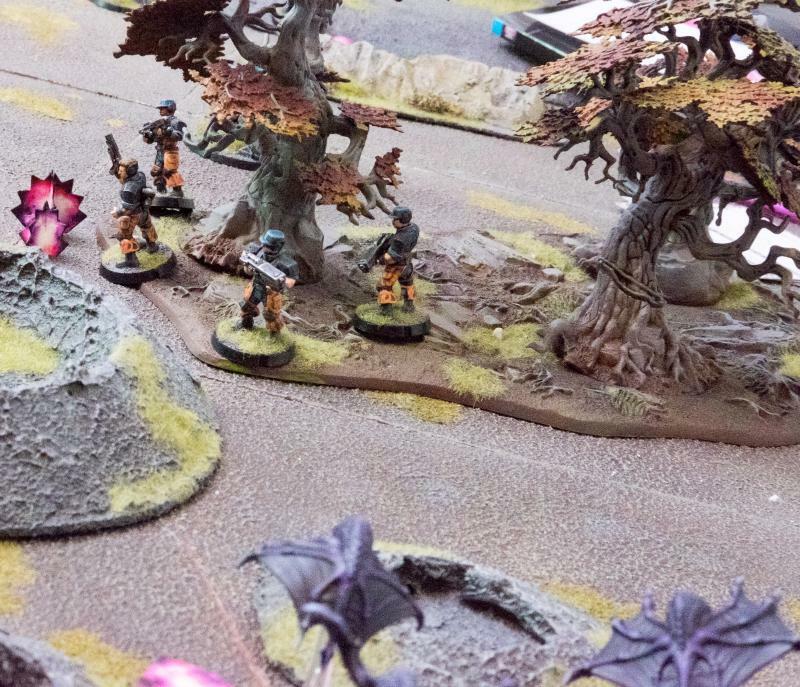 Elyssa, leading the advance on the flank, could only just duck into cover in time as a savage aerial barrage hit the area where she and the Angel Minnows were, she thought, advancing unnoticed around the centre. The remaining Minnows who emerged from the cloud of smoke had understandably lost their nerve and were flapping around in confusion, but then seemed to regain their resolve, luckily. Moments later they were in trouble again as Epirian Drones were appearing on the flank and shooting their lasers at the little angels. 8th activation: The Minnows fail their activation check and must take a Shaken action, but don’t need to retreat and fire wild at the Epirian artifact, but do no damage. They then shake off most of their suppression. 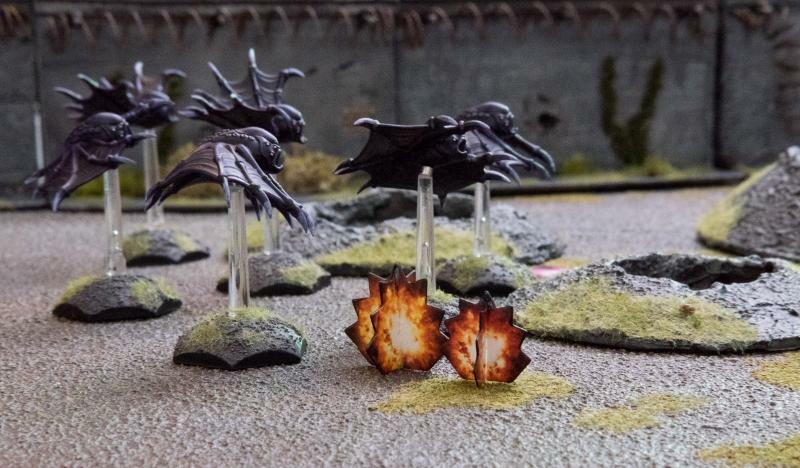 Following up the aerial drone strike on the approaching aliens, the Firefly Drones engaged their engines and took the Minnows under fire as they emerged from the smoke, two more of the horrible creatures dropped to the ground. 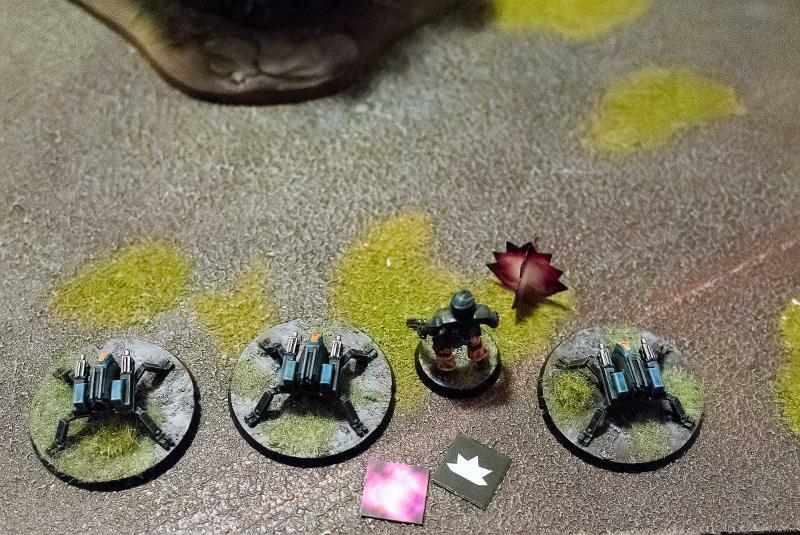 9th activation: The Fireflies Dash over to the Epirian artifact and fire their low power lasers at the Minnows, killing two and adding 3 STs. Elyssa decides there is no time to waste. She came here to capture some Epirian scientists known for their work on Cybel energy. If they could be made to see the truth about the Maelstrom, their knowledge would be of great value to the cause. The scientists, still in the midst of their evacuation preparations, were now caught in the crossfire and running around the centre in confusion. 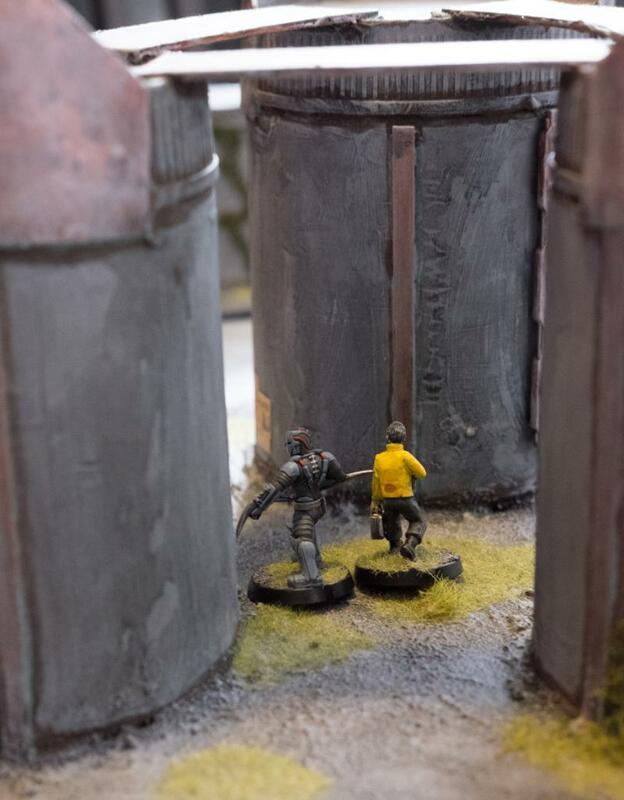 Elyssa spotted the research team leader taking cover behind the big silos in the middle of the centre and ran over to bind him. 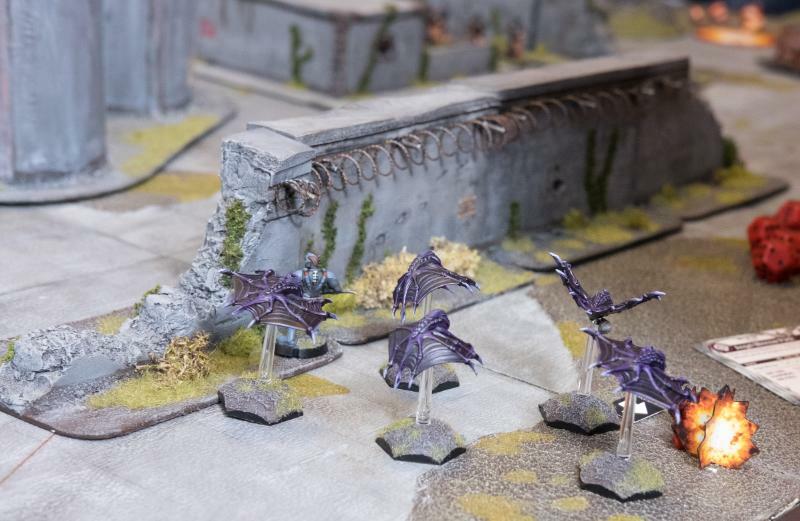 11th activation: The Shadow Walker Dashes, making a dynamic move to the middle of the board to claim one of the objectives. The Troopers under Elyssa’s charge saw her run over to one of the scientists, and followed her example. Loosing some shots for cover, they jumped across the concrete to where another one of the science crew was frantically trying to avoid getting shot and grabbed him. 12th activation: The Troopers Dash over to a second objective, with shooting adding 2 STs on one of the Contractor units. Tromp, the Contractor Team leader on the left flank took a last glance at the photos he’d had pressed into his hands after his boss was tasked with evacuating this centre. 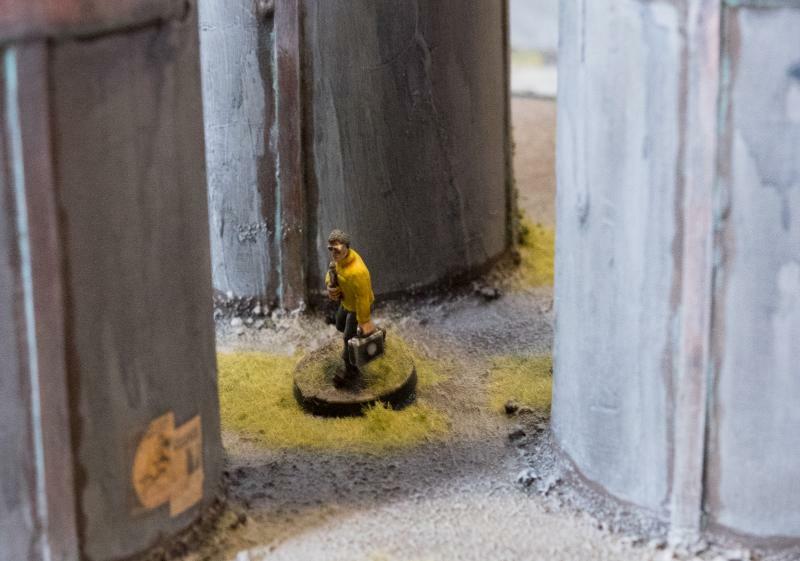 He had a specific job: make sure certain storage containers did not fall into enemy hands. Securing them would be nice, but he needn’t waste an opportunity to destroy them instead. Nobody had told him what was in these containers, but he was now sure he saw them stacked at the other end of the centre. Their team had secured one of the scientists who was somehow acting quite hysterically, and now ordered his engineers to lob some grenades the way of the containers. 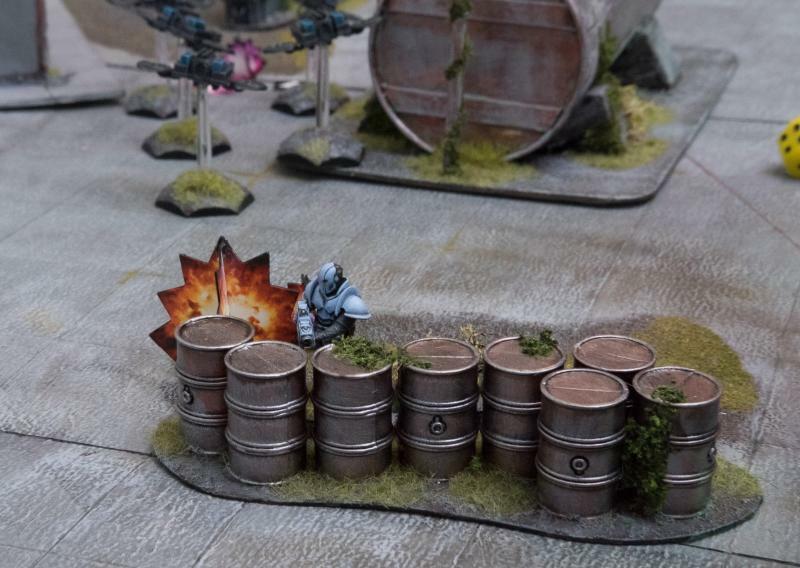 Unfortunately, the range was too great for accurate fire and the pesky containers remained sitting there defiantly. This ends turn 1. The Karists scored 13 VPs: 8 for their artifact being entirely undamaged, four for holding 2 VIPs and another for controlling their faction objective. The Epirians score 11, having one fewer VIP. The VIPS were then moved 6” and turn 2 commenced. Turn 1 end map: orange is movement, white is shooting. VIPs haven’t yet been moved. The Epirians get priority and generate 4 command points, whilst the Karists generate 3 CPs. Focusing all his attention on eliminating the aliens, Bacaro links his mind to the Firefly Drones, powers up their lasers and cuts down another alien, whilst the rest turn their tails under the fusillade of laser fire. With this threat taken care of, Bacaro can now focus on the silly scientists. 1st activation: The Fireflies get their evasive maneuvers protocols activated and Dash ahead, once more shooting at the Minnows, now with high power lasers, killing one and adding 3 more STs. Myro was quite displeased with his Elites’ cowardly hiding amongst the trees. Frantic shouting saw them advance one more and rain fire on the opposite Epirians, who were horribly slaughtered. This was more like it. Much as he valued every life, Myro had his priorities right and didn’t hesitate to brutally propagate the Karist cause if need be. 2nd activation: The Tempests advance and fire at the Contractors opposite. Utilising the re-roll granted by their faction objective, 7 hits remain after applying cover, resulting in four penetrating hits of which two are explosive. Three Contractors fall and 6 STs are added. Elyssa, distracted by the advancing Epirians on her flank, temporarily lost sight of her captive, who suddenly jumped and ran out into the crossfire. Moron. 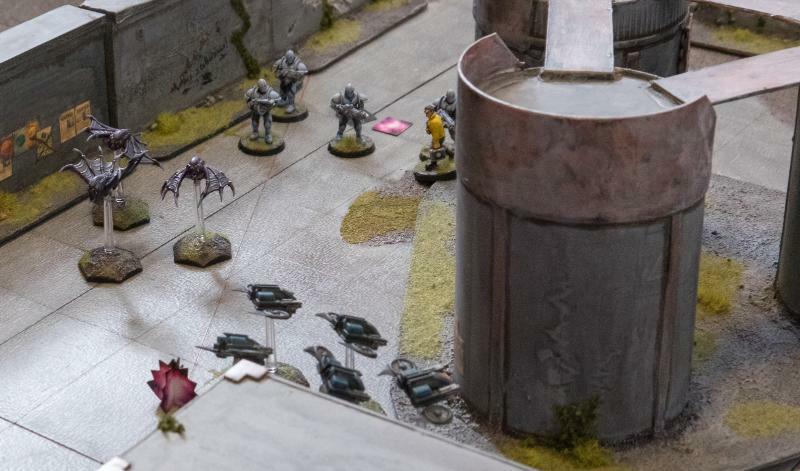 Elyssa figured a dead scientist was useless anyway and decided to fall upon the Contractors who were getting mauled by the Tempests’ Ravager cannons. As soon as she perceived the guns going silent, she ran out, drawing her Cybel blade and slipping it into the throat of one of the surprised engineers, then gutting the remaining Contractor before he had time to react. 3rd activation: The Shadow Walker charges the Contractor team and kills the remaining two, then shaking off the STs gained in the process. 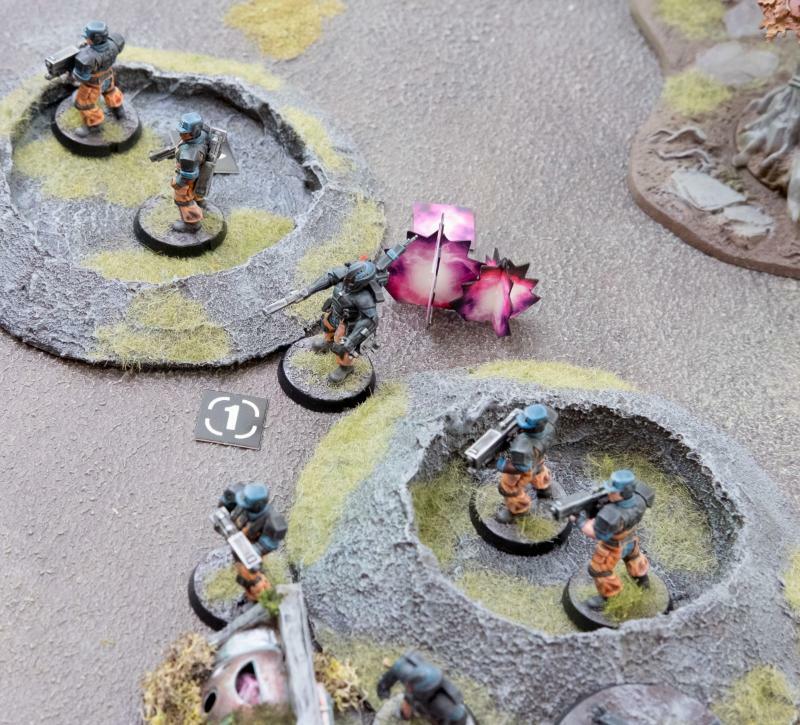 Kasero was starting to regret his rash action, he’d already lost a Drone and was in the middle of a hail of fire, whilst to his left a whole team of Contractors was brutally slaughtered by combined fire from the enemy artillery and an assassin appearing out of nowhere. This was no place to stick around. Tapping new orders, he and his remaining drones hoofed it to the cover of a ruined wall behind them. 4th activation: The Spider Drones receive an order and have their protocols activated, but still fail their activation and must retreat. Pinned behind a wall, they shake off 8 STs, but are still left with 3. This could not be happening again. Why was he again sent against the Karist offensive with inadequate forces on ridiculous missions? Fired up by his anger, he decided to go after the sinister figure that had come up and killed his engineers, only to then hide behind the low wall. Drawing his Dominator pistol, Bacaro fired at the assassin, but his nimble foe darted out of the way just in time. Myro was eager to press his advantage. Elyssa and his Tempests had neatly cleared this flank. Now it was time to go after the supplies the Epirians were so eager to guard. 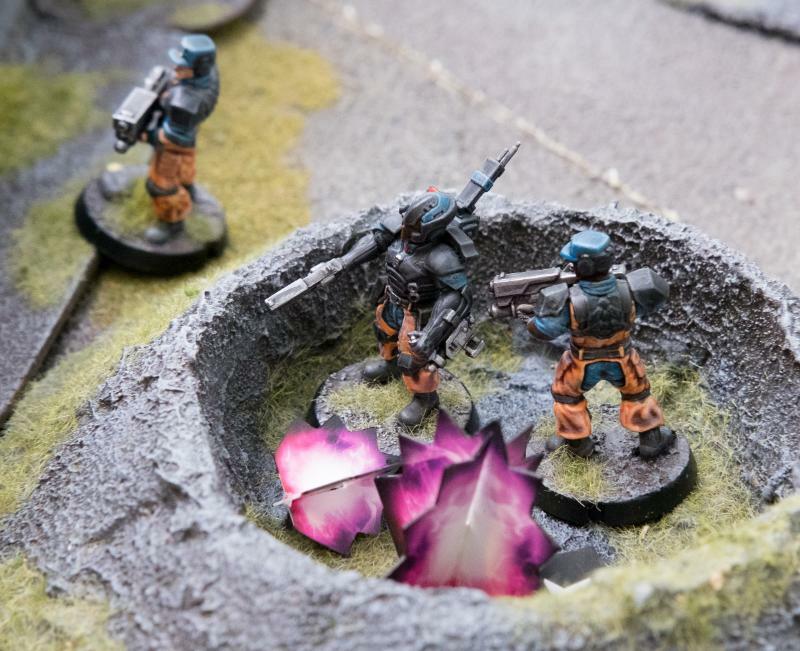 Engaging his reactor, he dashed into the nearby crater with superhuman speed and fired his gauntlet at the Drones attempting to hide from his troops behind a ruined wall. Being attacked from two sides, they had nowhere left to hide. 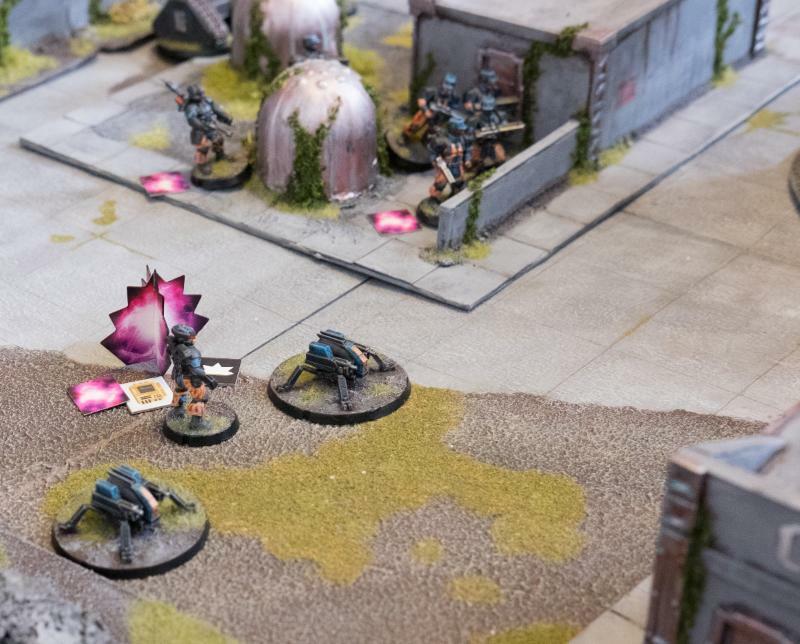 6th activation: The Kaddar Nova advance and fires, piling more suppression on the Spider drones but failing to destroy any despite denying their cover from this angle. 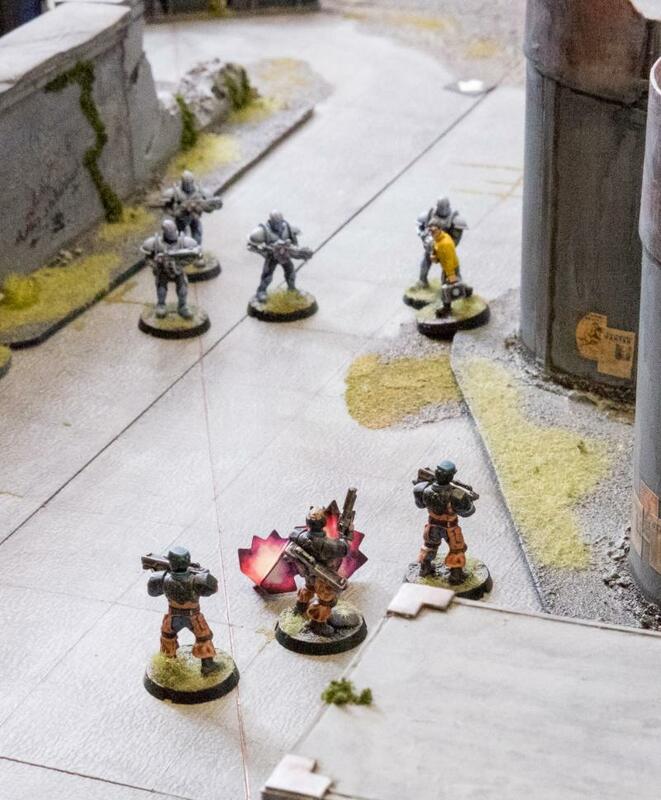 Samuel and his Troopers dragged their hostage along, pressing up further into the science centre and loosing some shots at the enemy individual who was threatening to corner Elyssa. 7th activation: The troopers Dash forward to keep contact with their objective and fire wild at the Journeyman, missing him, but adding 1 ST.
Bacaro had to think fast. 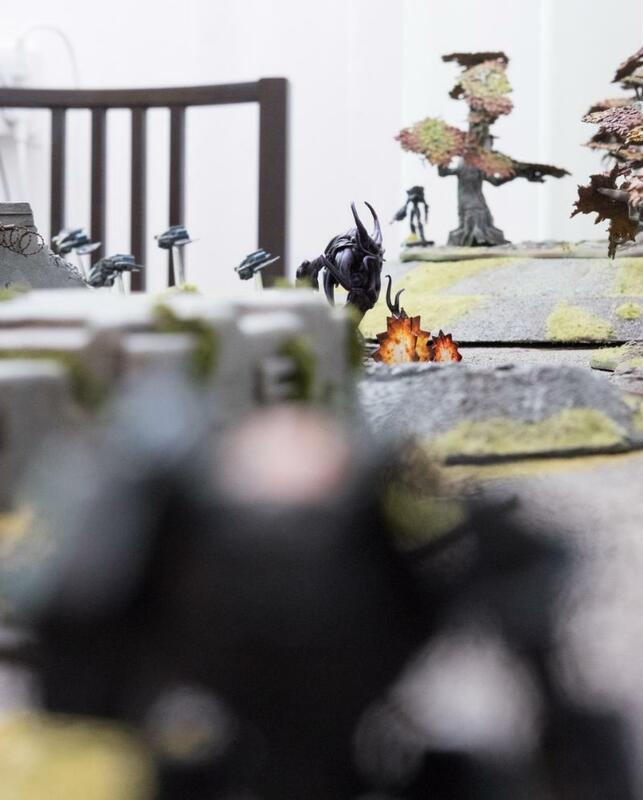 He had to deal with this assassin, but was now himself taken under fire by an enemy squad, and also witnessed his Spider Drones being cornered by what appeared to be the enemy leader, judging by the amount of shouting he was doing. 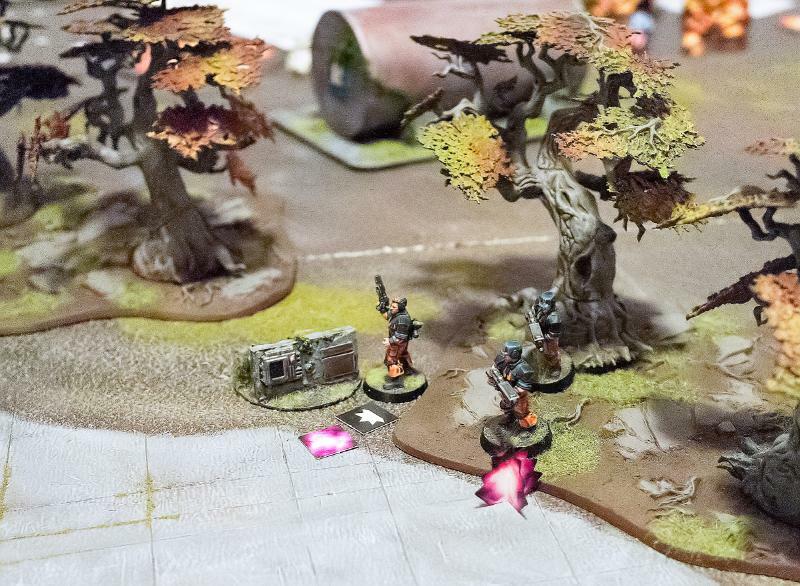 Quickly prioritising, Bacaro linked with his Scarecrow and aimed at the enemy leader. He must not have been his normal calm self, however, as he failed to hit with his Scarecrow’s railrifle. 8th activation: The Scarecrow gets an order to activate his protocols and selects the Hold & Fire action. 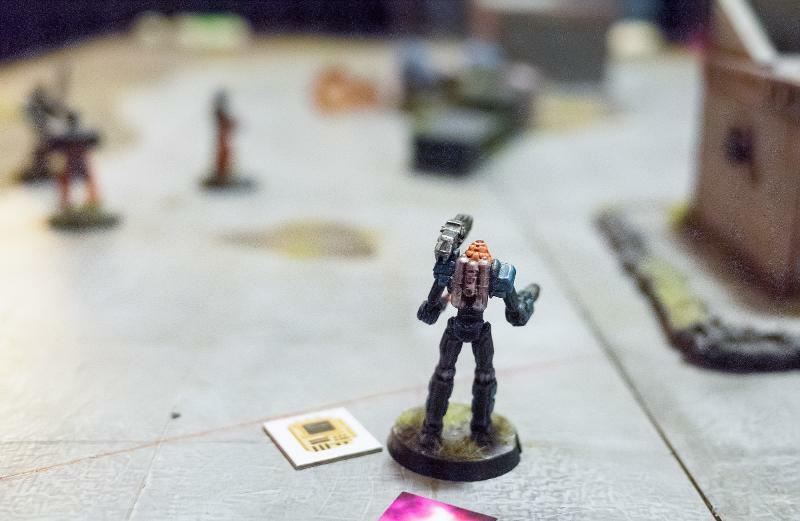 The robot gets a sniper hit on the Kaddar Nova, but then rolls a 1 to pen. Team leader Tromp couldn’t believe his eyes. Here was one of the scientists awkwardly running out from the cover of the silos into open ground, risking his life for apparently no good reason. Then he saw the reason for the scientist’s silly walk, he was bound at the wrists. A quick shout saw his team emerge from cover to secure this brave man who had seemingly escaped from Karist custody. 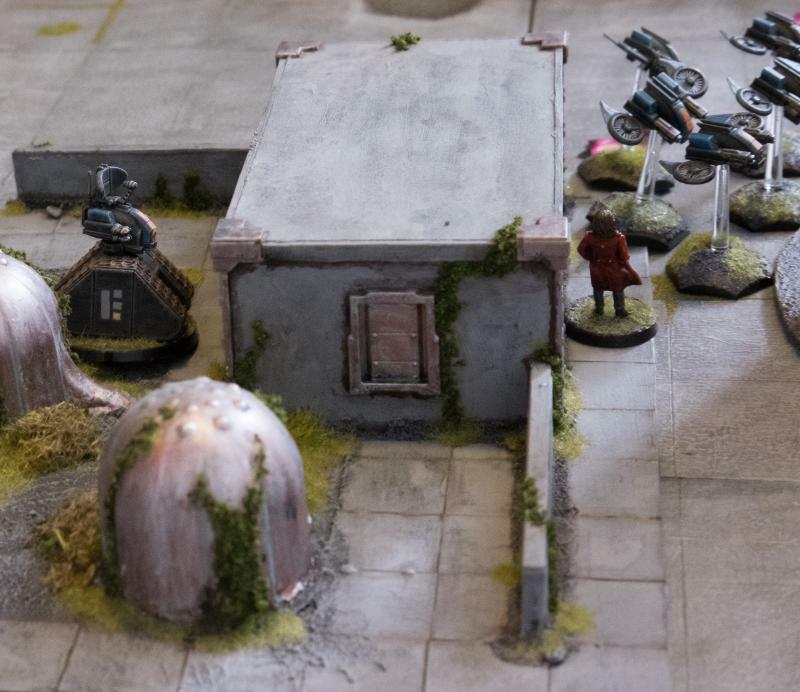 Cornering their building, Tromp saw the figure of the brutish assassin facing off against his commander. Taking aim, he shot his maglock rifle and grinned triumphantly as the enemy dropped to the ground. 9th activation: The Contractors Dash to claim the yellow VIP. We realised just after this shot that they can’t actually control both VIPs. Wild fire at the Shadow Walker does enough damage to drop her to FOR1. 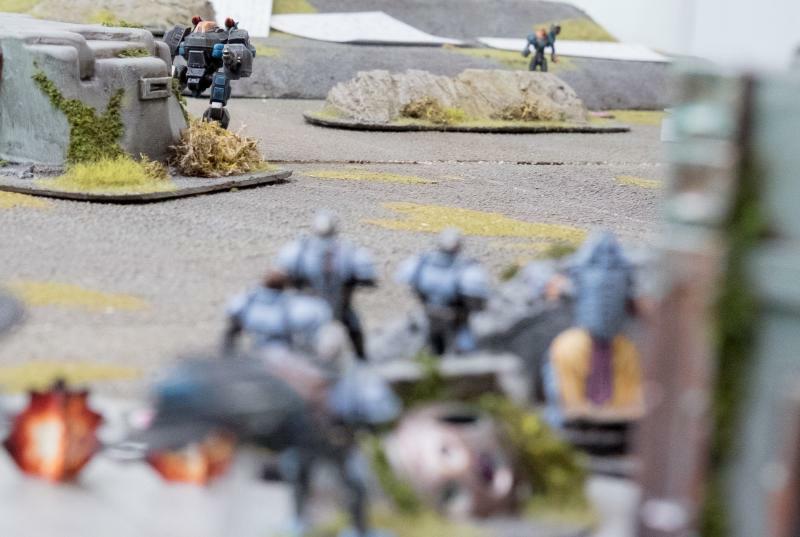 The Assault Troopers, watching as an enemy team breaks cover and secures one of the scientists, run out themselves and fire their grenade launchers straight at them. Better to lose the scientists than to have their enemy keep them. 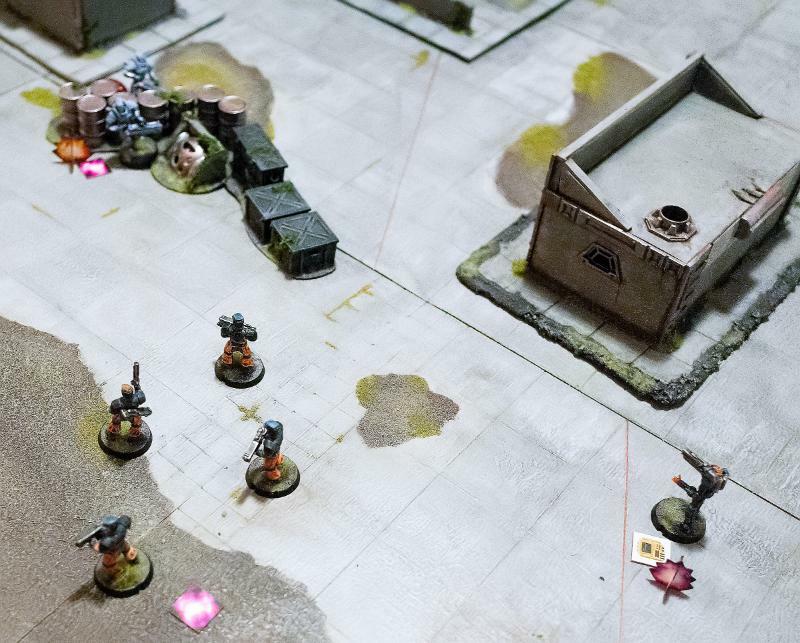 10th activation: The Assault Troopers Dash out, electing to be on the move, and fire wild at the Contractors. Again the blast templates cover many guys, resulting in 2 dead Contractors and 4 STs. Meanwhile, the little angels, having taken so much fire, fly off to the cover of a stack of crates to recover their nerves. 11th activation: The Minnows have to retreat, but do shake off all their STs. 12th activation: The Relay does nothing. This ends the second turn. The Karists score 10 points against the Epirians’ 11, making the score 23 for the Karists against 22 for the Epirians. Both sides have acquired the minimum number of points to win, so the first to lead his opponent by 3 will win the game. Points really add up fast in this mission as long as the artifacts remain unharmed. This is after the VIPs have been moved. The Karists claim priority, the Epirians spend 5 CPs to bring back the unit of Contractors. Seeing their protectors diminished to just three engineers, the nearby scientists disperse and run for cover. 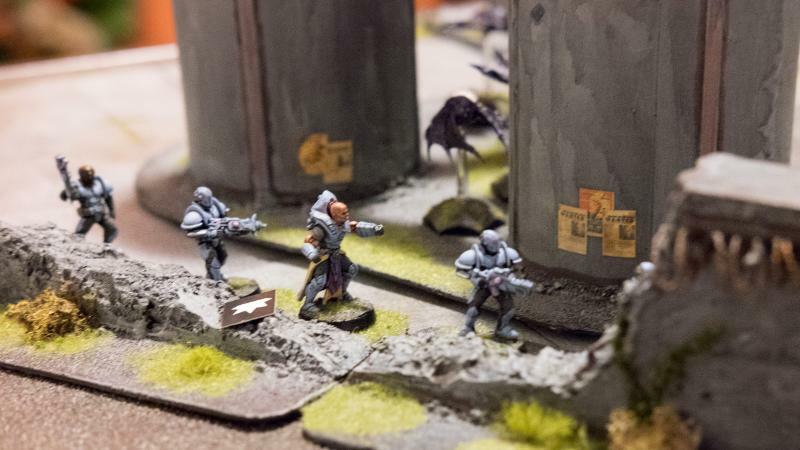 The Karist Assault Troopers waste no time in advancing further into the centre, ready to capture their prizes. On their advance they again fire their Rippers and Pulse Carbines into the Contractor team, none survive. 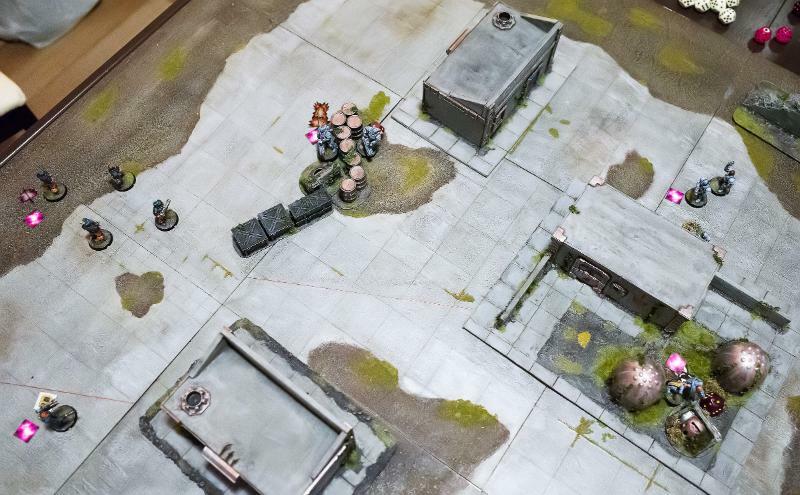 1st activation: The Contractors are not in cover and not on the move (so as to be able to capture an objective) and do no survive the round of fire from the Assault Troopers, who capture an objective on the way. Still determined to destroy the enemy leader, Bacaro again guides his Scarecrow’s fire. His increased focus pays off: the Karist priest drops behind the crater rim. Is he finished? 2nd activation: I have no image here, but the Scarecrow Holds and fires with activated protocols, but in the end only does enough damage to drop the Nova down 1 FOR. Having braved the chaos around him long enough to shoot down the enemy leader, Bacaro now hunkers down and takes another quick shot at the enemy assassin, but again he misses. 3rd activation: The Journeyman fails its activation check and digs in, his shots put 2 STs on the Shadow Walker. Elyssa and Myro exchange a quick look, which for these experienced friends is enough to understand each other’s plans and position. Although they are both wounded, they know they must now press on to finish the job. Elyssa turns to capture the scientist who just fled from her failing Epirian protectors. As she turns, she returns fire against the Epirian commander, but her aim suffers from the wound she took and her shots go wild. 4th activation: The Shadow Walker gets an order, removes 4 STs and advances towards an objective whilst firing at the bot handler for 2 STs. 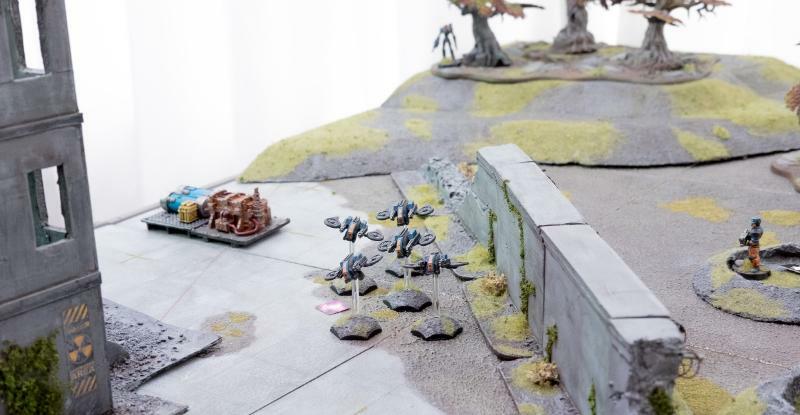 The Tempest Elites, now well in control of their part of the field, loose another salvo at the drones hiding behind the wall, making sure they do not interfere with their wounded commanders’ efforts to seize their prizes. 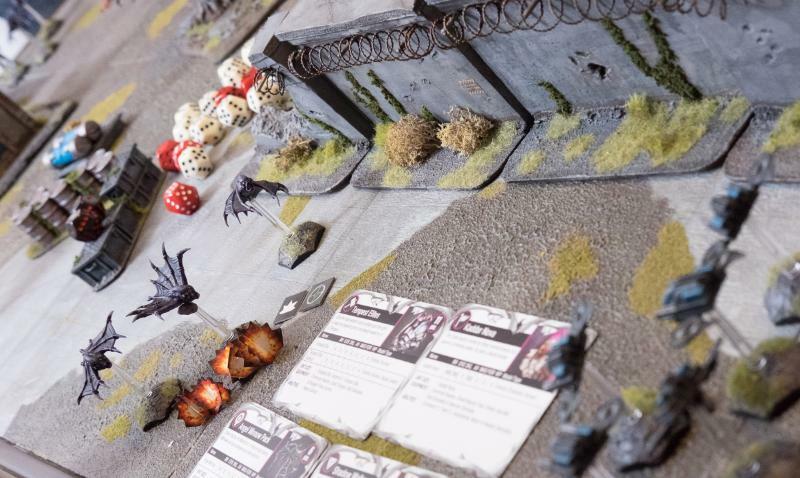 5th activation: The Tempests Advance & Fire at the Spider Drones, who are not only pinned but make good use of their protocols and discard most hits. They do take 6 STs. Freshly dropped off at the outskirts of the centre, only half understanding what’s going on, another team of Contractor Engineers arrives to assist Bacaro. 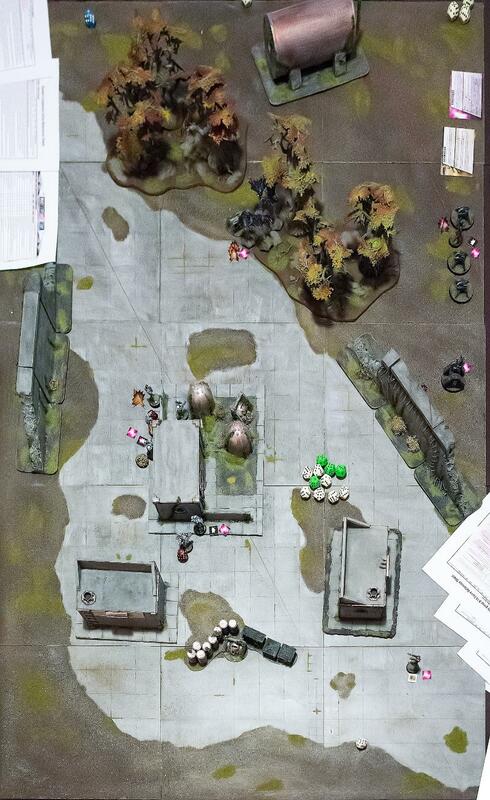 They waste no time in laying fire on the Karist Priest hiding amongst the craters, but cannot confirm a definite kill. 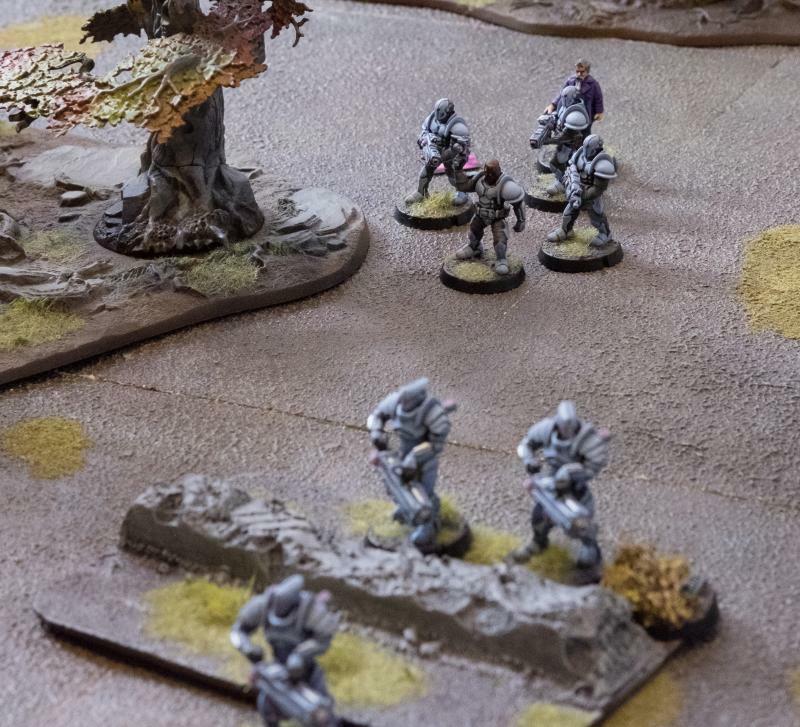 6th activation: One unit of Contractors returns as reinforcements, Dashing on to the field and firing wild at the Kaddar Nova, only causing 2 STs due to the priest being in cover. The Firefly Drones’ automated protocols instruct them to secure their flank, having driven off the small aliens. 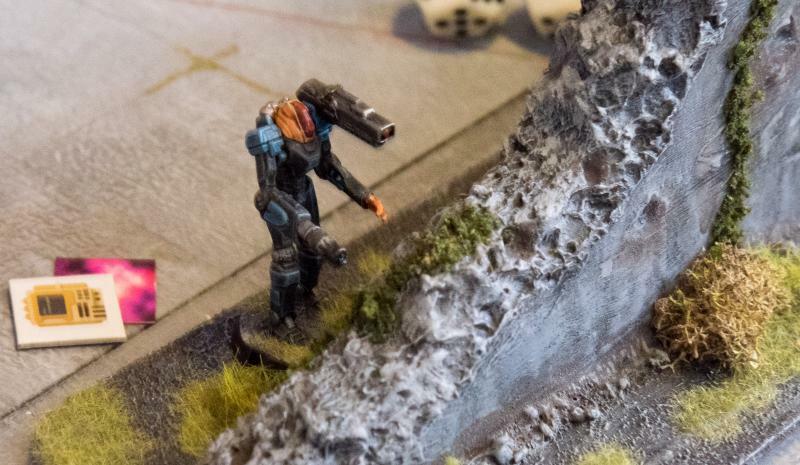 The little machines swoop over the wall and lock on their target: the Shadow Walker assassin. Engaging their high power laser, they bring down their foe and secure this position. 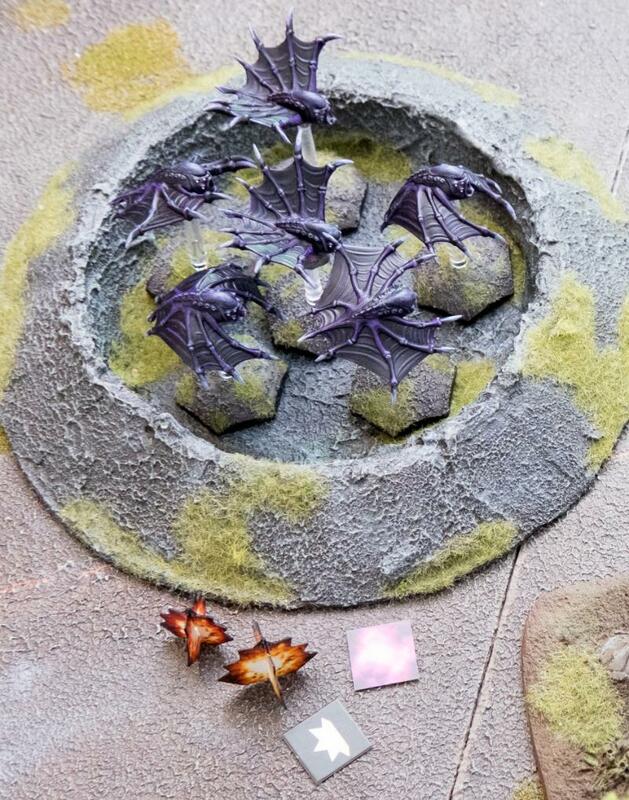 7th activation: The Fireflies Dash over here, in position to contest the objective, but manage to kill the Shadow Walker after taking 2STs from defensive fire. 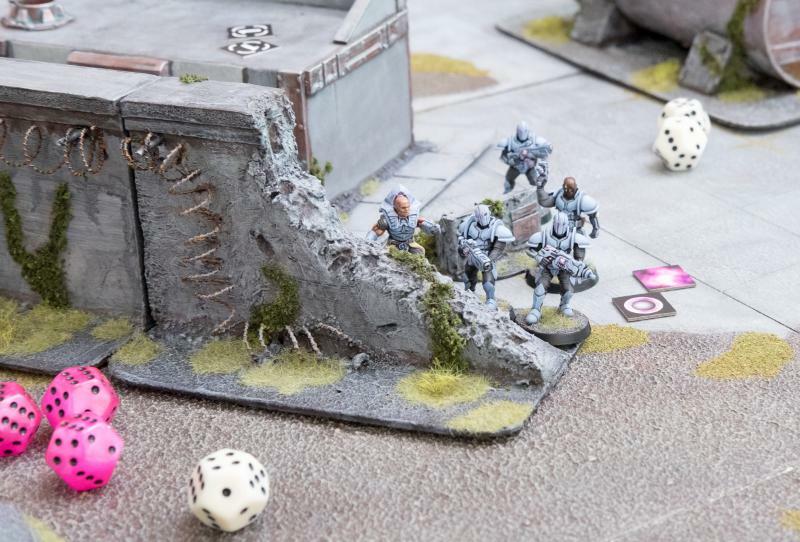 Meanwhile, the Karist Trooper squad continues to advance into the centre, pinning down the Drone squad with their shooting. 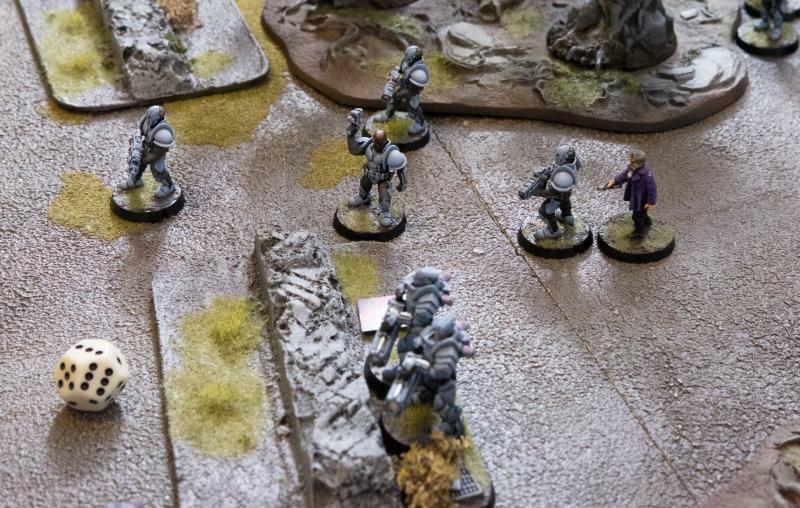 8th activation: Karist Troopers advance and fire, keeping in touch with their objective. 9th activation: The remaining Minnows Dash and shoot at the Epirian artifact, managing to take it down 1 FOR. 10th activation: The relay does nothing. Kasero is relieved to see reinforcements enter the field. Choosing tact over valor, he retreats his Spiders to hook up with the reinforcements and take on the enemy together. 11th activation (no image): Spider Drones have to retreat, and shake off 7 STs. Kaddar Nova Myro watched in horror as the pack of Fireflies suddenly raced across the wall and doused Elyssa in bright laser fire. She went down, and didn’t rise again. In his heart Myro knew she was done for. Feeling suddenly very weak, Myro clambered out of the crater and sought protection near his Tempests at the edge of the forest. 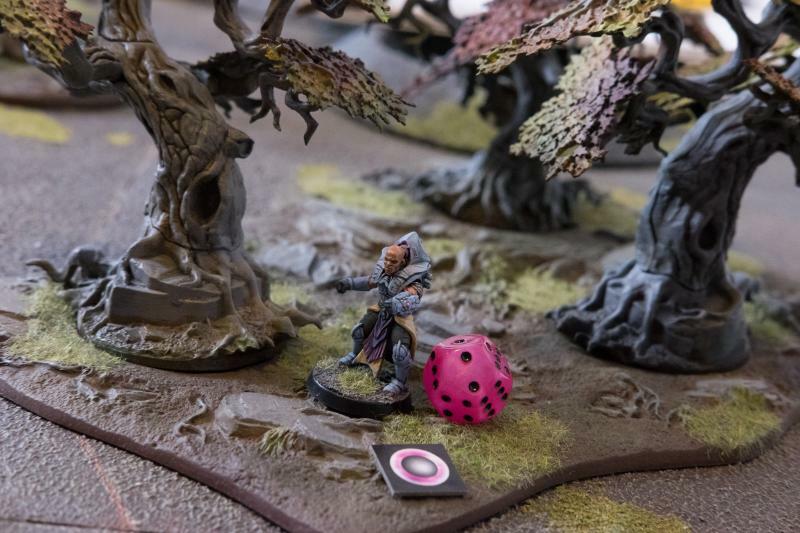 12th activation: Putting his reactor in Shield mode, the Kaddar Nova is forced to retreat and moves into the woods. At the end of turn 3, the Karists score 13 points: an undamaged artifact for 8, two VIPs and the faction objective. The Epirians only score 4: a damaged but undestroyed artifact and the faction objective. This means the Karists take a decisive lead and win the game! There were some interesting swings in this game, but in the end the Epirian’s failure to damage the Karist artifact and sometimes brutal consequences of forgetting to sufficiently disperse his troops brought defeat. It’s really cool to come to understand the importance of the various rules elements in MEdge that you can’t really get a feel for without playing some games. So far the Epirian player has a little more difficulty making the most of his forces. They lack some of the rock hard firepower of the Tempests and seem to need a little more finesse than we can display in these first two teaching games. As for this mission, the wandering VIPs really keep everyone moving which is neat, and the artifacts really need to be taken care of starting turn 1, considering the amount of points they give out each turn if left undamaged. Having painted up my Maelstrom’s Edge forces and terrain, I figured it was high time to get them to the table. I got my brothers to come over for a teaching game. Instead of starting small, I figured I’d work something out that would show pretty much the full depth of the game and almost all the units. We just worked through a couple of turns to get an idea of what MEdge is all about, and will be following up with some actual small games to really get into it. Hopefully soon. If you’ve no idea how the game works, the most important bit to know is that MEdge uses alternating activation, which means the attackers starts using one of his units, then the defender uses one or two units, then the attacker uses one or two units, and so on. The other thing you need to know is that suppressing units by placing Suppression Tokens (STs) is as important as actually killing them. For a little more info on the game, look here. I’ve neglected to take very many overview shots, but there’s a couple: pink are the Karist forces, yellow the Epirians. Numbers in front of unit names denote the turn and activation, so ‘2/5’ is the fifth unit activation in the second turn. Orange arrows show movement, white shows shooting. 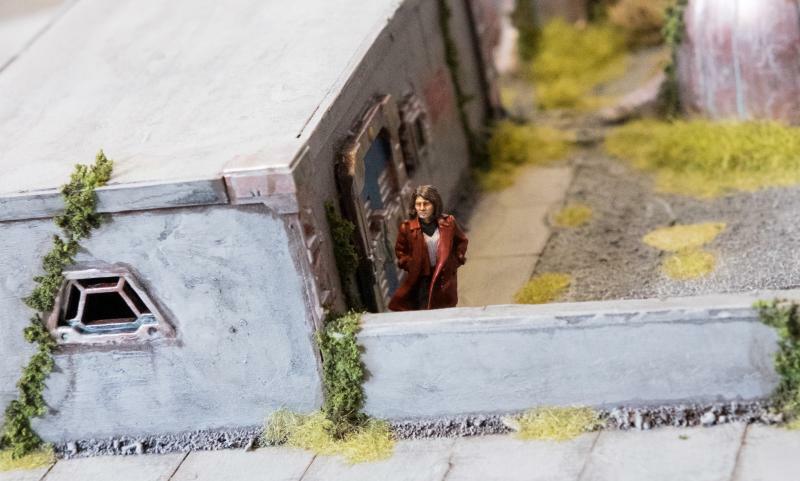 The Tusculi Compound is surrounded by a wall, now mostly crumbled, and borders the Arran woods to the south, where a small bunker guards the T-intersection between two dirt roads, one leg of which leads into the compound. Blast craters line the road, remains of the construction work for this compound. Most buildings are still standing, but the large machine workshop was destroyed in a fire, tragically killing three employees. This was one of the reasons for closing the compound that was already struggling to justify its continued operation. All terrain was assigned cover value 2. 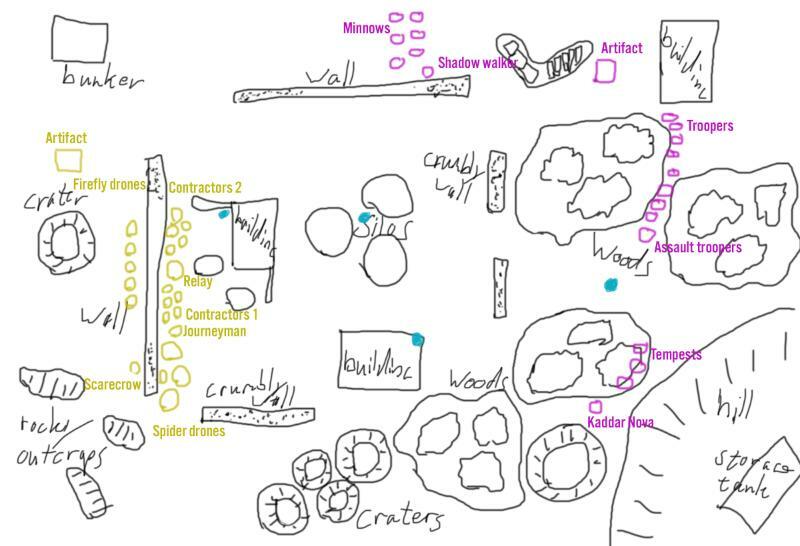 The woods, ruin and craters are all area terrain, the rocky outcrops, buildings and the walls of the ruin are obstacles. We didn’t use the actual building rules, so units couldn’t enter. As the Compound came into view, Journeyman Bacaro ordered his troops to dismount their prowlers and directed them to their positions. He had advised against moving against the compound with the few troops he had available at such short notice, but Command would have no delay. The amount of movement visible inside the compound on his sat image link was worrying… Nobody knew anything. There had been an attack, yes, a large alien creature had been spotted by one of the guards, for whatever that was worth. At night and with this weather, that was all the info Command had been able to gather. He’d soon find out what was going on. 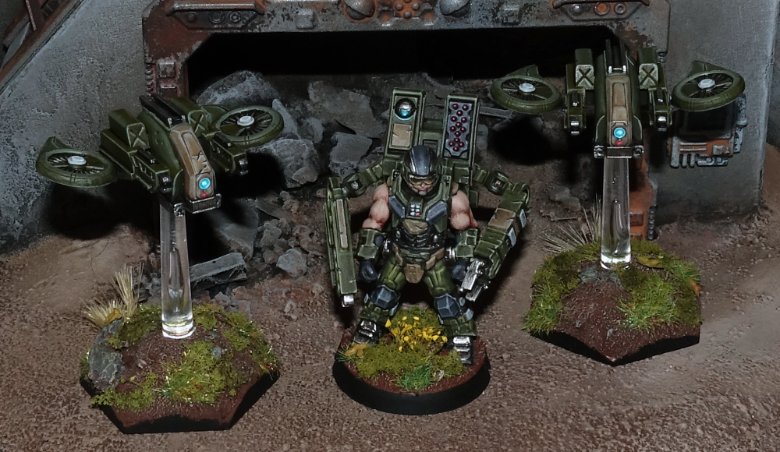 A Hunter warmech with 2 Strike missile pods, a Maglock chaingun and a Flakk cannon (see Contractor image above). We played the ‘Purple gold’ mission. 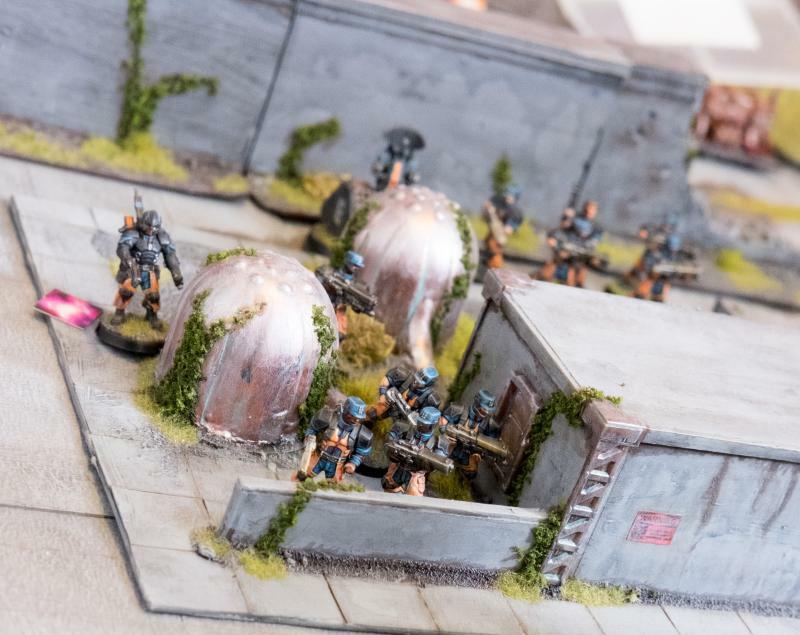 This means players get points for controlling the three Cybel refinery objective markers, and also for destroying large parts of the enemy force. The game runs for 5 turns or until someone reaches 18 points (and the other has at most 15). The Epirians were the attackers for this game. The Karists therefore got to place the number the Epirians bid to be attacker, being 2, as Suppression Tokens (STs) and did so on the Journeyman’s unit. Journeyman Bacaro heard the voice of his commanding officer resonate over the radio “Don’t let them get at the Cybel energy!”. Though the Compound had been cleared ages ago, small stores of energy around the compound were left behind. These stores were accessible through terminals scattered over the compound, one of which was located near the small bunker guarding the road intersection. 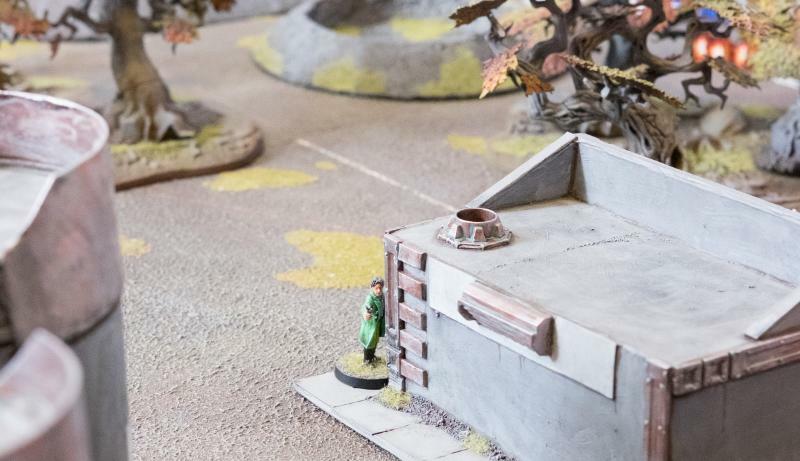 Bacaro decided to direct his unit to this bunker and secure the terminal. 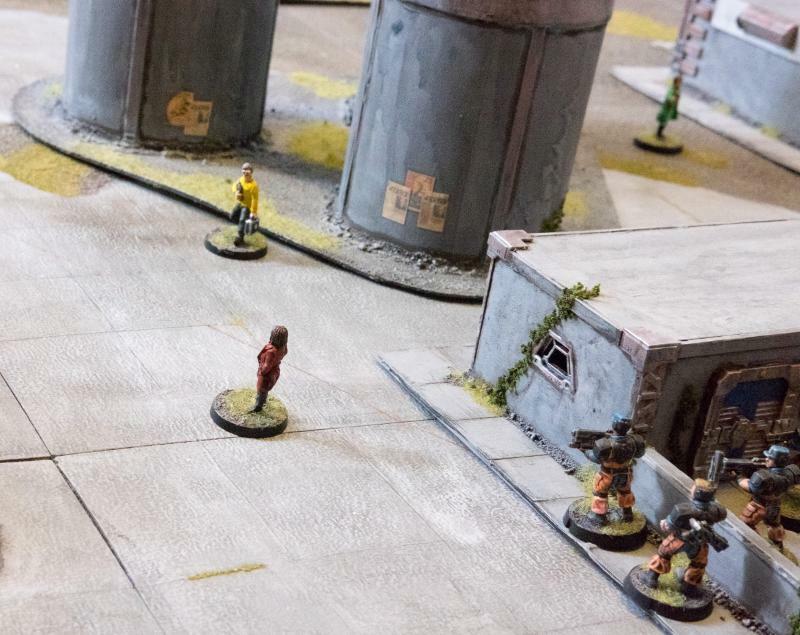 As they approached the small grey death box at a run, Bacaro noticed a group of armoured individuals occupying the parapet on one of the big silos just beyond the compound wall. He immediately signed to his unit to fire their grenade launchers. He could see their target ducking behind the parapet as the choke grenades fell, but when the smoke cleared they stood up again defiantly. This was going to be a rough morning. 1st activation: Handler’s unit Dashes to objective and fires wild at Tempests. 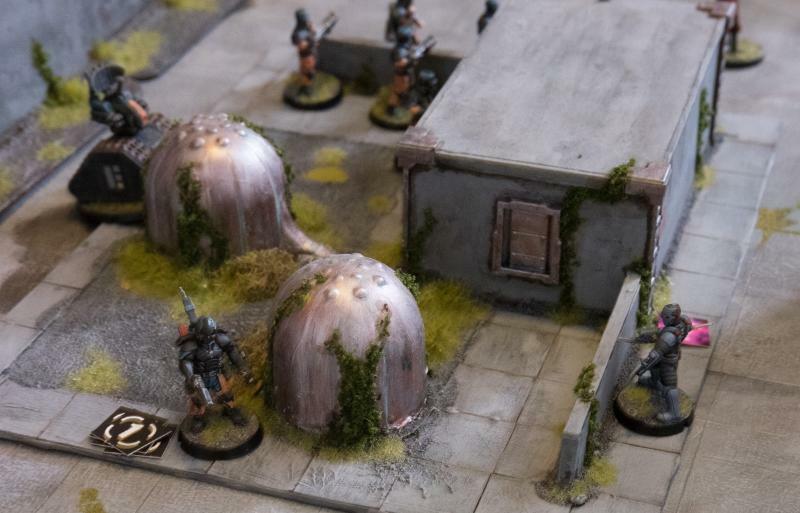 Packed on the silo, the choke grenades cover two Tempests and get a 6 needed to hit, ignoring cover, then a 5 to pen for a damage, resulting in 3STs in total (1 from damage, 1 from being a target, 1 from the suppress ability of the grenade launchers). Not a bad start. Immediately fire was returned from atop the silo. 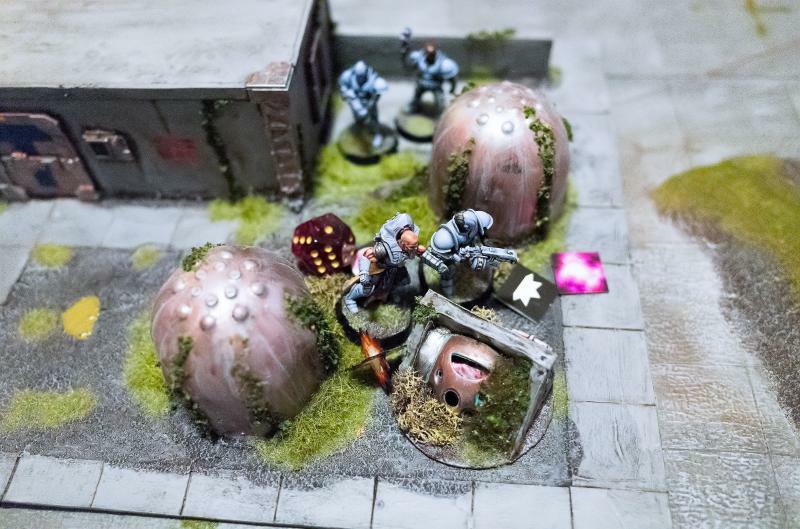 Their own grenade launchers looked like toys compared to the huge energy balls that erupted from the weapons of their enemy. 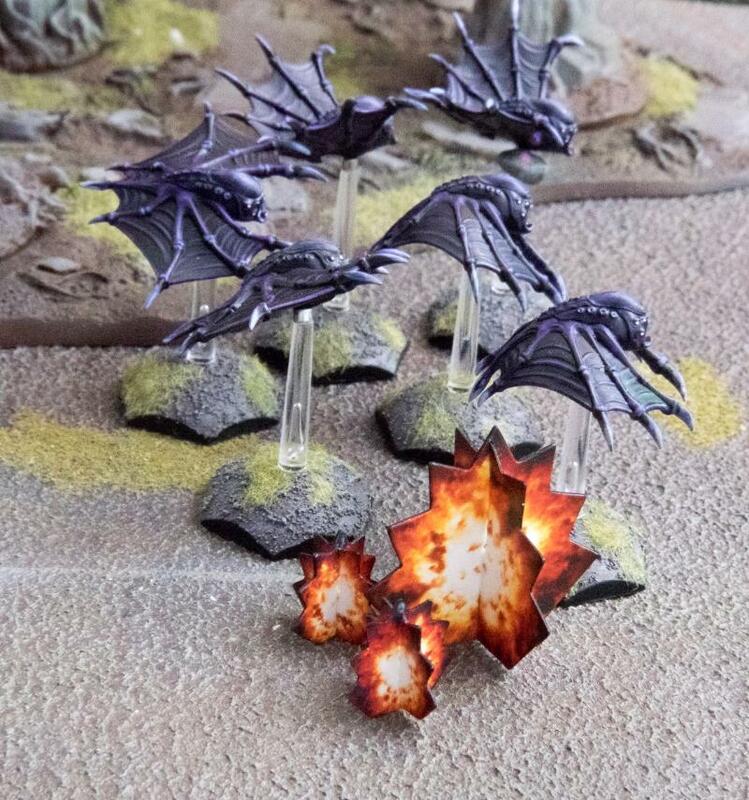 His troops jumped for cover as the purple balls exploded in their vicinity and Bacaro himself was knocked over by the shock of the explosions. Shrugging off the dust, a quick glance told him his men were alright, though looking scared. Their foe meant business. 2nd activation: The tempests get an order, removing 1 St which lets them pass the activation check on 2+ instead of 3+. They choose Hold & Fire, and ‘focused fire’ back at the Bot Handler. They fail to cause any penetrating hits, but do manage to put 5 STs on them. They shake off all their own remaining STs. Kaddar Nova Myro surveyed the scene in front of him. The Epirians had arrived and were treated to a welcoming volley from his trusted Tempest Elites. No sooner had he seen the Epirians jump for cover than another blast was felt from behind the walls. Turning his head, he saw his most powerful weapon, Voxai, appear from nowhere in the midst of the advancing Epirian troops. A small swarm of Drones flying in the area was seen darting around to avoid being hit by the mighty Angel’s mysterious tentacles. 3rd activation (no pic here, sorry): The Angel assumes a winged form and teleports in a Dash action amidst the Epirian lines, causing a shockwave that puts STs on the nearby Fireflies and Contractors. It shoots the Fireflies and causes two hits, but the nimble drones dodge both (they are deployed on the move), but do take 3 STs. Bacaro had never before seen a beast like this, but here it was in this middle of his lines. It must be one of those Angels he’d heard talk of. Immediately he linked his mind with the most destructive element in his force, the Hunter warmech. The robot emerged from the woods to draw a line of sight to the Angel on the other side of the field. 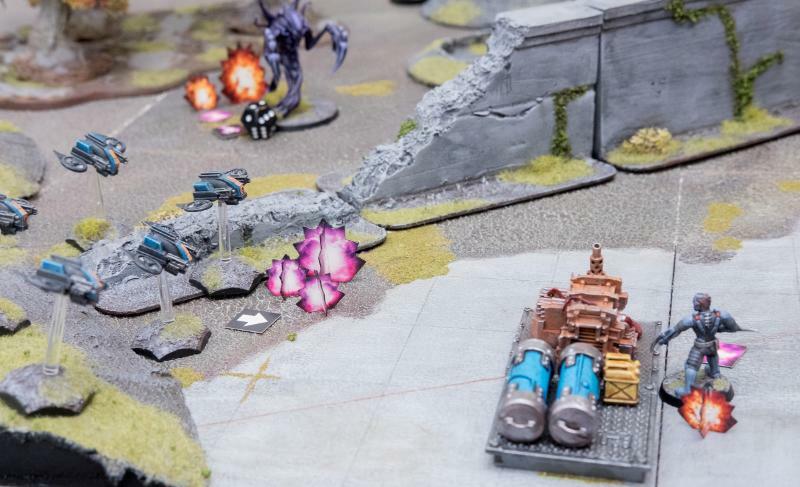 As soon as its large frame emerged from behind the bunker, two missiles swooshed over Bacaro’s head, followed by the huge Maglock Chaingun’s distinctive burst. The Angel flapped its wings to avoid the Hunter’s barrage, but with only limited success. Bacaro watched it plunge to the ground and balled his fist at this accomplishment, only to see the terrible dark form arise again. 4th activation: The Hunter senses an opportunity to get into the rear arc of the Angel. The Handler activates its Lock-on protocol with an order. In an Advance & Fire action, the Hunter makes its 1 allowed pivot, then moves to get a better line of sight behind the bunker. 2 Strike missiles and the Maglock Chaingun let loose at 2+ to hit. 1 missile gets dodged by the winged Angel, but nevertheless 9 damage is caused with some great dice rolling, dropping the Angel to FOR1, and 7STs. Bacaro had no time to pay further attention to the giant alien. His unit was now under fire from a squad appearing behind a row of barrels inside the compound. Looking round, he could still see all of his squad members, but they were in no position to do anything useful as long as they were kept under fire like this. 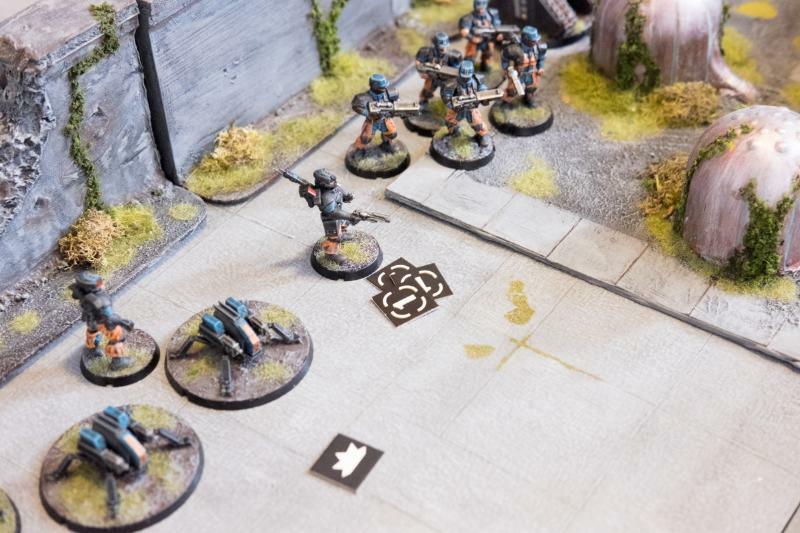 5th activation: The Assault Troopers move to claim their faction objective and fire at the well dispersed Contractors, reducing the effectiveness of the Ripper Grenade launchers. Ignoring cover, some hits get through, but none penetrate. The unit suffers 3 more STs and is now heavily suppressed. 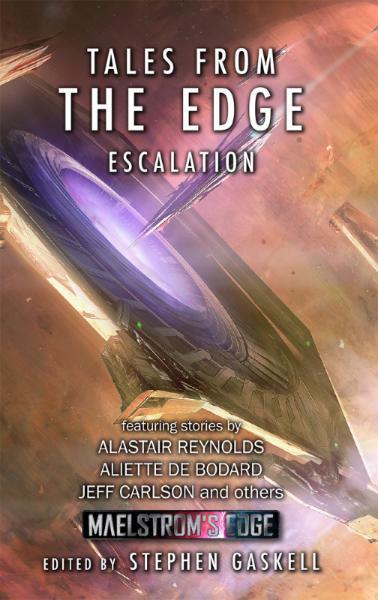 Kaddar Myro engaged the boost mode on his reactor pack and led his squad in a dash towards the Cybel energy terminal located near the crew cabin, keeping themselves between the building and the wall. It was imperative that the Epirians not shut down these sources of energy for good. The nearest Epirian troops were already keeping their heads well down after the barrage by the Tempests and the assault troops, but Myro ordered his own squad to fire their way as well. If he could chase off these first Epirian forces now, he’d do the Karist cause so much good. 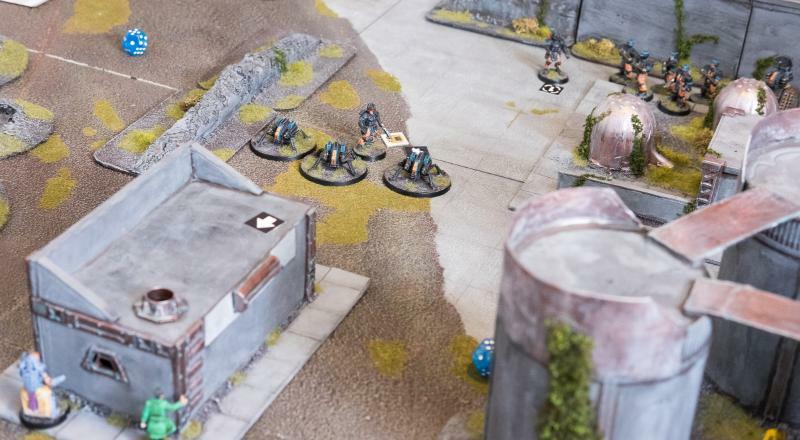 6th activation: The Kaddar Nova, with reactor in kinetic boost mode, and his unit Dash to a Cybel refinery objective, electing to be on the move. Wild fire from the Carbines puts 3 more STs on the Bot Handler unit. Here’s an overview of the first 6 activations. Orange is movement, white is shooting (and the Angel’s shockwave). “1/4” means 4th activation on the first turn. 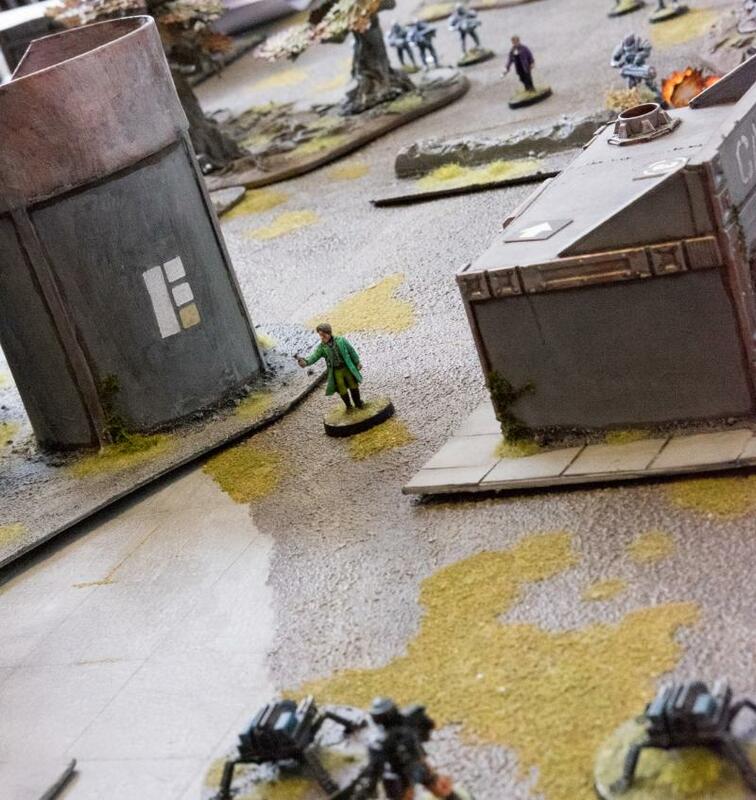 Meanwhile, Apprentice Bot Handler Kasero followed his chief’s lead and directed his squad of Spider Drones to pour their fire into the menacing alien, at the same time keeping low to avoid getting caught in the crossfire that was causing Bacaro so much trouble. Unfortunately, the winged creature didn’t seem much impressed by the Drones’ machine guns. 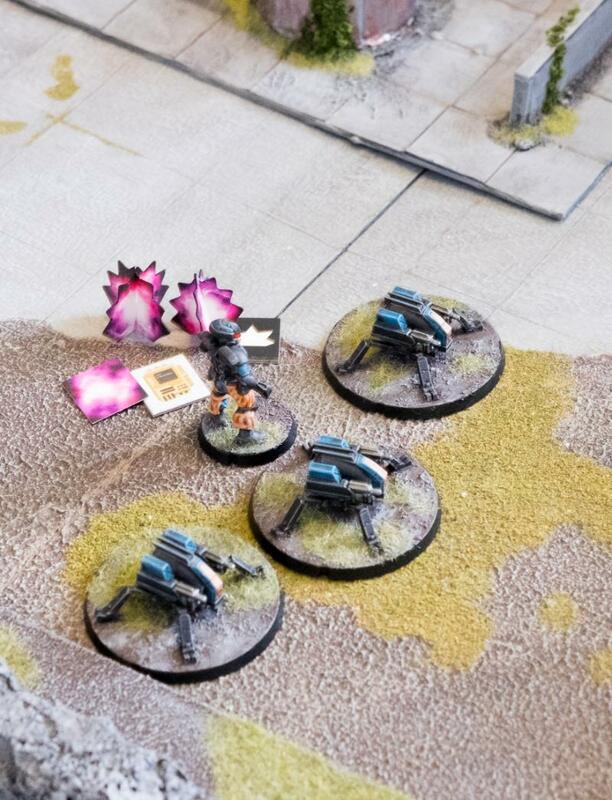 7th activation: The Spider Drone unit digs in, puts a damage on the Angel with their light machine guns, firing wild, for 3 STs (target, damage, dodge). Joining the robot attack force, the northern Scarecrow also pointed its precision Railrifle at the Angel, but the unnatural alien flapped its wings in defiance and easily shrugged off the Scarecrow’s shots. 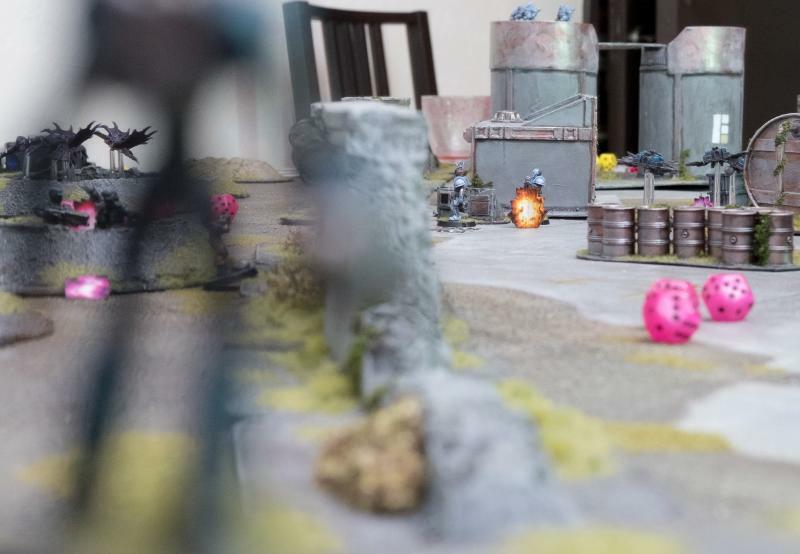 8th activation (no pic): The Scarecrow in the high corner, with Chemtek sprayer, chooses a hold and fire action, and fires a round of suppressive fire. He’s just out of range for Rapid Fire protocols to be enabled, but causes 3STs on the Angel (damage, dodge, target). Choosing Hold & Fire was a mistake because the Angel, being a behemoth, is fearless and doesn’t take suppressive fire discipline checks. Sensing that their kin was under threat, the Angel Minnow Pack screeched and took off towards the nearest enemy, the team of Contractors in the woods. A mass of Cybel Pulses erupted from their gaping mouths. One of the Contractors fell down and didn’t rise again. 9th activation: The Minnows Dash over to the Contractors in the woods and do enough damage to kill 1. Up in the hills to the south a second Scarecrow followed its automated combat systems and resolved to join the fray, advancing to gain a clearer field of view into the combat. 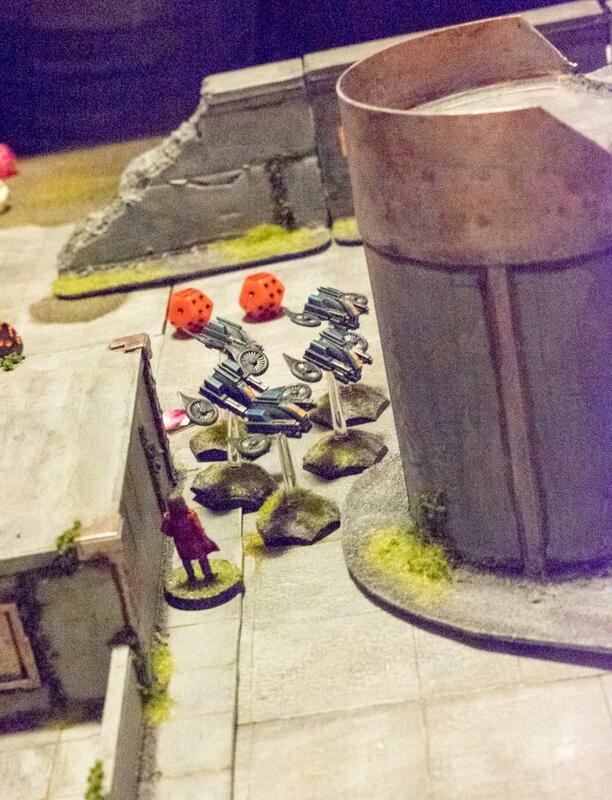 Its railrifle targeted the Karists near the entrance, but didn’t manage to hit the well concealed troopers. 10th activation: The lower Scarecrow, with clingfire sprayer, Advance and Fires and shoots the Nova unit. With a double 1, not much luck, but he does cause 1 ST.
As the fight over the compound started in earnest, Bacaro shifted his attention to the south, where a second flock of alien creatures had engaged his force. They were coming from all sides. The Contractors advancing on this side of the field had suffered a casualty and were dawdling. Any more of this and the fight would be over before it truly began. He hailed the team leader over the comm link and gave off an order to secure their position and focus on this new group of aliens. Momentarily the distinctive ‘thump’ of grenade launchers sounded from the woods and puffs of smoke emerged around the flock of aliens, which seemed to at least distract them for now. 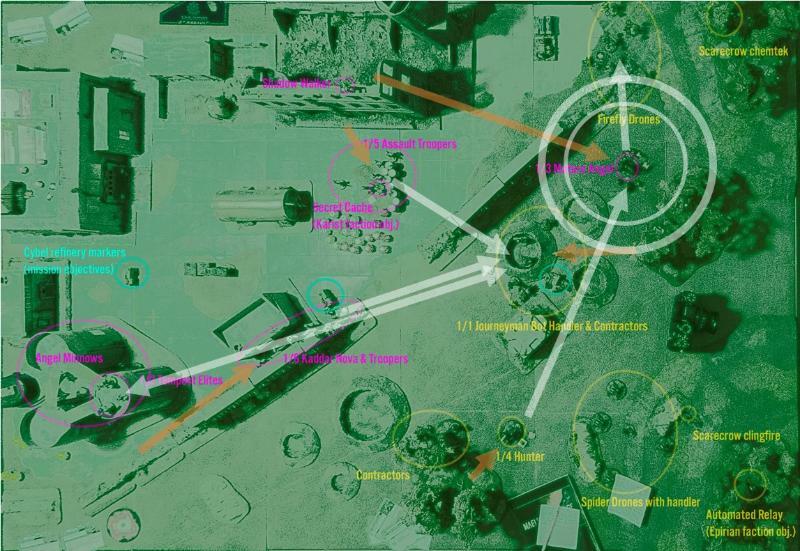 11th activation: The Contractors in the woods get an order and go from 4 to 2 STs. They still fail the discipline check, but can at least choose to Dig In. They shoot the Angels, who are immune to the Poison ability on the choke grenades. Being mobile they dodge 1 hit and take just 1 damage. 4 STs are caused (target, damage, suppress, dodge), and the Contractors shake off their own STs. High above the field of battle, the Karist Shadow Walker Elyssa stood assessing the flow of events. 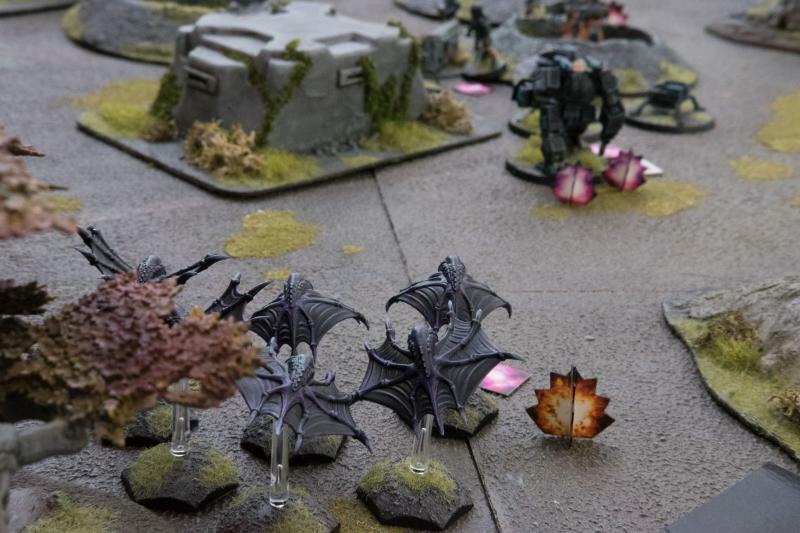 The Angels were doing a good job striking at the enemy’s flanks, whilst what seemed to be the Epirian command squad was completely pinned down by fire from the Tempests, the assault troopers and Myro’s squad. To her left, a flock of Drones emerged from the woods. These would be able to circle around the flank and attack the Karists in the rear. Using her rift suit, Elyssa teleported to block their advance. Loosing a few shots at the Drones made them perform evasive action, halting their progress for a second. 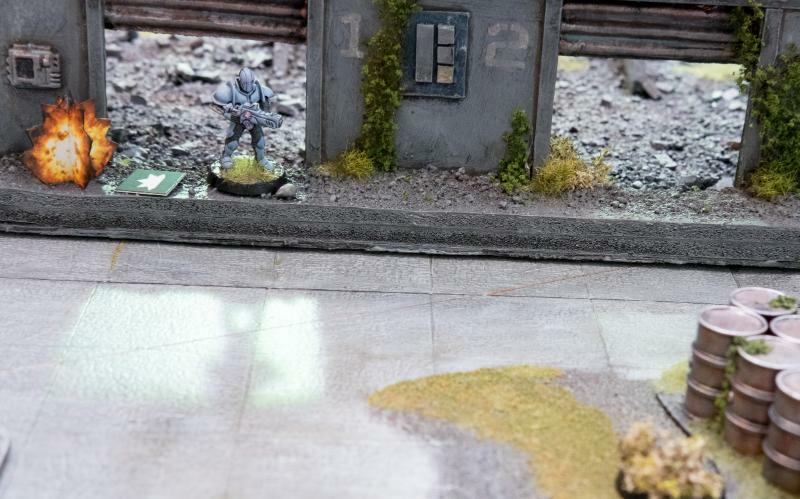 12th activation: The Shadow Walker Dashes, utilising open ground bonus movement, to the cover of the crates and generator, taking 2STs for doing so (I think we made a mistake here. Can’t remember for sure, but I think this was a teleport move, which doesn’t allow open ground bonus movement). Its shots put 3 STs on the dodging Fireflies, after which 1 ST is shaken off. 13th activation: The automated relay is activated and does nothing (it will generate a victory point at the end of the turn). The Firefly Drones were following the course set in advance by Bacaro, but dithered, first as the giant Angel appeared to the south and then as another enemy entity suddenly appeared in front of them, taking them under fire. Without guidance from a Handler, the automated protocols determined it would be best to fly back into the cover of the woods, where they stopped and reassessed the situation, ready to move out again. 14th activation: The Fireflies are shell-shocked due to the Fearsome units around it (specifically the Angel at Fearsome (2)). They take a Shaken action, and must retreat due to nearby enemies. Flying into the woods with a normal (not dynamic) move, they roll well and shake off all STs. Turn 1 ends with each side taking 3 points (2 for a refinery each, 1 for faction objectives). Turn 2 sees the Karists win the priority roll, giving it the Epirians. 3 Command Points (CPs) are generated for the Karists, total now 4, and 4 CPs for the Epirians. As the Angel now seemed to have driven off the Firefly Drones, Bacaro was confirmed in his belief that the main priority was to destroy the creature. Once more linking with his Hunter, he guided the robot’s fire. Again, one found its mark and struck the Angel in its core. As suddenly as the Angel had appeared, as suddenly it was now gone entirely. Never before had Bacaro been so relieved at the support of his trusty Hunter. 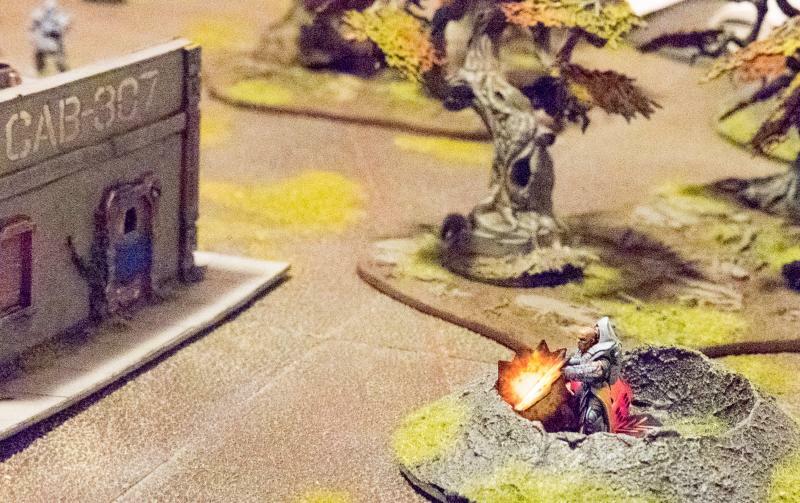 1st activation (no pic): the Hunter gets a lock on order, Advances to a better position with open ground bonus movement and focused fires at the Angel. 1 Strike missile gets dodged, but the rest hits and penetrates, killing the Angel. Unfortunately, there is no explosion. Spectacular start from the Hunter. Just after destroying the northern alien threat, the Hunter was now targeted itself by aliens from the south. The flock of smaller Angels that had done for one of his Contractors was now spitting lethal energy at the Hunter, but its bulky frame could easily take it. 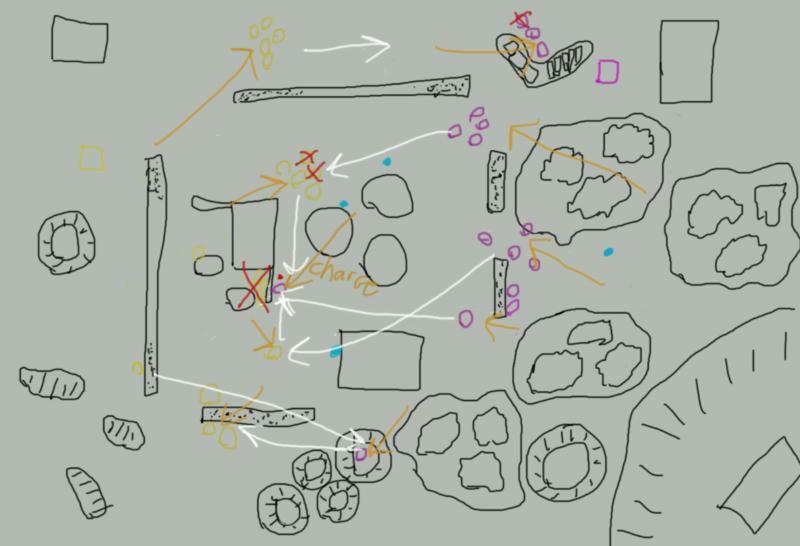 2nd activation: the Minnows Dash to avenge their kin, with a 20” dynamic move they get into position behind the Hunter. Unlucky with the penetration rolls, all they manage Is to put 2STs on the Hunter. Having seen off the Fireflies, only to watch as a giant robot caused the apparent destruction of Voxai, Elyssa ran back into the ruins. Without the big Angel’s support, she wasn’t safe here. Besides, they were here with a more important task than fighting Epirians. The Cybel energy needed to be collected so that they could at least bring a part of it if they were forced to retreat. Elyssa determined to move off towards the terminal they discovered near the silos occupied by the Tempests and see how much was to be gained there. 3rd activation: the Shadow Walker Dashes back up into the ruins with a dynamic move, getting 2 STs and not managing to shake off her total. With the field now apparently free of threats, the Fireflies again engaged their engines and moved back towards their original goal. 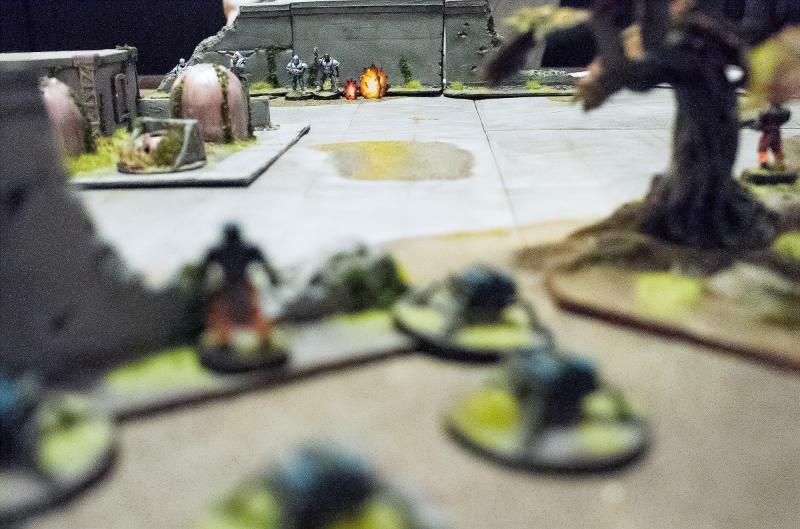 Spotting a squad of enemies in their track, they powered their laser system and transmitted information as to this enemy’s position to the force. 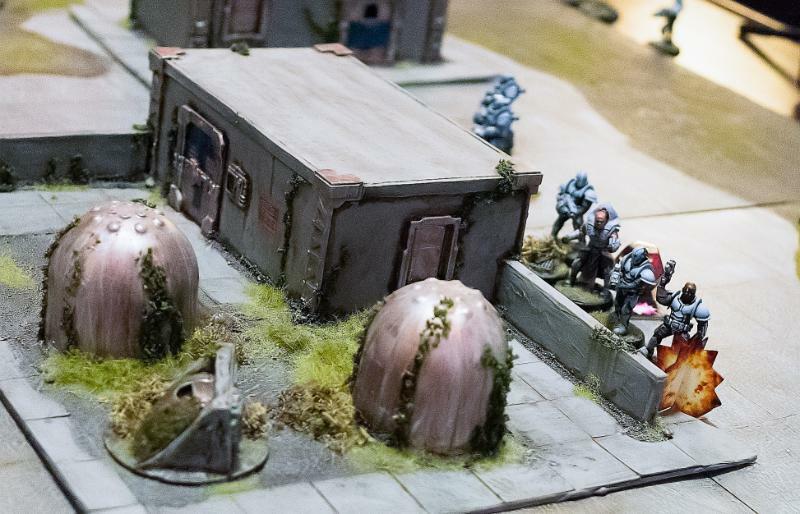 5th activation: The Bot Handler orders his Contractors so they are no longer shell-shocked, but they’re still forced to retreat slightly, managing to keep control of the objective. They only shake off 3 STs, leaving them very suppressed. 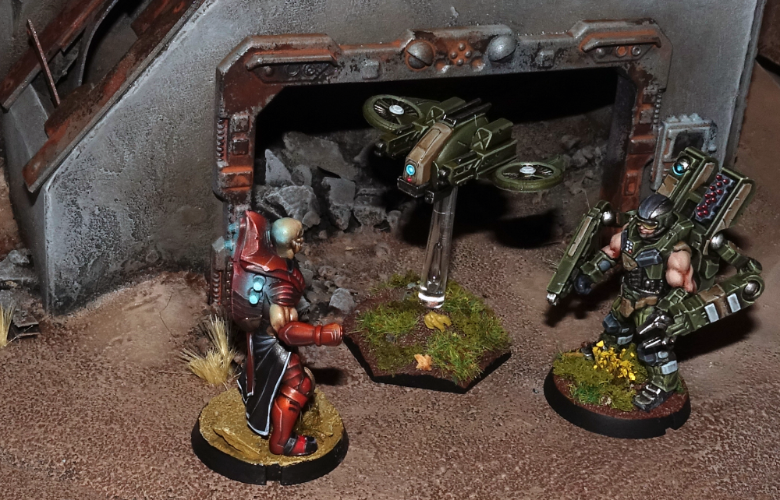 Myro, witnessing the loss of Voxai, determined he needed to press on whilst the enemy was still on the back foot. 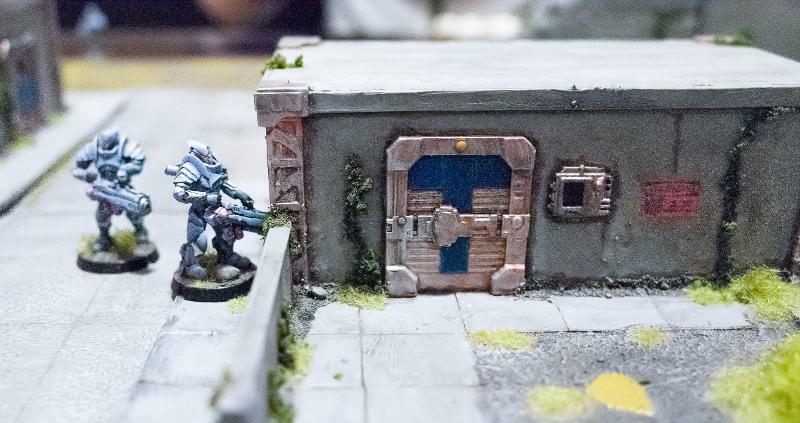 Engaging his reactor’s shield mode, he led his unit towards the entrance to the compound, at once reaching an energy terminal and taking up a central position behind the wall. His unit opened fire at the leading Epirians again as they were seen to move back into the craters behind the bunker. 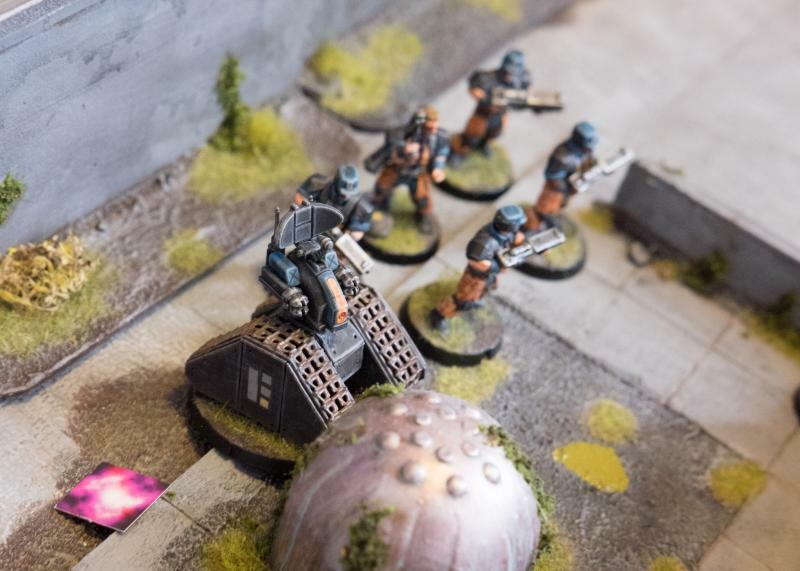 6th activation: The Kaddar Nova and his unit Advance and Fire, with the reactor now in shield mode, and the poor Handler again as target. The Gauntlet misses and 3 other hits are discarded due to pinning, but 4 STs are added to the total. 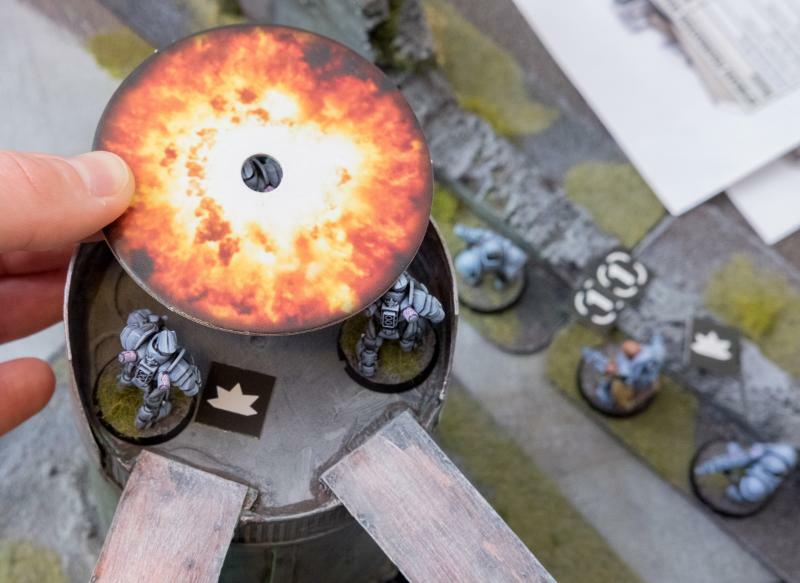 Atop the silos, the Tempest Elites pointed their mortars at the Contractors who were now ready to attack the Minnow pack to the rear. A hail of mortar fire landed in the woods and another Contractor fell. 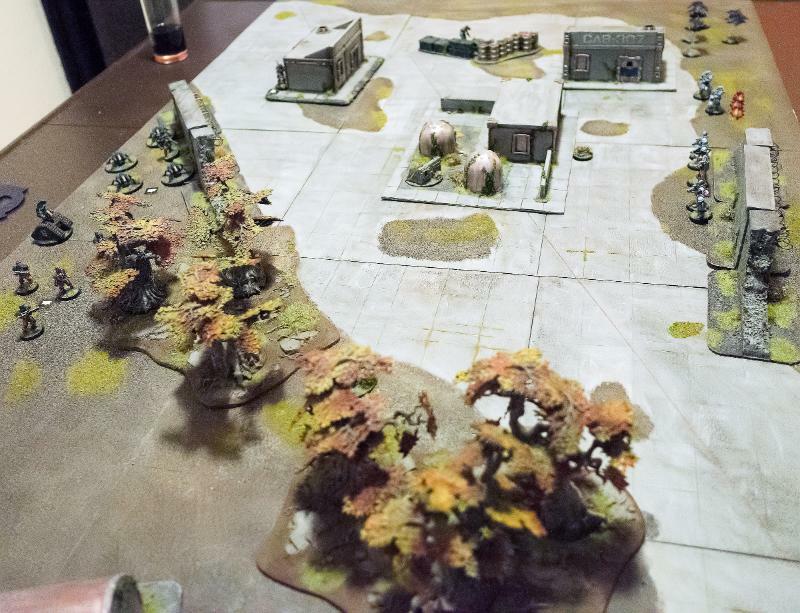 7th activation: the Tempests Hold and focused fire on the pinned Contractors in the woods, again 3 hits are discarded, but 1 explosive hit does 3 damage and kills a contractor. 6 STs are added (target, 3x cover, 2 from damage). Selecting a new target, the northern Scarecrow shoots the nimble enemy that just appeared and routed his flying robotic comrades. The Shadow Walker was too quick, though, and reached the safety of the ruins unscathed. 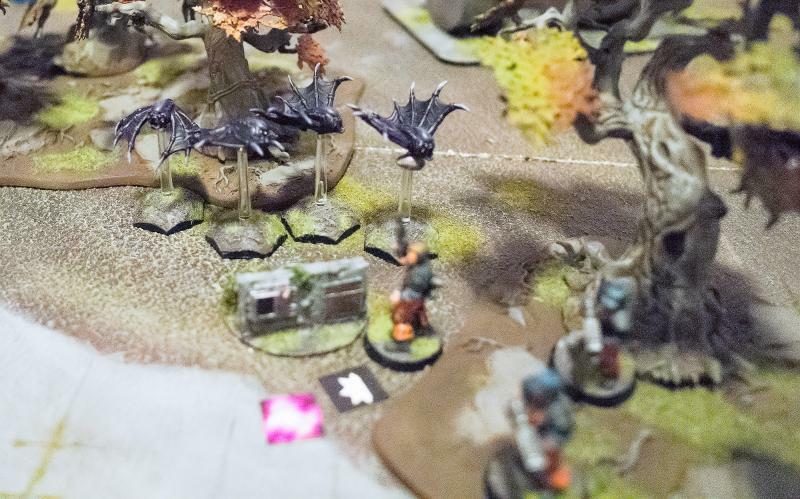 8th activation (no pic): The upper Scarecrow elects to Hold and Fire at the Shadow Walker, but the 1 sniper hit gets dodged by the Shadow Walker, who does suffer 2 STs. Witnessing the pinch his commander was in and longing to prove his mettle, the Apprentice Handler directed his Spiders to support his boss. Resolving to end the crossfire, he made his Drones target the troopers behind the crates. A hail of machine gun fire made them duck behind their cover and it looked like one of them was down. Job well done. 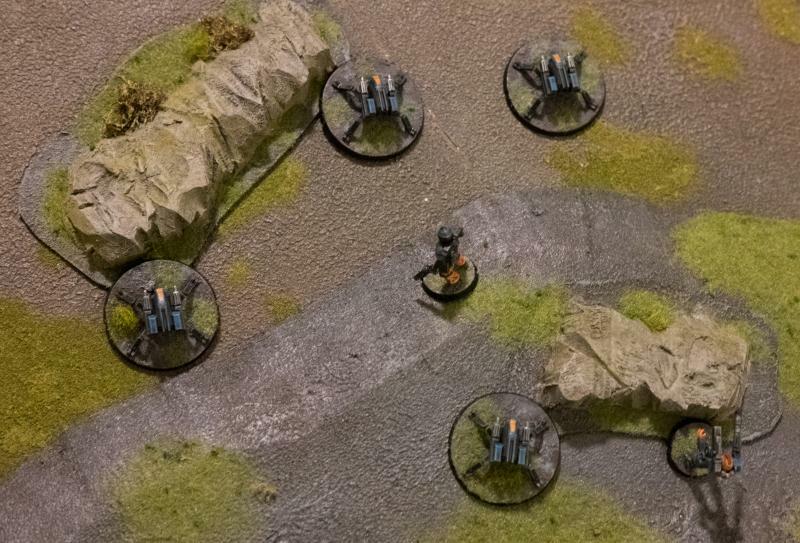 9th activation: The Spider Drones advance and Fire at the Assault Troopers, killing 1 and putting 5 STs on them. Myro was surprised by the sudden aggression of a group of tiny drones that was now seriously threatening his assault troops, who were ducking behind some barrels whilst they should be pressing on. Roaring at them to return fire, the troopers let loose with their pulse carbines and grenade launchers, making one of the drones explode in a cloud of metallic bits. 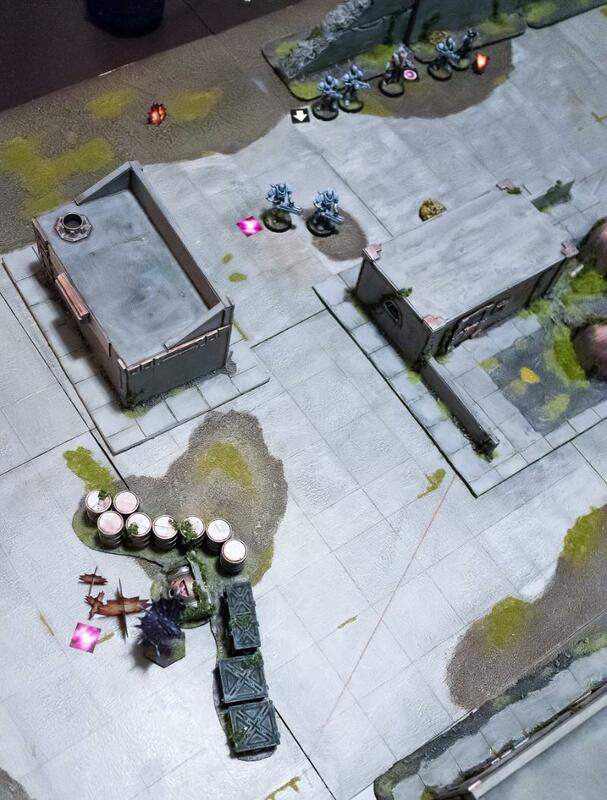 10th activation: The Troopers get an order, getting rid of 1 ST, they then pass their activation check, Advance and Fire at the Spiders, and destroy one, adding 4STs with the cover ignoring ripper grenade launchers. 11th activation: The automated relay does nothing. In the woods to the south, the Contractor team panics. 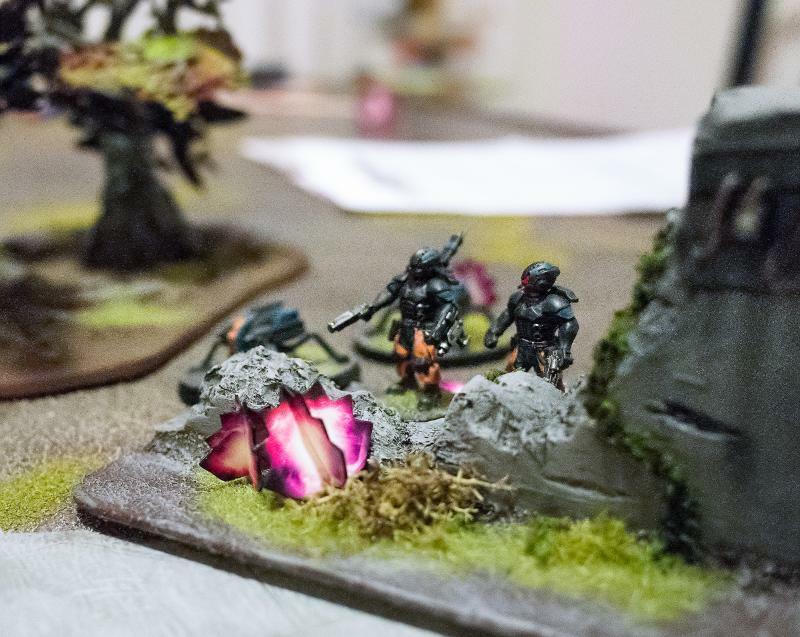 With two dead, aliens to their rear, their leader heavily suppressed in the front lines and a squad of heavily armoured warriors firing mortars at their positions, they determined it would be better to regroup somewhere safer, and hoofed it. 12th activation (no pic): The Contractors are shell-shocked, must retreat and have nowhere to run with the Minnows having flown behind them, so they flee the battle (ie: they’re casualties). Had they held on for a moment more, the Contractors would be heartened by the sight of the southern Scarecrow advancing to face the Minnows and barbecuing them with his clingfire sprayer. 13th activation: The Karists have no more units, but the Epirians still have 1 Scarecrow to use. 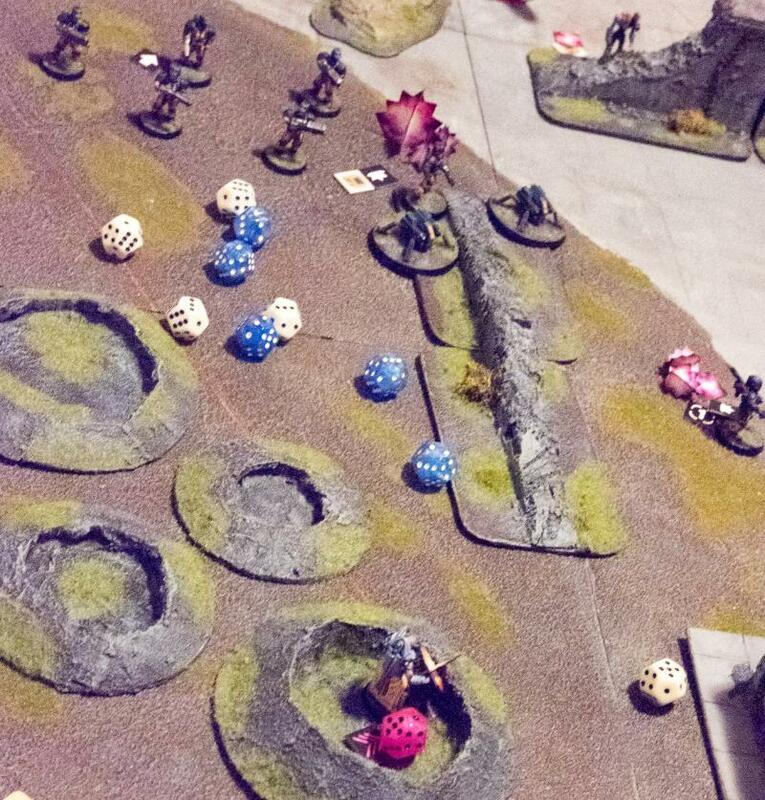 He Advances and Fires his clingfire sprayer over the pack of Minnows, doing only 1 damage, but putting 6 STs on them. That ends turn 2, with again 3 points for each side, making is 6 v 6. Overview since the previous overview image, so half of turn 1 and all of turn 2. In turn 3, the Karists again win the priority roll, giving it to the Epirians. Bacaro was at the point of despair, this was not going at all well. How many of them were in that compound? Contacting command, he reported heavy losses and no progress. Recognising the situation their Journeyman was in, Command responded with a change of orders: “Hold until relieved, further support has been mobilized and is on its way to your position.” If only he needn’t rely on humans in these situations… a couple of aliens show their face and the unit that was supposed to have his flank just runs off. That’s one issue you never had with robots. The Epirians use their automated relay to generate an extra CP, getting 6. The Karists have 5 CP this turn. They try to bring back an Angel as reinforcement, but the Epirians stop that, spending all their CPs. Poor Bard didn’t have the nerve to stay at disabling the terminal and was running for a crater. 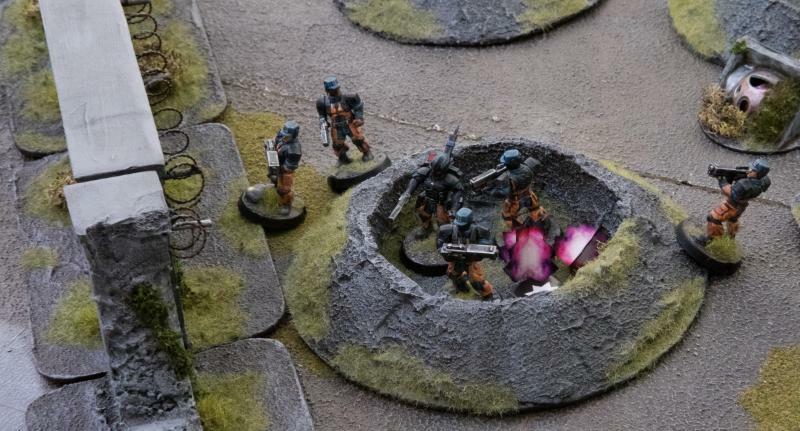 Acting on his new orders, Bacaro takes the rest of his shaken squad into the crater as well, orders them to take up positions and then directs their fire to support his Apprentice’s attack on the troopers to the north of the entrance. 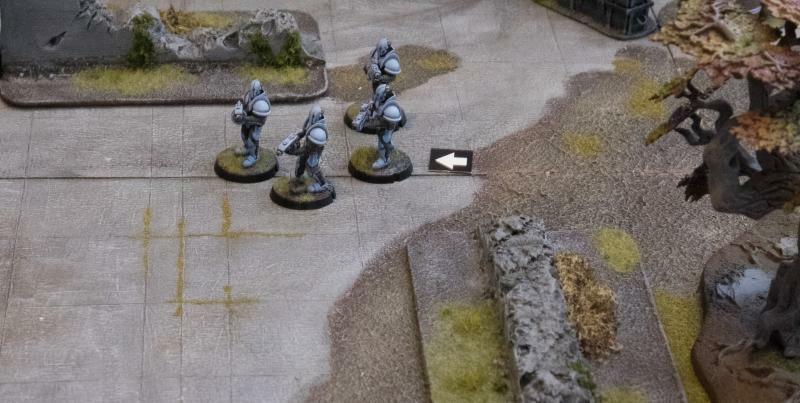 1st activation: The Bot Handler’s unit manages to activate on a 6, Dig In, and shoot at the Assault Troopers for 2 STs. Elyssa sees the threat her brothers below are facing, but keeps her priorities straight and activates her rift suit once again, teleporting down to the Cybel energy terminal. 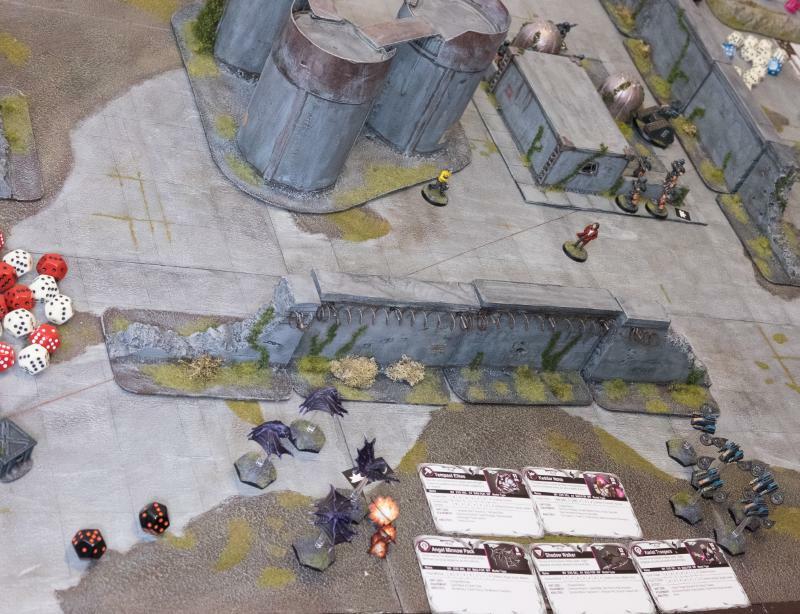 2nd activation: the Shadow Walker passes its activation check and teleport Dashes to the unclaimed refinery objective in the back of the field, then shakes off her STs. From the terminal, Elyssa sees the emergence of the Firefly Drones that have apparently re-joined the fray. To her horror, she watches the little Drones fly right over the Assault squad at high speed, dropping a load of fire bombs over her brothers. They never had a chance. She watched three of them burn up whilst the last remaining Trooper runs off in the direction of the ruins. 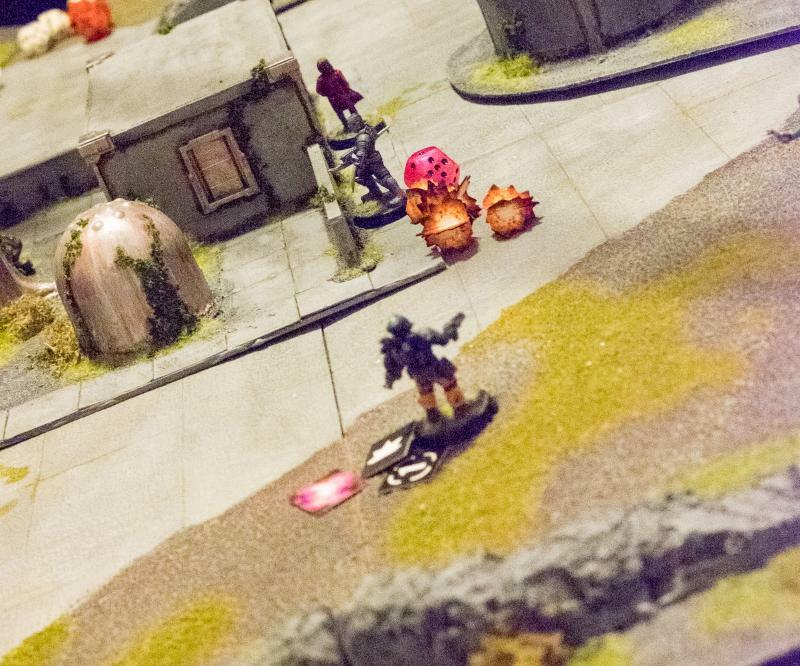 3rd activation: the Firefly Drones Dash and make a hit and run at the Assault Troopers. Defensive fire generates a lot of pistol shots, but only 1 hit, that gets dodged. The Clingfire Pods on the Drones do 14 hits, causing 7 damage which kills 3 Troopers. A very nasty run! On the other side of the field a similar scene takes place as the Scarecrow keeps pouring clingfire on the flock of aliens. 4th activation: the clingfire Scarecrow burns the Minnows again for 3 STs. Screeching at the robotic flamethrower, the Minnows turn tail and fly into a crater. 5th activation: the Minnows perform a Shaken action, retreat into a crater, become pinned, and shake off their STs down to 4. 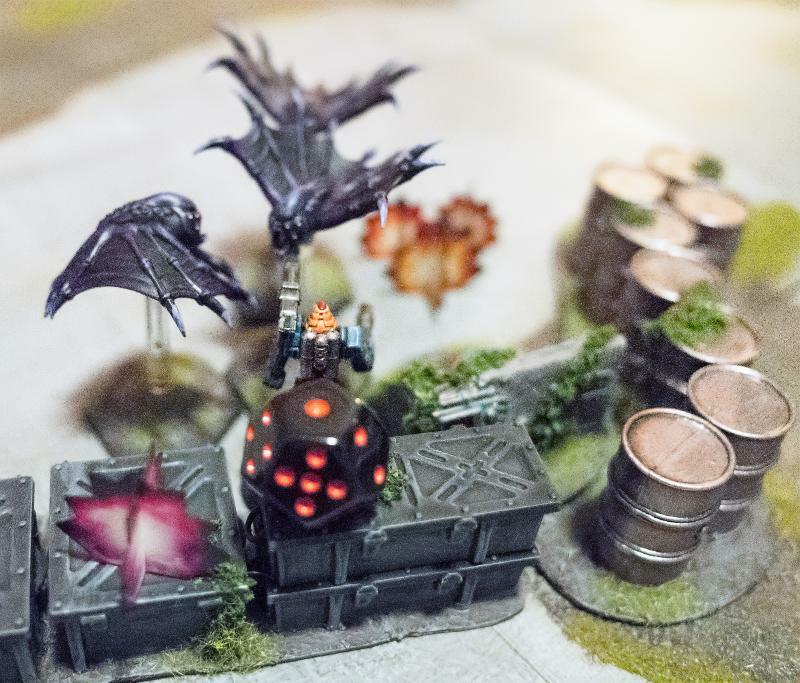 Unsure of the cause of the giant conflagration from behind the row of barrels hiding his target, the Apprentice Bot Handler leads his Spiders into a crater, whilst he himself undertakes to finish the work Bard started on the terminal. 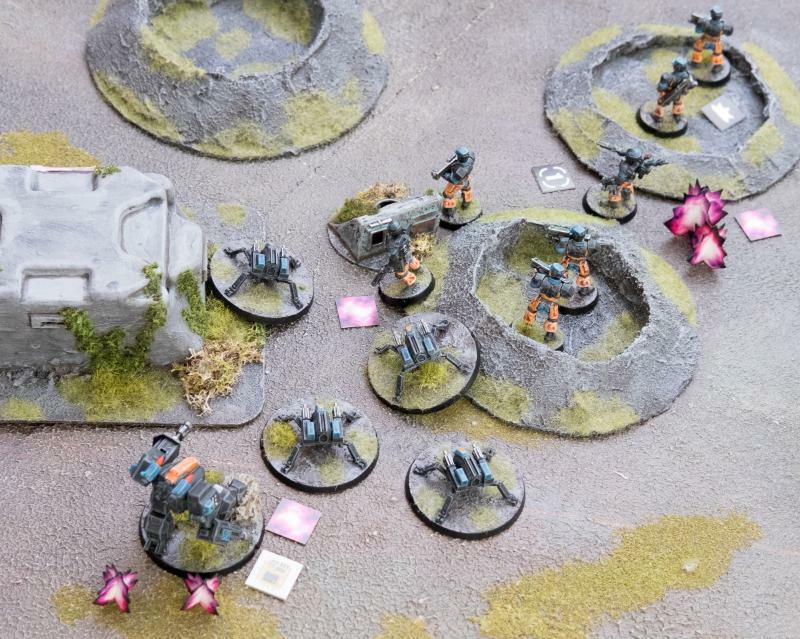 6th activation: the Spider Drones fail their activation check, perform a Shaken action and retreat, becoming pinned and getting rid of all their STs. Meanwhile the Hunter, now unguided, takes cover behind the bunker and opens fire at the Troopers protected by a shimmering field. His shots hit their mark, but the field is too powerful. 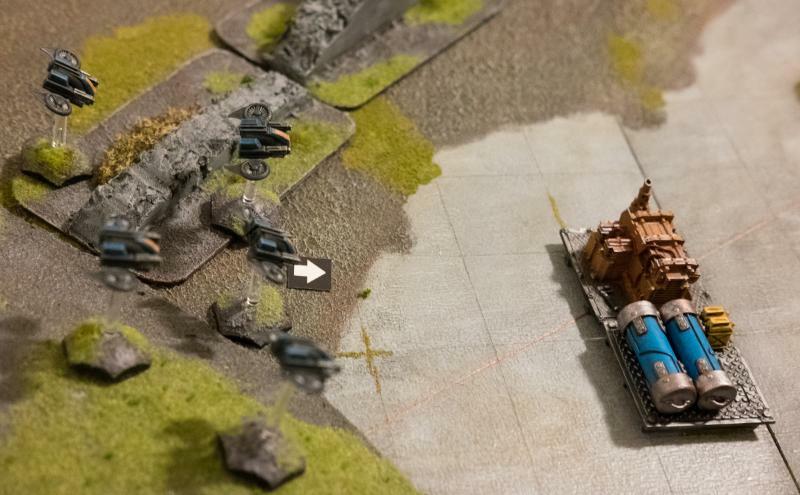 7th activation: the Hunter also fails to activate and Digs in, firing wild at the Kaddar Nova. Being protected by a field, the unit just takes 2 STs. 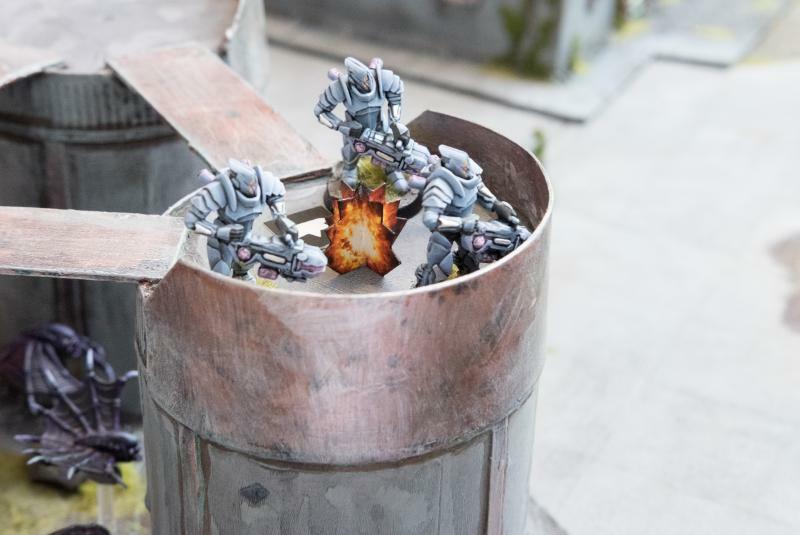 The Tempests on top of the silo watch the Epirian leading squad fall back into a crater and sense an opportunity. 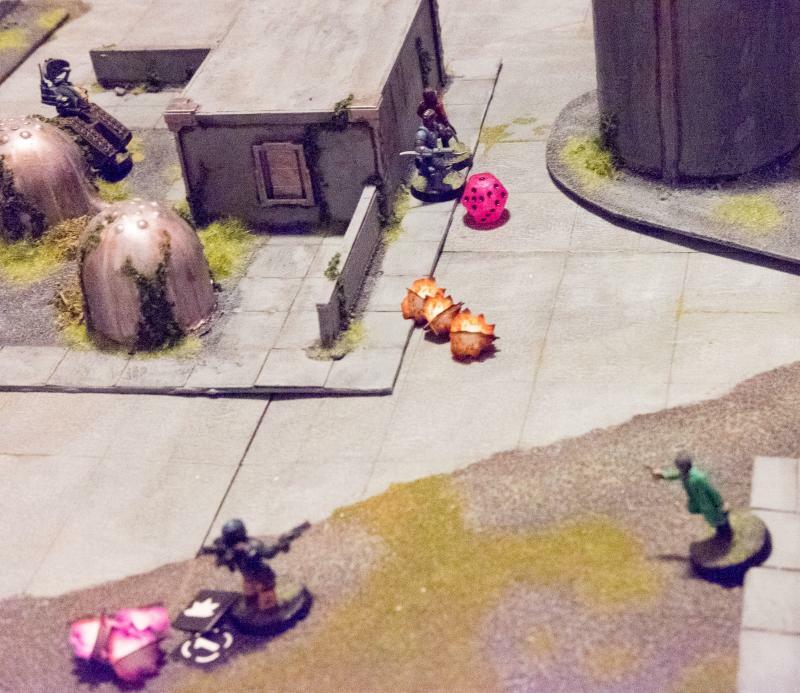 In their current clumped up position the squad is extremely vulnerable to their mortar fire. Moments after they fire their explosive payloads, the crater erupts in purple fire. It’s a terrible thing, reflects the Tempest leader, but the cause demands it. 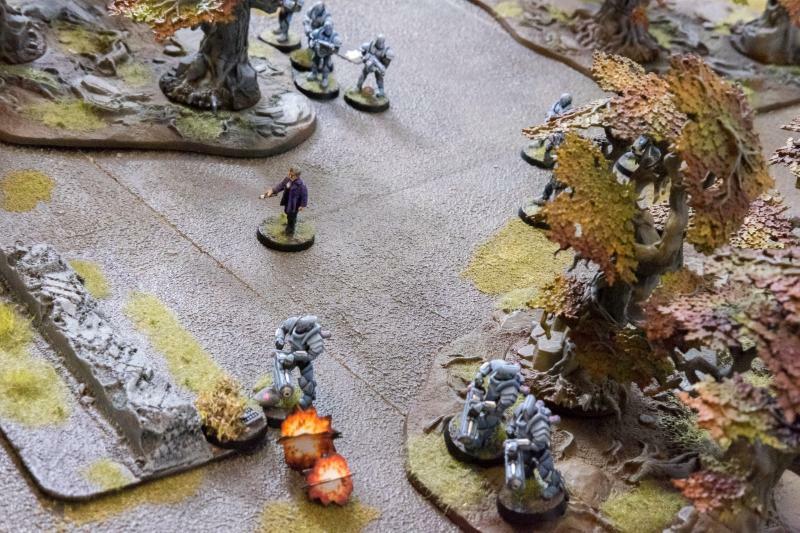 8th activation: the Tempests Hold and Fire at the Bot Handler’s unit. Clumped in the crater, they suffer a lot of Hellstorm shots. 3 Contractors are killed, and they take 8 STs. 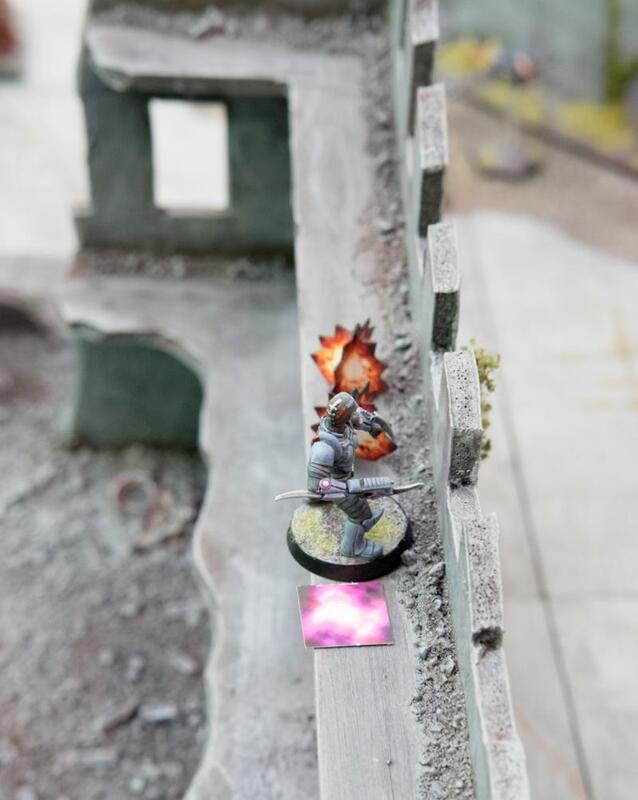 A true hero, the last remaining member of the Assault squad that got covered in sticky fire reached the ruins and recovers his nerves, standing in resolute defiance, emboldened by his faith. 9th activation: The single remaining Assault Trooper retreats, taking cover in the ruins and shaking off 6 STs. The Scarecrow in the north has now positioned itself so that its field of view comes around the wall into the compound. It too targets the shimmering field near the entrance, but again, it is too powerful to penetrate. 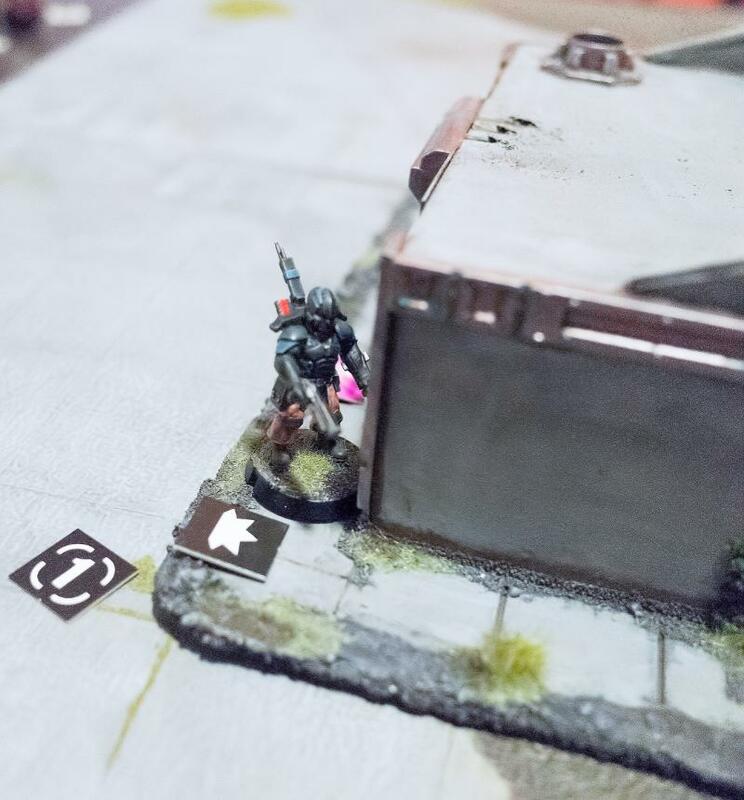 10th activation: the upper Scarecrow Hold and Fires at the Kaddar Nova and his unit. Their cover is denied as the wall they’re hiding behind doesn’t block line of sight from the Scarecrow, but the Nova’s field allows them to discard all hits, taking 3 STs. 11th activation: the relay does nothing. 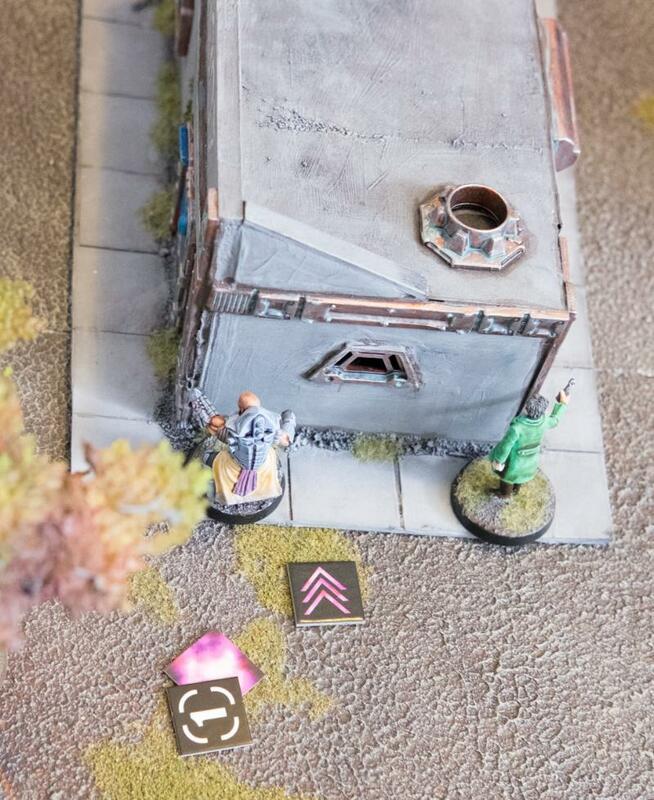 Under fire from both corners of the field, the Kaddar Nova blesses his foresight as the field generated by his reactor absorbs hit after hit. Consolidating his position, he orders his brothers to open fire at the largest robot in the field. At least one of their shots must have hit a vulnerable part of the hulking machine, as it’s now emitting a black cloud of smoke. 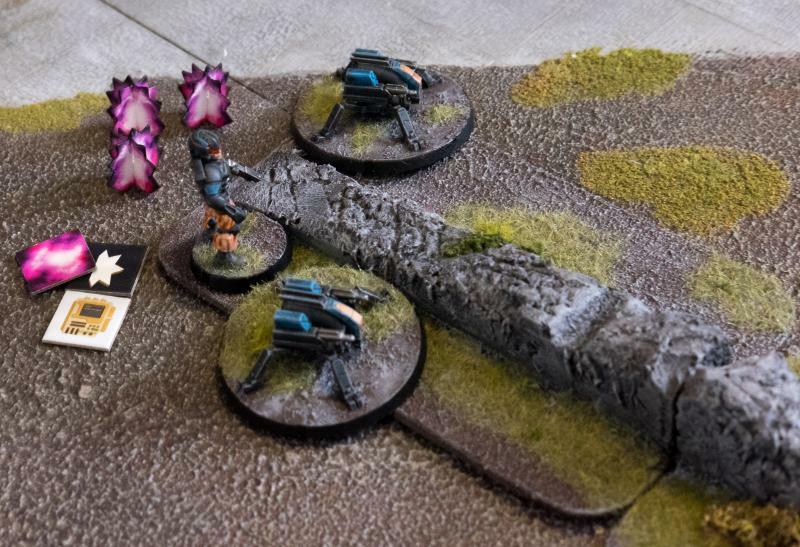 12th activation (no pic): the Kaddar Nova actually fails his activation check and Digs in, putting 3 damage on the Hunter, dropping its FOR by 1 and putting on 4 STs, then shaking off all their own STs. An eventful turn, which really shows how badly the Epirians needed the command tokens they all spent on blocking the return of the Angel. 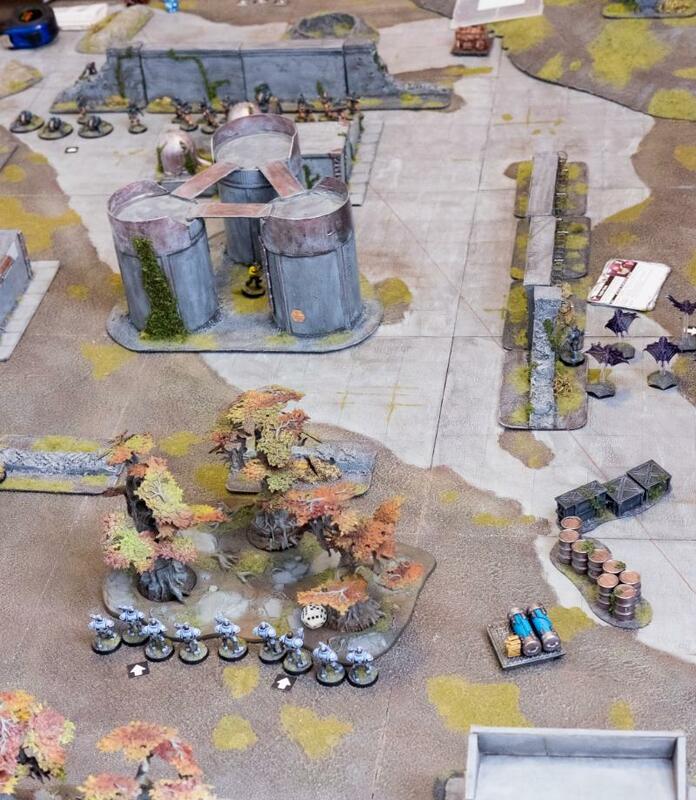 The Epirians score 2 points for the one refinery, whilst the Karists score 4 for two refineries, having been forced off their faction objective. In Turn 4 the Epirians win the priority roll and give it to the Karists. Using the relay’s ability, the Epirians generate 7 CPs, the Karists’ total is also 7. They bid 5 for bringing back the angel which the Epirians counter with 0, meaning it will be back this turn. The Tempest Elites waste no time after cooking the enemy leader. The Firefly Drones that burned three of their brothers are clearly too much of a threat to be left unchallenged. Once more their Hellstorms explode into action and absolutely eradicate the tiny hovering machines. 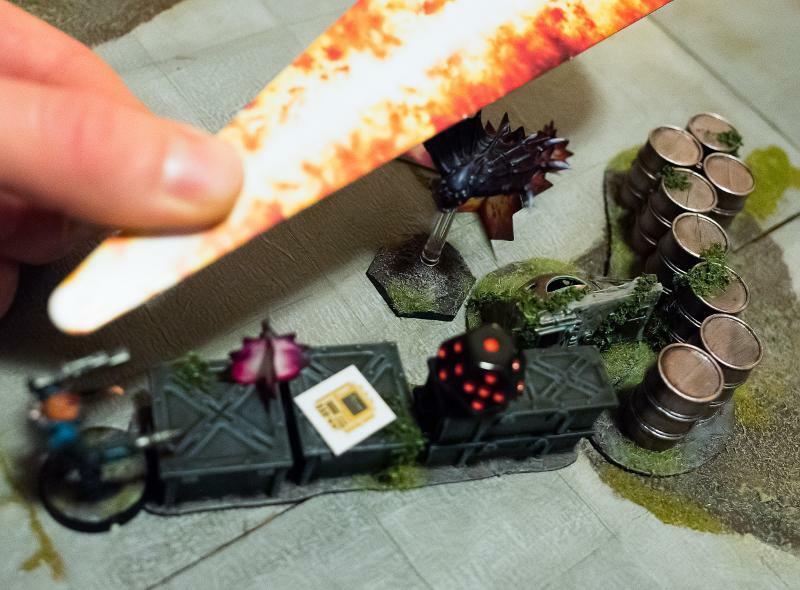 1st activation: the Tempests Hold and Fire at the fireflies, causing 4 pens that destroy 4 drones, and causing a massive 10 STs. With his final hopes dashed, Bacaro shouts to his unharmed Contractors to help pick up the wounded and fall back into the woods. When Hold until relieved in fact means Hold until destroyed, it’s quite clear where his duties are. 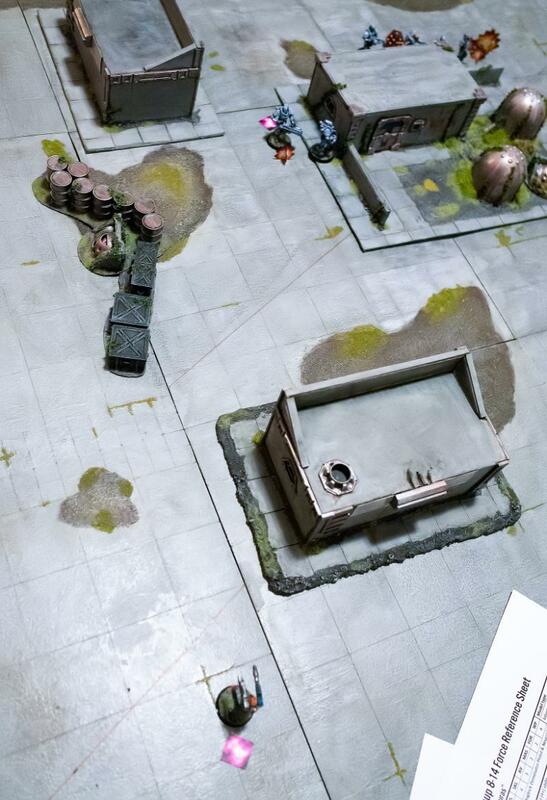 Loosing a few covering grenades into the Compound, Bacaro orders his force to retreat. 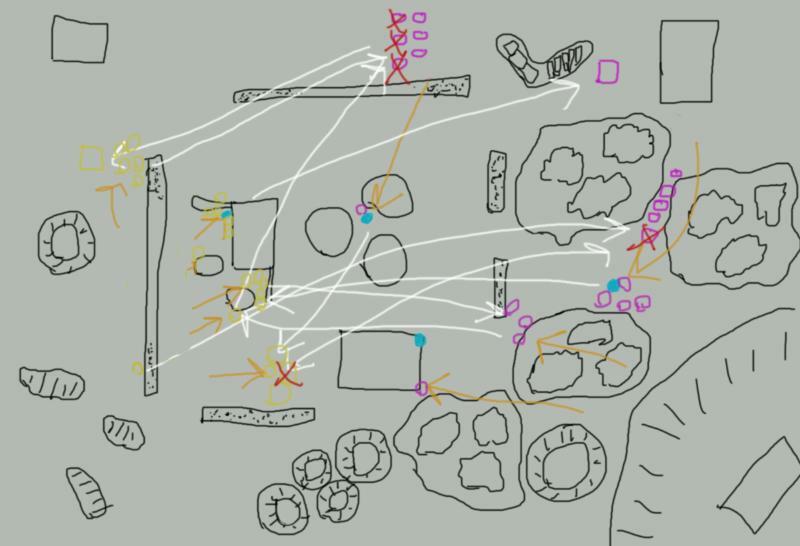 2nd activation: the Bot Handler orders his own unit around and removes 6 STs, but the unit still fails its check, performs a Shaken action and, firing wild at the Nova’s unit, puts 2 grenade hits on them which get discarded by their field. As Myro switches off his reactor, he cannot but feel proud of his achievement today. No doubt the Epirians will be back in numbers soon, but now at least he has time to collect whatever energy is here and build a united front from which to start the process of enlightenment. Today was a good day. As he turned his head, he saw the familiar form of Voxai gliding towards him over the compound buildings. These creatures never stopped to amaze him. Surely they, if nothing else, were proof of the divine quality of the Maelstrom. This being a teaching game it had run for quite a while and we ran out of time. Judging the situation, the Epirian player decided to yield at a final score of 10VPs for the Karists and 8 for the Epirians. With the alternating activations, this game gets really interesting really fast. Command points / orders can really make the difference when you quite need a suppressed unit badly. Putting the commander smack bang in the line of fire was perhaps a poor choice for the Epirians. Losing the big Angel fast was a blow for the Karists, but it did cause a bit of a stir on that flank and distracted the Epirians from the rest of the Karist force. The Firefly bombing run was also quite epic, and the Tempest’s Hellstorms can do frightening amounts of damage. Yeah, really cool first game and looking forward to more!